On 1 December 2006, at the symposium Wolfgang Amadeus Mozart: Die Zauberflöte: sources – interprétations at the Université libre de Bruxelles, I presented a paper titled "New Archival Documentation on the Theater auf der Wieden and Emanuel Schikaneder". Two years later I published an extended translation of this paper, titled "Neue Forschungsergebnisse zum Theater auf der Wieden und Emanuel Schikaneder" in: Wiener Geschichtsblätter, 4/2008, (Vienna: Verein für Geschichte der Stadt Wien, 2008, 15-36). Since a major part of my essay consisted of delving into the social environment of Schikaneder and his wife, I came across a surprisingly large number of godchildren of the Schikaneder couple. These children came from different backgrounds, not only from families whose contact with Schikaneder was known, but also from families that had previously not been associated with the theater entrepreneur. When I did research for my paper for the 2006 conference in Brussels, I found twelve godchildren of the Schikaneders. By the time I published the German article in 2008, this number had increased to fourteen. On the occasion of the belatedly projected publication of the 2006 conference report by the publisher Peter Lang, I decided to revisit this topic. I undertook another search to update my work and extended my research concerning the parents of these children. It is to be noted, however, that certain limits had to be observed regarding this research. If every lead were followed and every source published, this project could easily result in a book which is of course not the objective of this blog. In 1779 Schikaneder fathered a son with the actress Juliana Moll who was born on 15 March 1780 in Laibach. To spare himself any possible embarrassment Schikaneder asked Jacob Neukäufler, another member of his company, to confess to the paternity. This scheme did not keep Schikaneder and his wife from standing joint godparents at the child's baptism. At the ceremony, which took place at St. Peter's Church in Laibach, they had themselves substituted ("per procuratorem") by the actor Johann Michael Michl (born 1754 in Neumarkt) who had joined Schikaneder's company in 1778 in Nürnberg. 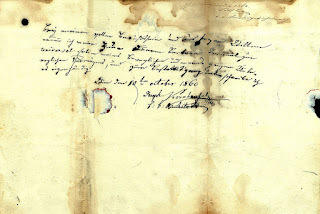 The entry concerning the baptism of Schikaneder's son Emanuel Jacob Neukäufler on 15 March 1780 in Laibach (Ljubljana, Nadškofijski Arhiv, Liber Baptizatorum 23, 1775-8, 195, St. Peter). The actor Michael Michl's name is misspelled "Mihel". Baur 2012 states that the note "fil: leg:" (legitimate son) in this entry is written by a different hand in a different ink, but this claim is based on a misunderstanding. In September 1780 Schikaneder's company arrived in Salzburg where his illegitimate son Emanuel Jacob died on 10 January 1781. Schikaneder's ruse would never have become known, had not Neukäufler, in a phase of bad conscience, confessed to the parish priest of St. Andrä that he was not the child's father. The priest wrote a note on a piece of paper which he put into the death register and added the following reference to the entry concerning the child's burial: "sed si necesse, vide Secretum ad hunc Librum" (but if necessary, see the secret note in this book). 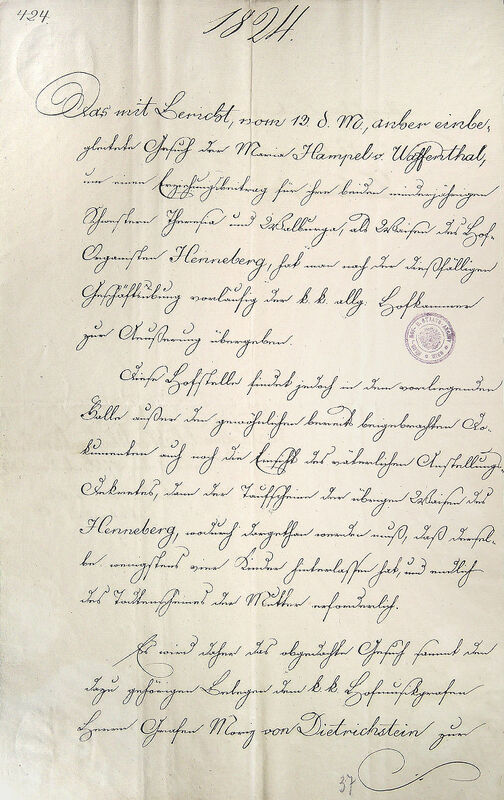 In 1935 the Salzburg historian Friedrich Breitinger (1887-1966) found the loose piece of paper ("Secretum pro Libro mortuorum") in the parish register and on 31 August 1935 published the whole story under the title “Emanuel Schikaneders Kuckucksei" (Schikaneder's Cuckoo's Egg) in the Salzburger Volksblatt. The secret note has gone missing since then. In his article "Emanuel Schikaneder and Jakob Neukäufler: Family Affairs", Mozart Studien 17 (Tutzing: Schneider, 2008) the American singer Henry Price presented a highly interesting account of the affair. Joseph Hofer, a previously unknown nephew of Constanze Mozart, was born on 17 May 1789 at the house Stadt 587 (today Graben 26) and baptized at St. Peter's Church with Eleonore Schikaneder standing godmother to the child. Joseph Hofer was the first child of the court violinist Franz Hofer (1755-1796) and his wife Josepha, née Weber (Mozart's first Königin der Nacht). Constanze Mozart's favorite midwife Maria Anna Kaudelka, who lived at Stadt 882 (the Trienterhof, today Domgasse 4), served as midwife. 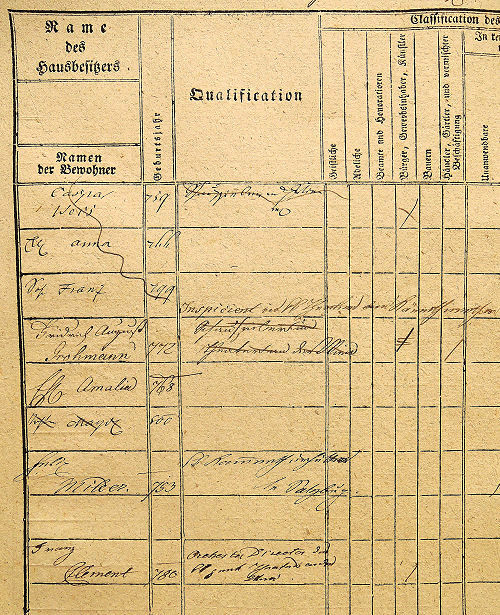 The child's father Franz Hofer is given as "Hofmusikus" in the baptismal records, the mother is referred to as "Kurpfälzischen Kammervirtuosens Tochter", and the godmother Eleonore Schikaneder as "Aktrice[!] von der Schauspielergesellschaft auf der Wieden". That I was able to discover Joseph Hofer's existence only in February 2017, was mainly caused by the fact that this child's baptism does not appear in the old, original baptismal register of St. Peter's. 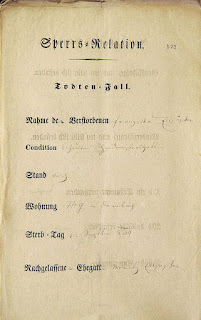 The last to delve into Franz Hofer's family was Emil Karl Blümml who published the following two articles about Hofer and his wife in the 1919 Mozarteums-Mitteilungen: 1) "Josefa Weber-Hofer. Die erste 'Königin der Nacht'", and 2) "Der Violinist Franz de Paula Hofer. Freund und Schwager Mozarts". In 1923 these articles were republished in Blümml's book Aus Mozarts Freundes und Familienkreis, a collection that is still one of the most frequently cited sources related to Mozart's circle. Some of the false stereotypes coined by Blümml, such as the "wicked mother-in-law Maria Cäcilia Weber", the "uneconomical housekeeping of the long-sleeping Weber sisters", and the "grinding poor Franz Hofer", will probably live on forever in the Mozart literature. Because Blümml convincingly stated that Franz and Josepha Hofer had only one child – the daughter Josepha who was born on 29 August 1790 in the Freihaus – it occurred to nobody that there could have been another child. Franz Hofer and Mozart's sister-in-law Josepha Weber got married on 21 July 1788 in the Eligius Chapel of St. Stephen's Cathedral. The following entry in the Cathedral's original Rapular concerning this wedding has never been digitized or published. 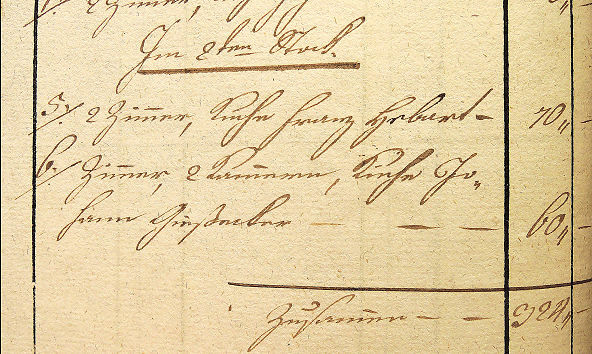 Unlike the one that Blümml referred to, it bears the autograph signatures of the two witnesses: Johann Thorwart (who in 1782, at her wedding, had been Constanze Mozart's witness) and the lawyer (and future convict) Dr. Jakob Ignatz Jutz (1755-1796). When Deutsch claimed that Hofer became a court musician only in 1789 (Dokumente, 282), he had obviously forgotten that Blümml had already confirmed Hofer's employment as having begun in 1788 (Blümml 1923, 28). The fact that Franz Hofer was already a member of the court orchestra in 1782 was published in 1992 by Dexter Edge (Edge 1992, 72). At the time of her wedding in 1788, Josepha Weber was living together with her mother and her sister Sophie at the house Stadt 1084, "Zur Goldenen Schlange" ("At the Golden Snake", today Kärntnerstraße 12) as subtenants of the physician Lukas Johann Boër. Dr. Boër (1751-1835) was a gifted amateur musician (he owned a quartet of string instruments) who in 1793 married Valentin Adamberger's sister-in-law Eleonora Jacquet (St. Augustin 4, fol. 68). Blümml paints an idyllic picture of how "right after the wedding the newlyweds [the Hofers] moved to the Starhembergisches Freihaus auf der Wieden" (Blümml 1923, 126), but the sources reveal a different course of events. 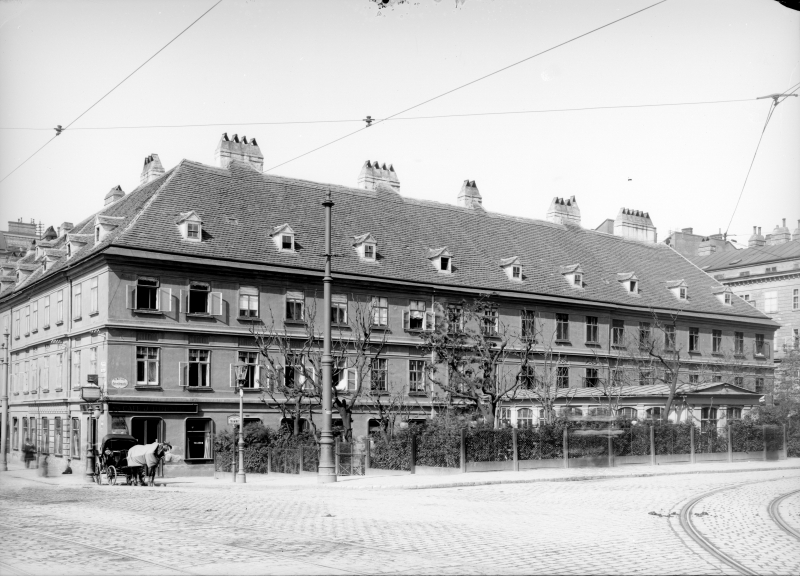 First, Josepha Hofer moved in with her husband at Stadt 587, into an apartment on the fifth floor that consisted of three small rooms and two chambers. This abode had to be shared with Franz Hofer's older sisters Josepha and Ludwiga and their father Markus Hofer whose annual salary of 225 gulden as violinist at the Cathedral did not cover the total rent of 250 gulden. Second, Josepha Hofer's move to the Freihaus auf der Wieden took place only after May 1789. After having been hired by Johann Friedel in 1788, she appeared on the Wieden stage until 21 February 1789, when she performed as the daughter-in-law in the singspiel Die schlaue Nanette, oder: die Katze läßt das Mausen nicht for which she received a positive review in the Kritisches Theater-Journal von Wien. Because in 1789 Lent began on 25 February and theaters had to take a break until Easter (which fell on April 12th), this may well have been Hofer's last appearance before the birth of her first child on 17 May 1789. It can be ruled out that Josepha Hofer took part in the performances of Die Entführung aus dem Serail at the Freihaus that were announced on 30 April 1789 in the journal Der Wienerbothe. At that time Eleonore Schikaneder had already taken over the administration of the theater from her colleague Johann Friedel who had died on 31 March 1789 of tuberculosis at the age of 38. In summer 1789 Franz and Josepha Hofer must have moved from Markus Hofer's apartment on the Graben to the Wieden. It can not be determined if they moved to Wieden 362 (today about Operngasse 8), or if they moved to the Freihaus immediately and put their newborn son into foster care at Wieden 362, a house that was located very close to the theater. The southern part of the Freihaus on the Wieden with its theater wing. 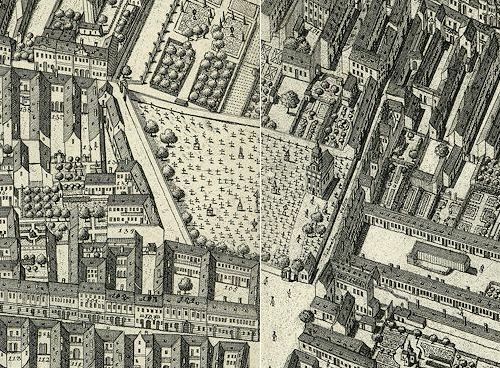 The house Wieden 362 (bearing its last number 778 on this map) is in the Adlergasse at the lower center (Robert Messner, Die Wieden im Vormärz, Vienna: Verb. d. wiss. Ges. Österreichs, 1975). On 27 October 1789 the violinist Joseph Mayseder was born in this house. The number "363" in Mayseder's baptismal entry is a mistake (St. Karl, Tom. 2, fol. 180). Eleonore Schikaneder's godson Joseph Hofer died on 23 August 1789 of "Fraißen" (fever cramps) at the house Wieden 362. On the following day the child was buried in the Matzleinsdorf Cemetery. The ceremony, which cost 90 kreuzer, is documented in the Bahrleihbuch of St. Stephen's Cathedral. Franz and Josepha Hofer's second child Josepha, whose godfather was Schikaneder's business partner Joseph von Bauernfeld, was born on 29 August 1790 at the Freihaus. She became a piano prodigy and opera singer. On 7 January 1813 she got married to the "k.k. Hofkammer-Buchhalterey-Accessist" Karl Hönig (1789-1832). The information (probably concocted by Karl Maria Pisarowitz) that Josepha Hofer's husband was the exchange commissioner Karl Hönig von Henikstein (MBA VI, 331) is false. Franz Hofer died on 14 June 1796 of "Brand" (gangrene) in the house Penzing 19 (today Penzinger Straße 35). He was buried two days later in the old Penzing cemetery which was located around the church of St. Jakob. Only a small number of sources related to the Hofer family can be presented here, because they are part of a different and much more detailed research project that cannot be covered in a blog post. Jakob Haibel's daughter Eleonora was born on 26 June 1789 at Wieden 260 (today Margaretenstraße 30) and baptized by Franz Cantes in the Paulanerkirche, the Wieden parish church, with Eleonore Schikaneder officiating as godmother. There are two entries in the Wieden church records concerning this event. In the earlier one the father is referred to as "Jakob Heübel ein SchausPieler" and the godmother as "ma[tri]na Eleonora Schikanederin". Eleonora Haibel died on 1 October 1789 of “Gedärmbrand” (intestinal inflammation). She had been living in foster care at "The Golden Lamb", at Neustift 55 (today Neustiftgasse 77). The entry in the municipal death register concerning the death of Eleonora Haibel on 1 October 1789. Jakob Haibel is referred to as "Sänger am Friedlischen Theater" (A-Wsa, Totenbeschreibamt 91, H, fol. 47r). At a cost of 30 kreuzer Eleonora Haibel was buried in the old St. Ulrich cemetery. There's a small problem in connection with Eleonora Haibel's first name, because the sources show that she had an older sister who was born in 1785 and died on 30 September 1793 at the "Golden Capon", at Wieden 6. According to the records related to her death and burial, this girl's first name also was Eleonora which appears to reveal a mistake in the sources. Haibel certainly did not have two daughters of the same name at the same time. It is not known when and where Jakob and Katharina Haibel got married. One of their children, Antonia, who may have come to Vienna with her parents, died on 5 September 1789 at Wieden 260, at the age of 15 months. 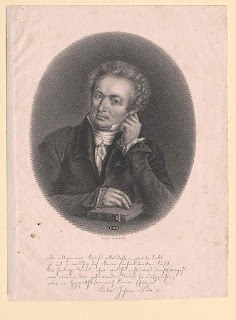 As of 1789 Haibel worked for Schikaneder as a comedian, actor and singer of tenor roles, among them the role of Monostatos in the 1798 production of Das Labyrinth, the sequel of Die Zauberflöte. Haibel supplied the theater with singspiele and incidental music. His most successful work was Der Tyroler Wastl (with its still popular song "Die Tiroler sind lustig"), based on a libretto by Schikaneder, which was performed 118 times at the Wiedner Theater. This number was only surpassed by the 223 performances of Die Zauberflöte. Nachgelassene Ehegatt Jakob Heibel, welcher sich noch vor Absterben seiner Ehewirthin mit nachbenannt seinem leibl:[ichen] Kinde auf das Land, dessen Ort aber namentlich nicht angegeben werden könnte, begeben hätte. Husband Jakob Haibel who already, before the death of his wife, has left for the country with the undermentioned legitimate child, the name of which location can not be determined. The note concerning the absence of Katherina Haibel's widower in her Sperrs-Relation (A-Wsa, Mag. ZG, A2, 2312/1806). Haibel and his first wife had a least six children of which in 1806 only Rosalia, born 16 February 1794 (St. Karl, Tom. 3, fol. 100), was alive. Haibel’s alleged disappearance before the death of his first wife, which (based on Anton Schmid's notes in A-Wgm) is also addressed in Wurzbach's Lexikon (vol. 7, 203), suggests that he started his relationship with Sophie Weber while his first wife was still alive. New archival discoveries shed more light on the course of events. In 1798 Haibel bought a small house and two pieces of land in Obermeidling from the theater entrepreneur Franz Scherzer who in that year left Vienna to take over the theater in Znojmo. Haibel had become acquainted with Scherzer, because in 1797, at the time of his second wedding (St. Karl 3, fol. 46), Scherzer had worked for Schikaneder as stage manager at the Wiednertheater. This important detail in Scherzer's biography completely escaped Gustav Gugitz's attention (Blümml & Gugitz 1925, 271-307). Haibel's house was "An der Schönbrunner Gartenmauer. Das vormahlige K.K. Militair Wacht Häusl ober der Eisgrube", i.e. the former military guardhouse above the ice pit, at the wall of the gardens of Schönbrunn Palace (today Grünbergstraße 18, now replaced by a building from 1966). Together with the house Haibel also purchased two pieces of land beside the house: a garden of 100,5 square Klafter (361,3 m2) and a bigger piece of land (Meidling No. 52) "for the building of lodgings for the janitor and the enlargement of the aforesaid house and garden" (A-Wsa, Patrimoniale Herrschaften B20/96a, 123). 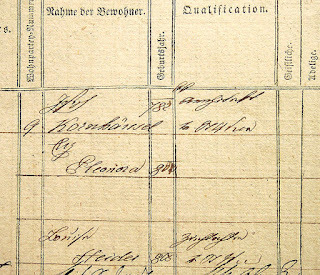 The entry concerning the owners of the house Obermeidling 31 between 1796 and 1849 in a Klosterneuburg land register (A-Wsa, Grundbuch B20/96a, 121). The list of owners begins with Scherzer, followed by Haibel. In 1849 the "Villa Metternich" (as the new building was called then) was bought by the steamship entrepreneur Joseph John Ruston, the great-grandfather of Audrey Hepburn. 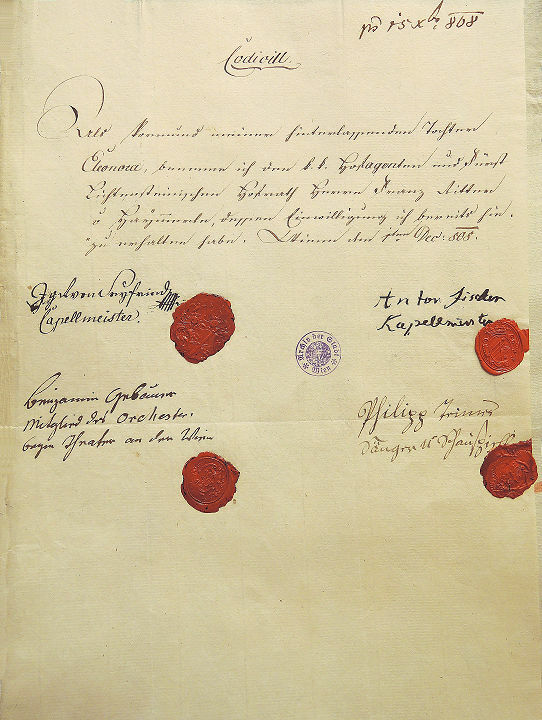 Ruston's name appears in this document above the entry in red ink. In 1805 Haibel sold his house and gardens to Princess Maria Beatrix von Metternich-Winneburg, née von Kageneck (1755-1828) who had the house rebuilt into a villa. On 5 March 1806 Constanze Mozart already knew of her sister's marriage plans, when she wrote to her son Karl: "Sophie, who at Easter is going to marry Mr. Haibel, unites her wishes with mine" (Schurig 1922, 30). It is very telling that Haibel married Sophie Weber not in her home parish (as it was customary), but in his new hometown Đakovo. Haibel's early departure from Vienna may also have been caused by a lawsuit that he was facing, after he had taken a mortgage on a house in Klosterneuburg which he was unable to pay. 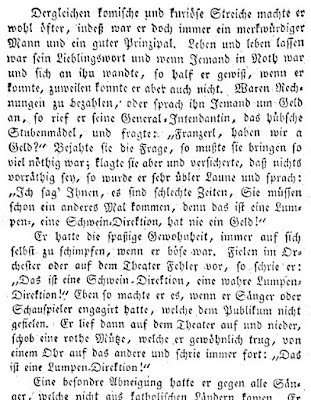 In January 1807 the lumber trader Mathias Schauenstein, a real estate owner who lived on the Alsergrund, published an ad in the Wiener Zeitung, titled "Erinnerung an Jakob Haibel", in which he informed Haibel of the pending lawsuit and requested him to come forward and pay a debt of 1,000 gulden. Haibel was obviously planning his move to Croatia at a relatively early point of time. As of 1799 (under pressure from his creditor Martin Kollmann whom he owed 1,224 gulden) Haibel was suing several people at the Vienna civil court to scrape together money that they owed him. 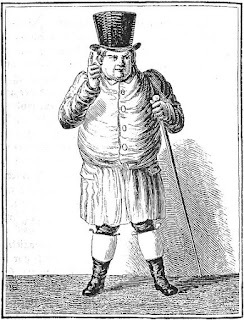 Among these debtors were the dancer Franz Kees, the actor Heinrich Herbst, the prompter at the Burgtheater Franz Schrensner (who in 1794 had already been second prompter at the Wiednertheater), the playwright Joachim Perinet, the Kapellmeister Franz Teyber, and the clarinetist Johann Stadler. A lot of research remains to be done concerning Haibel's financial situation, the circumstances of the purchase of his two houses and his departure from Vienna. A more detailed exploration of the sources in the archive of the Klosterneuburg Monastery is part of a different, more extensive research project. Franz Xaver Gerl's first child Eleonora was born in the house Wieden 102 and baptized on 1 January 1790 in the Karlskirche, with Eleonore Schikaneder officiating as godmother. 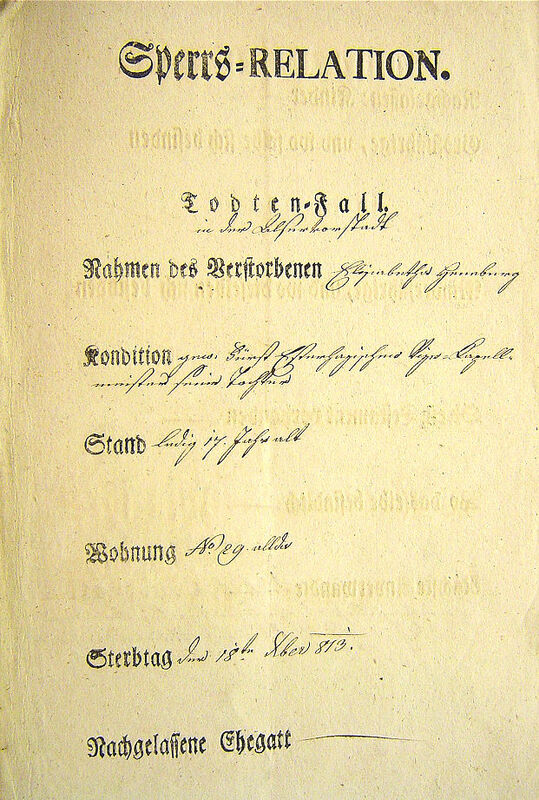 The entry concerning the baptism of Eleonora Gerl on 1 January 1790 in the Karlskirche (St. Karl, Tom. 3, fol. 1). The godmother is given as "Ehegattin des H: Schikaneder Directeurs vom Theater im Freÿhauße". Because he never saw the original source, Orel (1957, 221) gives a wrong date of birth and a wrong name of the officiating priest. Orel's claim that the house number 102 "is a mistake and should read 103" is unfounded. There is no reason to doubt the sources. That in 1790 Gerl lived at Wieden 102 (today Schleifmühlgasse 18) can hardly have been a coincidence. A newly discovered source shows that this house was also the residence of the actor and librettist Karl Ludwig Gieseke who was a member of Schikaneder's theater company. The municipal tax register lists Gieseke as tenant of apartment No. 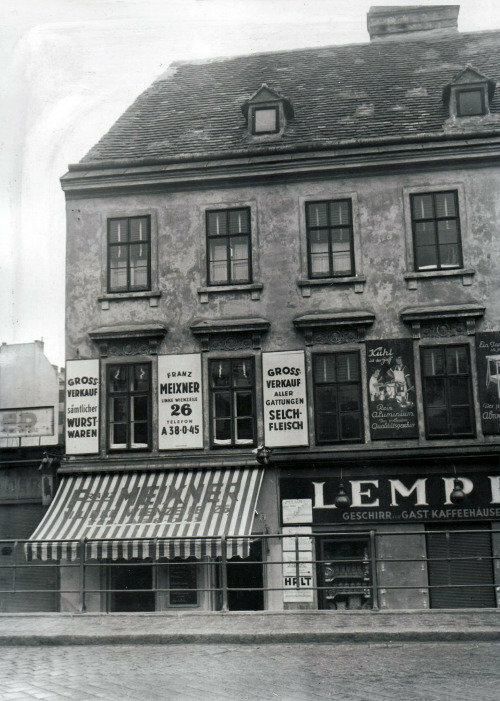 6 of this building which at that time belonged to the tobacco dealer Anton Krieghammer. In 1791 the house Wieden 102 was bought by Gieseke's friend and colleague mineralogist, the mineral dealer Johann Weiß (1749-1812) (Hofbauer 1864, 307). In 1796 the actor Kaspar Weiß lived in this house (see below) and from 1798 until 1800 Gerl's and Gieseke's colleague Matthäus Stegmayer also lived there. 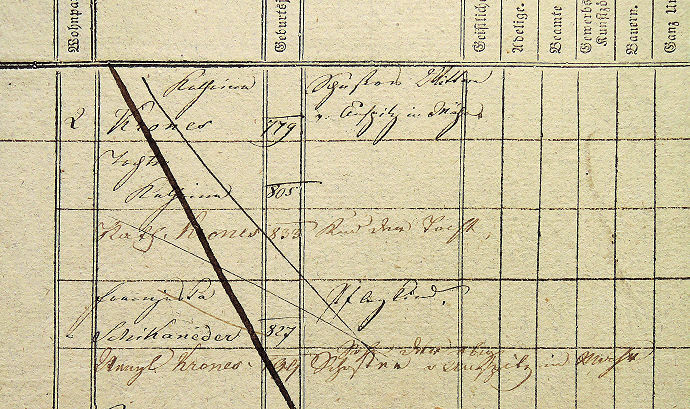 Karl Ludwig Gieseke appearing as "Johann Gießecker", tenant at Wieden 102, in the 1788 municipal tax register (A-Wsa, Steueramt, B34/11, fol. 173). Giesecke is one of several members of Schikaneder's circle who has been ignored by modern-day research while everybody keeps rehashing the old literature, back to Blümml 1923. Not a single author, for instance, has so far acknowledged the fact that during his stay in Vienna Gieseke (as he always signed his name) had a wife and children. Eleonora Gerl died on 22 March 1791 in the "Geroldisches Haus", Wieden 103 (today Kühnplatz 5), and was buried two days later in the Matzleinsdorf cemetery. The entry concerning the death and burial of Eleanora Gerl (St. Karl, Tom. 2, fol. 113). The cause of death was "Zahnfraisen" (toothing cramps). Franz Xaver Gerl, Mozart's first Sarastro and a vastly underrated composer, is so famous in his hometown, the Upper Austrian village of Andorf, that he has his own memorial. Thanks to the research of Komorzynski and Orel we are well-informed about Franz Xaver Gerl's life. His biography, which has been dealt with extensively by several authors during the last 60 years, is outside the scope of this blogpost. On 2 September 1789, at the Paulanerkirche, Gerl married the actress Barbara Reisinger. Emanuel Schikaneder and his associate Joseph von Bauernfeld served as witnesses to this wedding. 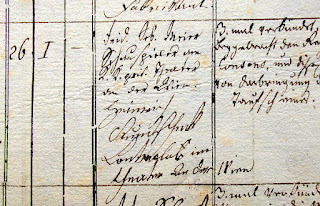 The entry concerning this event at the Paulanerkirche was squeezed between two others and thus the signatures of two witnesses on the far right of the following picture belong to the entry of the previous wedding. The ballpen correction of the wrong year "1798" and the addition of the final syllable "-in" in the bride's profession were probably done by Orel whose transcription of this source (like Komorzynski's) is flawed. The couple's address was "auf der Wied[en] 417", a detail that was to lead to some confusion in the course of later research. Also notable is the fact that – although in 1789 Barbara Reisinger was demonstrably underage – in the marriage entry her age is incorrectly given as twenty-five. The place and date of birth of Gerl's wife Barbara Reisinger are still a mystery. New Grove and MGG give "Vienna or ?Pressburg 1770", the Österreichisches Musiklexikon – bold and unreliable as always – gives "11. Dezember 1770 Pressburg" as Reisinger's date and place of birth. This information is false and not supported by any sources. The claim that Barbara Reisinger was born on 11 December 1770 in Bratislava is the result of a series of errors and bouts of autosuggestion. In 1955 Orel refers to several of Reichard's Theater-Kalender which – according to Orel – repeatedly give 1770 as Reisinger's year of birth and "Pressburg" as her hometown (Orel 1955, 73). The fact that these almanachs do not give Pressburg, but "Petersburg" as Reisinger's place of birth (1787, 161) could not distract Orel who declared this to be a simple error for "Pressburg". 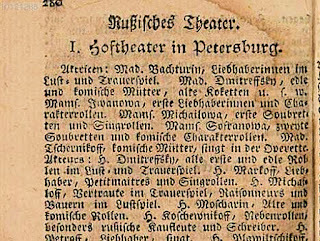 A closer examination of the Theater-Kalender, however, suggests that "Petersburg" means St. Petersburg. 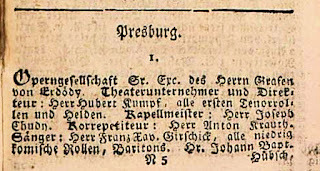 The 1787 Kalender (to give only one example from the series) lists a "Friedrich Maximilian Klinger, Lieutenant bey der Marine [the navy] in Petersburg" (124), and in the description of theater companies the theater in Pressburg has its own paragraph (201) titled "Presburg". 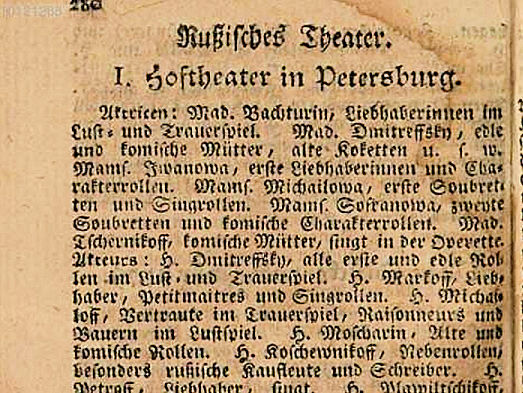 That "Petersburg" in the Theater-Kalender does mean "St. Petersburg" becomes obvious in the 1780 issue of this almanach where the chapter about the Russian theater begins with the paragraph "I. Hoftheater in Petersburg". Second, because the Steuerfassion was drawn up in 1788 (see my 2009 article "Mozart's Apartment on the Alsergrund"), at a time when the chicken monger Franz Reisinger was still alive, his name should appear in the register. Although Reisinger died at Wieden 417 (today Schönbrunnerstraße 22), there is no proven connection between him and Gerl's wife Barbara Reisinger. Mansfeld's research in the Vienna church records did not produce any usable results either. He found the baptism of a Barbara Reisinger on 4 February 1770 in St. Leopold's, the daughter of a Schiffknecht (ship laborer) Franz Reissinger from Linz. Neither an identity nor a family relation of these people to the actress Reisinger could be established and Mansfeld's musings were essentially moot. His claim that there is no other candidate for Gerl's wife, i.e. no other Barbara Reisinger born around 1770 in Vienna, was also false. On 5 December 1770 a Barbara Reisinger was born in "der goldenen Saag" ("The Golden Saw", today Zieglergasse 33) in Oberneustift and baptized in St. Ulrich's, a daughter of the servant Adam Reisinger and his wife Theresia (St. Ulrich, 33, fol. 143v). But this piece of information is a dead end, just like the data presented in 1960 by Mansfeld. It is very unlikely that Barbara Reisinger was born in Vienna. In 1963 the German Kapellmeister and researcher Karl Maria Pisarowitz (1901-1979) decided to solve the Reisinger riddle and turned his attention to the Bratislava church records. 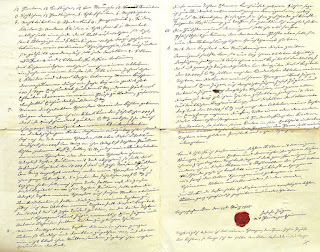 Following his custom method of research by mail, he wrote a letter to the Bratislava regional archives, asking them to find the baptism of a Barbara Reisinger in the records of St. Martin's Cathedral. 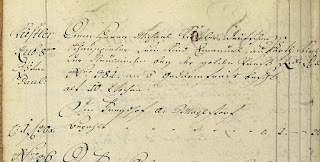 No baptism of a Barbara Reisinger between 1760 and 1775 could be found in the Bratislava records, because there is none. This is proved by the familysearch.org database which, in the meantime, was set up by The Church of Jesus Christ of Latter-day Saints. 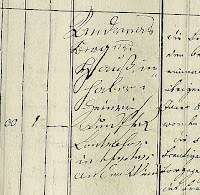 Pisarowitz was sent the only baptismal entry of a Reisinger girl that took place in 1770 which is that of a Maria Anna Reisinger on 11 December 1770. 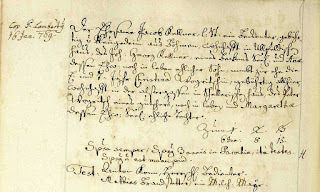 The entry concerning the baptism of Maria Anna Reisinger on 11 December 1770 at St. Martin's Cathedral in Bratislava (Sv. Martina [Part II], Bratislava, Slovakia, line 854, reference ID 90, state regional archives, Slovakia; FHL microfilm 2,437,379). Another daughter of Joseph Reisinger was Anastasia Josepha who was born on 6 December 1768. Eventually we know that this Barbara entered the shady world of the stage on 11 December 1770 in Bratislava as daughter "Maria Anna" of a Joseph Reisinger. Pisarowitz's curious make-believe method of producing biographical data of members of Mozart's friends out of thin air resulted in countless bits of misinformation that still mar the commentaries in MBA, because the editor Joseph Heinz Eibl treated Pisarowitz's privately communicated data as gospel. In 1991 Heinz Schuler could not provide any new information on Reisinger's origin. He only confused the issue by erroneously transferring her alleged place of birth (combined with Mansfeld's wrong date) from Vienna to Linz (Schuler 1991, 100). The source situation can be summarized as follows: Barbara Reisinger, Mozart's first "Papagena", was neither born in Vienna nor in Pressburg. Although the Theater-Kalender are known for their notorious unreliability, it is very likely that Reisinger was born in St. Petersburg, daughter of members of the local German theater company. Jakob Haibel's son Emanuel was born on 30 September 1790 at Wieden 270 (the Schleifmühle, today Schleifmühlgasse 19) and baptized in the Karlskirche by the priest Adalbert Dvořák. Emanuel Schikaneder officiated as godfather. The entry concerning the baptism of Emanuel Haibel on 30 September 1790 (St. Karl, Tom. 3, fol. 16). Jakob Haibel is given as "Opernsänger". The baptismal entry of Emanuel Haibel – written exactly one year before the premiere of Die Zauberflöte – shows a special feature. Schikaneder personally signed his name and it is his only known signature where he wrote out both his first names: "Johann Emanuel". The child Emanuel Haibel died on 9 May 1791 of "Gedärmentzündung" (intestinal inflammation). Haibel's last two children had other godparents. The godfather of Ignaz Haibel (b. 20 May 1792, d. 16 Sep 1792, St. Karl, Tom. 3, fol. 55) was the soap maker Ignaz Schwindler who lived in the same house as Haibel (at Wieden 6) and was the brother of Haibel's landlady. The godmother of Rosalia Haibel (b. 16 Feb 1794, St. Karl, Tom. 3, fol. 100) was Rosalia Haller who also lived in this house. Rosalia Haibel was the child whom her father eventually was to take with him to Croatia. Emanuel Suche was a son of Schikaneder's "Musikdirektor" Joseph Suche and his wife-to-be Susanna, née Richter. The child was born on 17 November 1790 in the house Wieden 106 (very close to the theater, today Schleifmühlgasse 14) and baptized by Adalbert Dvořák in the Karlskirche with Eleonore Schikaneder officiating as godmother. The entry concerning the baptism of Emanuel Suche on 17 November 1790 (St. Karl, Tom. 3, fol. 20). The three crosses below Schikaneder's name do not mean that she was illiterate. 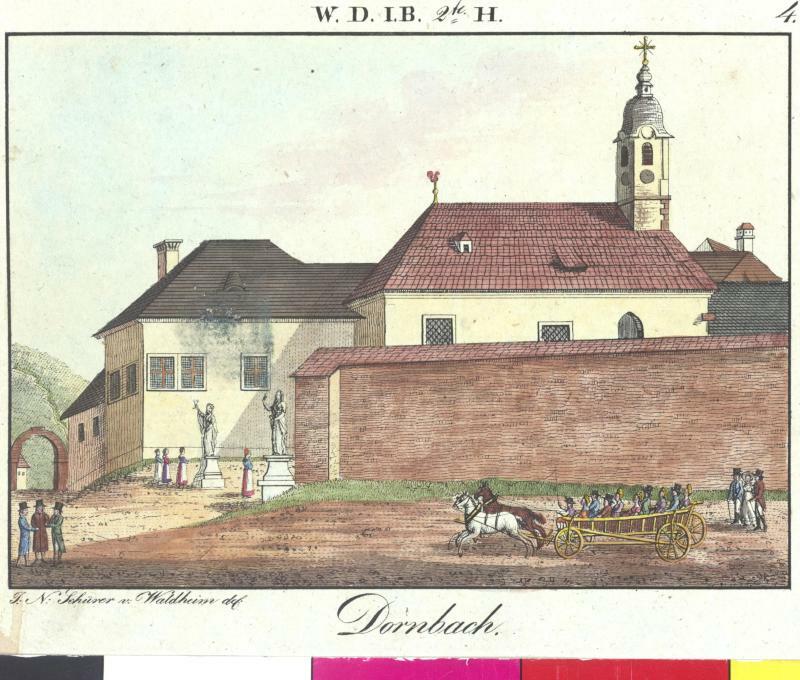 The so-called "Störckmacherhaus", Wieden 106, where Suche lived in 1790 and 1791, belonged to the civil starch and hair-powder maker Lorenz Penzenauer. The Bremen-born actor Johann Nikolaus Starke (1756-1805) – third slave in the premiere of Die Zauberflöte – also lived in this house from 1793 until 1805, probably in Suche's former apartment. Kaspar Biedermann (1750-3 Sep 1795), the prompter of the Wiedner Theater, was Starke's subtenant in this house. Between 1793 and 1805, five of Starke's seven children were born at Wieden 106 (436), but none of them were godchildren of the Schikaneder couple (St. Karl 3, fol. 73, 106, 139, 169, 202). As godparents Starke preferred members of the starch maker families Penzenauer and Pettenkofer who lived in the same house. In this house, Joseph Suche's son Emanuel Suche died on 14 June 1791 of "Kopffrais" (feverish head cramps). Suche / Rub: 8va Pfarr St: Carl / Dem Herrn Joseph Suche Music Di= / rector im Neuwiedner Theater, sein / Kind Emanuel, auf der Wieden in / Störckmacherhaus N° 106. an Kopf= / fraisen beschaut, alt 7. Monat. p: 1 f 30 x Bezahlt 1. – – 30. Schikaneder's concert master Joseph Suche has so far not received much attention from music historians. Although his career as violinist and orchestra leader spanned several decades, he has no articles in the major music encyclopedias, such as The New Grove, MGG, or the Österreichisches Musiklexikon. The reasons for this seem to be twofold: first, Suche's early activity before 1783 is very poorly documented; and second, after Suche had left Schikaneder's orchestra, he mainly worked as violinist in Vienna's church orchestras which kept him away from public attention. Joseph Anton Suchey (as was his original Czech name) was born on 1 July 1751 in Saaz (today Žatec) and baptized the following day in the local parish church. 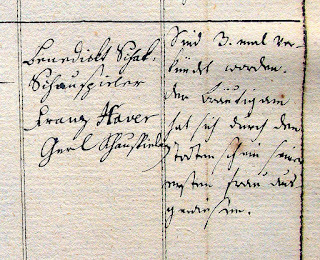 His parents were Joseph Suchey and Franziska, née Mayer who had married on 29 July 1747 in Saaz (Strední oblasní archiv v Litomericích, sig. 189/27, 182). 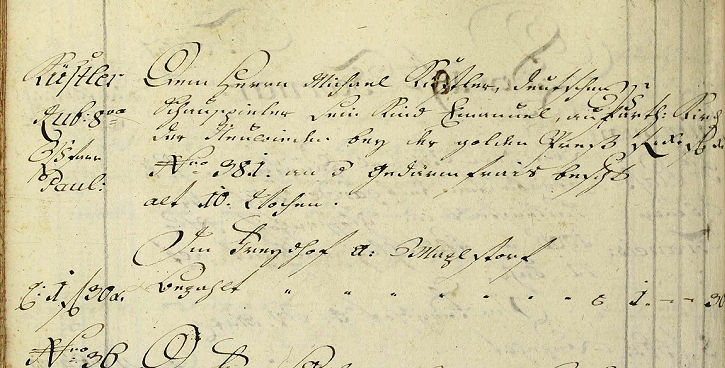 The entry concerning the baptism of Joseph Suche(y) on 2 July 1751 in Saaz. The child's godfather was Anton Franz Grundt. Franz Karl Bauer and Barbara Elisabeth Keller served as witnesses (Strední oblasní archiv v Litomericích, sig. 189/9, 64). 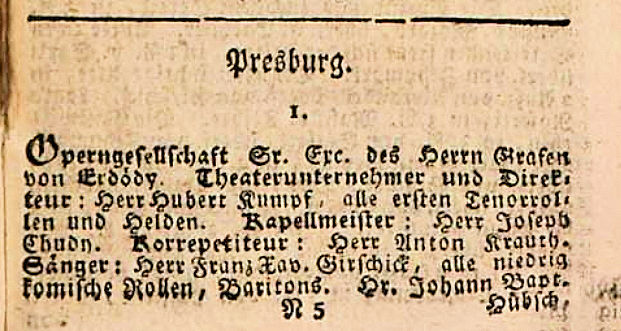 Suche's presence in Vienna is first documented in the 1784 edition of the Theater-Kalender where he is listed as "Direktor" of the orchestra at the Kärntnerthortheater which in 1783 was managed by David Friedrich Gensike (Theater-Kalender 1784, 221f.). Suche's acquaintance with Schikaneder probably began in 1783 when the latter, who at that time led the Pressburg theater, made a guest appearance in Vienna in the title role of Babo's play Otto von Wittelsbach. The Theater-Kalender is however contradicted by the 1783 theater account book which gives Michael Hofer (Franz de Paula's brother) as orchestra leader at the German theater (A-Whh, HA GIdHTh SR 20). Suche first appears in the roster of the Kärntnertortheater in the season 1785/ 86, as first violinist with a monthly salary of 12 fl 30 x, right after the orchestra leader Paul Wranitzky (A-Whh, HA GIdHTh SR 22). Suche was employed at the Kärntnertortheater until 29 February 1788, when the theater was closed due to the cutting measures that resulted from the Turkish War. Together with several other musicians, such as Karl Menzl, Franz Deabis, Felix Stadler and Anton Dreyssig, who all lost their jobs at the court theater, Suche switched to the orchestra of the Theater auf der Wieden. Emanuel Suche was was born almost ten months before his parents' wedding, and yet, he was not even their first child. On 9 October 1789 Suche's girlfriend Susanna Richter gave birth to a son who was baptized Andreas and who was passed off as legitimate by his parents with the help of the midwife Marianna Meyer at whose apartment at Krebsgasse 459 (today Marc-Aurel-Straße 3) the child had been born. By claiming that the child was too weak to be baptized in the parish church of St. Peter's, the midwife had the priest Joseph Petz perform a home christening, presenting the child as born in wedlock and making use of the fact that the priest was not acquainted with the parents. Even earlier children of Suche and Richter may yet be discovered. 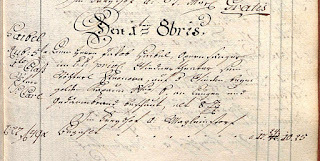 The original entry concerning Andreas Suche's baptism on 9 October 1789 in the house Stadt 459 (A-Wstm, St. Peter [original copy], Tom. 1788-93). The second slash in the last column of the entry's left half marks the child's marital birth. The godfather was Andreas Reiner, a civil locksmith. The note on the far right reads: "Im Hause getauft wegen angeblicher Schwäche des Kindes". 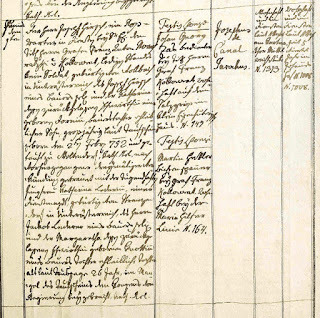 This excuse that also appears in the original entry concerning the home baptism of Mozart's daughter Theresia on 27 December 1787 (Lorenz 2009 and 2010). It is obvious that for a certain time Suche and his future wife lived together near the Freihaus and passed themselves off as married couple. How to get married in such a situation without alerting friends and neighbors to the previous "sinful" lifestyle, was a wide-spread problem in eighteenth-century Vienna. Most couples, who wanted to keep their earlier unmarried status secret, applied for a dispensation from the public proclamation of the banns and were allowed to be married in secrecy. The actor Johann Nikolaus Starke (who appeared as third slave in the premiere of Die Zauberflöte) had the exact same problem: in 1788 he fathered a daughter with his then girlfriend Katharina Pretzky and passed this child off as legitimate to the priest. When he finally got married in July 1793, he was kindly dispensed from all three proclamations (St. Karl 3, fol. 7). To save their reputation, Suche and his girlfriend went for a different method: they used a summer stay in the country as an occasion to get married outside of Vienna, far away from their colleagues at the theater. On 7 September 1791 Joseph Suche and Susanna Strauss, née Richter, got married in the parish church in Meidling with a local locksmith and a taylor officiating as witnesses. In the marriage entry the priest explained the circumstances: "The bridal couple has been living in Meidling in the summer, they received a dispensation from two publications of the banns and an oral permission from the priest of St. Karl parish where they had been living earlier". The couple gave Meidling 35 (today Meidlinger Hauptstraße 3) as their address. The entry concerning Joseph Suche's and Susanna Richter's wedding on 7 September 1791 in Meidling. The groom is described as "Musik Direktor im K.K. Privilegirten Theater in Wien auf der Wieden" (Pfarre Meidling, Tom. 1, fol. 21). Susanna Richter had been born on 3 August 1761 (A-Wd, Tom. 84, fol. 216r), daughter of the footman Johannes Richter. On 29 October 1781 she had married her first husband, the hairdresser Johann Martin Strauss (A-Wd, Tom.74, fol. 106r) with whom she had two children. Suche's wife brought a son into her second marriage named Joseph Strauss (b. 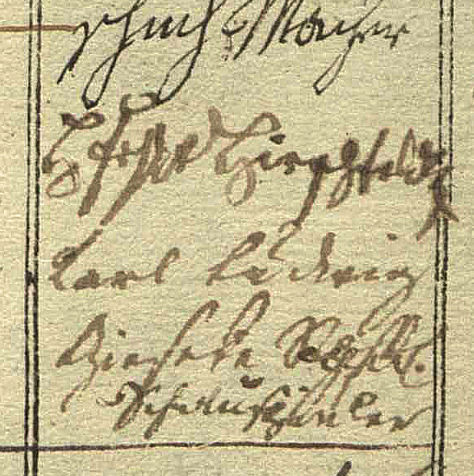 24 September 1783) who died on 24 October 1792 of convulsive cough and was buried under his stepfather's name (A-Wd, Bahrleihbuch 1792, 297r). Joseph and Susanna Suche had four more children: Andreas (see above), Eleonora (see below), Wilhelmine, and Karl of whom only the last one reached adulthood. 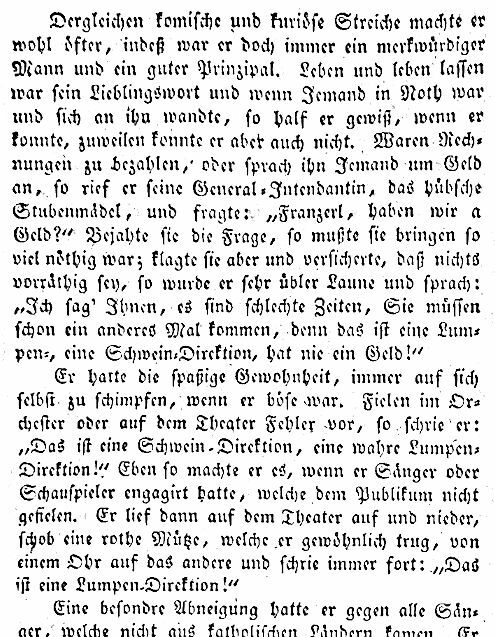 On the occasion of the baptism of his son Karl on 18 December 1798, Suche is referred to as "Musik Direktor von Widner Theater" for the last time (Wieden 3, fol. 276). His and Schikaneder's ways seem to have parted shortly before the theater moved to the new building north of the Wienfluss. Suche never moved to the neighborhood of the Theater an der Wien on the Laimgrube. Susanna Suche died on 25 January 1802 of consumption in the house Wieden 290 ("Zum Goldenen Gewicht", today Waaggasse 15). In her Sperrs-Relation her husband is addressed as simple "Musikus". The fact that Suche reached the high age of 89 may also be related to the fact that he was lucky enough to live in the household of his son Karl and to be cared for by his family. Karl Suche (who had started out as "Protocollist" at the council of war) in 1826 had married the daughter of a "Branntweiner" (St. Karl 7, fol. 96) and was working as "Solizitator" (paralegal). 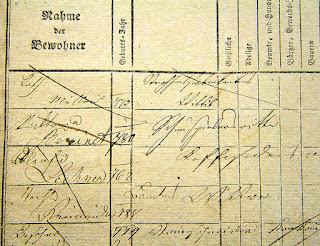 In the records of the municipal conscription office Joseph Suche first appears as roommate of his son's family in 1827 at Wieden 480 (today Margaretenstraße 23). On a conscription sheet he is described as "gew k Hofth[ea]t. Musikus v Satz Bohm". 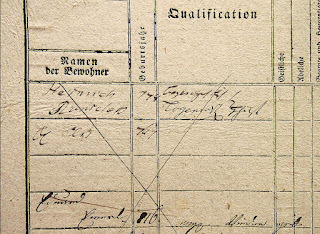 Joseph Suche listed on a conscription sheet of the house Wieden 480 as housemate of his son Karl and his daughter-in-law Magdalena Suche (A-Wsa, Konskriptionsamt, Wieden 480/8r). After the death of his daughter-in-law, Joseph Suche, with his son and his two grandchildren Joseph and Franziska, moved to St. Ulrich 5 (today Neustiftgasse 17) where he was registered at some time during the 1830s, together with his relatives, as "Joseph Suchy Vater des Obigen [father of the above ] v. Stz in Böhm". In this house, St. Ulrich 5, Joseph Suche died on 5 August 1840 of "Lungenlähmung" (lung failure) and was buried in the Schmelz cemetery. The date of his death given in the Totenbeschauprotokoll (187, S, fol. 61) is contradicted by the parish register which gives 4 August 1840. In all records his age is erroneously given as 95. Suche's probate file (Schotten, A10, 43408) is unfortunately not extant. Reminiscent of Freystädtler and Gebauer, Suche was one of the long-lived close colleagues of Mozart of whose possible service as first-hand witnesses local music historians remained completely unaware. Emanuel Kistler, son of the actor at the Wiedner Theater Michael Kistler and his wife Viktoria, née Bollinger, was born in the Freihaus and baptized on 13 December 1791 in the Karlskirche, with Emanuel Schikaneder officiating as godfather. The child's additional Christian names "Michael Urban" came from his father and Schikaneder's brother Urban. 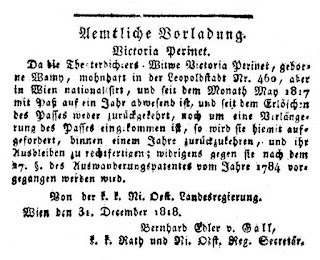 The entry concerning the baptism of Emanuel Kistler on 13 December 1791. The godfather is referred to as "Schauspielunternehmer auf der Wieden" (St. Karl, Tom. 3, fol. 44). Because he was not born in Vienna, did not get married in Vienna, and obviously also died somewhere else, biographical information concerning Michael Kistler is difficult to ascertain. His presence in Vienna is first documented on the occasion of the death of his six-month-old daughter Maria Antonia on 25 May 1790 in the "Seilerisches Haus" on the Landstraße (today Landstraßer Hauptstraße 78) where she had been living in foster care (A-Wsa, TBP 93, CGK, fol. 64v). On 21 November 1790 Kistler's wife already bore a daughter (St. Karl 3, fol. 20) named Anna (d. 9 Oct 1791). This child's godmother was Anna von Bauernfeld (1767-1806), wife of Schikaneder’s business partner Joseph von Bauernfeld and younger sister of Baron Peter von Braun (1758-1819) who a decade later was to become Schikaneder’s most determined rival in the theater business. Kistler was hired by Schikaneder in 1790. As of 11 September 1790 he appeared as Nadir in Der Stein der Weisen. In the premiere of the Die Zauberflöte Kistler got his share of immortality by playing the second priest. Kistler's son Emanuel already died on 18 February 1792 (Wieden 3, fol. 438) of "Gedärmfrais" (intestinal cramps) in the house Wieden 381 (today Preßgasse 13) and was buried the following day in the Matzleindorf cemetery. By 1798 Kistler had already left Schikaneder's company. According to the Allgemeine deutsche Theater-Zeitung from that year he was in Preßburg in 1798 from where, at Easter 1798, he went to Linz. Nothing is known about his life hereafter. Joseph Suche's daughter Eleonora Franziska was born on 16 July 1792 in the house Wieden 263 ("Adam und Eva", today Margaretenstraße 24) and baptized in the Paulanerkirche. Her godmother was "Eleonora v: Schickaneder Gemahlin des Herrn Unternehmers obbesagten Theaters" – the word "obbesagt" referring to Suche's description as "Music Director vom K:K: privil: Wiedner Theater". Eleonora Suche died of smallpox on 4 October 1793 (Wieden 3, fol. 512) in the house Wieden 263 and was buried the following day in the Matzleindorf cemetery. The entry concerning the obsequies and burial of Eleonora Suche on 5 October 1793 (A-Wd, Bahrleihbuch 1793, fol. 246r). 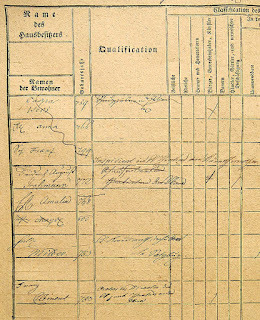 The child's wrong age "11 Monat", which also appears in the parish register, is based on an error in the Totenbeschauprotokoll. Johann Baptist Henneberg was born on 5 December 1768, son of the organist Andreas Henneberger (1727-1791), and baptized the following day in the Schottenkirche. Henneberg's wrong dates of birth, published by Orel (MGG 6, 151) and Komorzynski (1955, 243), were caused by an oversight by both authors who misinterpreted the word "eodem" and disregarded the note "heri hora 10ma noctis" ("[born] yesterday at the 10th hour of the night") in Henneberg's baptismal entry. 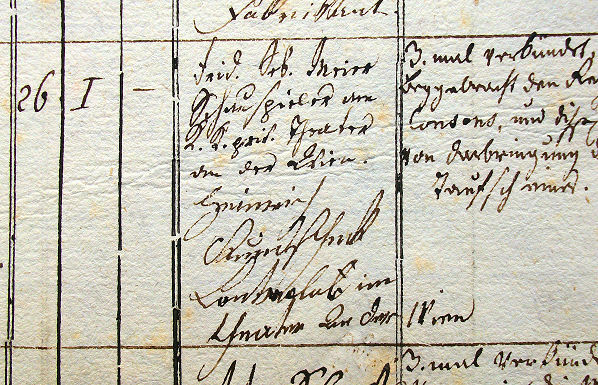 The entry concerning the baptism of Johann Baptist Andreas Nikolaus Lambert Henneberger on 6 December 1768 (A-Ws, Tom. 37, fol. 71v). Henneberg's father, Andreas Henneberger, was born on 22 November 1727 in the Lower Austrian village of Rassing (Kapelln, Tom. 6, 220). The fact that on 18 July 1771 Maria Anna Kayser (the future Maria Anna von Genzinger) officiated as godmother of Andreas Henneberger's daughter Maria Anna Henneberger (1771-1795), suggests that Andreas Henneberger was von Genzinger's piano teacher (A-Ws, Tom. 37, fol. 229v). In late 1789 Henneberg was hired by Schikaneder as Kapellmeister for the Wiedner Theater. Despite his young age, Henneberg proved to be a first rate composer and orchestral leader who raised the artistic level of the musical forces and contributed significant works to the repertory. In 1791, while Mozart was in Prague, he supervised the rehearsals of Die Zauberflöte and conducted the opera as of its third performance. Apart from his own works he also arranged the piano scores of Süßmayr’s Der Spiegel von Arkadien, von Winter’s and Gallus-Mederitsch’s Babylons Pyramiden and Das Labyrinth. A number of sources show that Henneberg kept his post as organist at the Schottenstift during his activity as theater musician. Because he was a fatherless minor, before he could marry, Henneberg in September 1792 had to apply to the municipal civil court for a marriage permit. 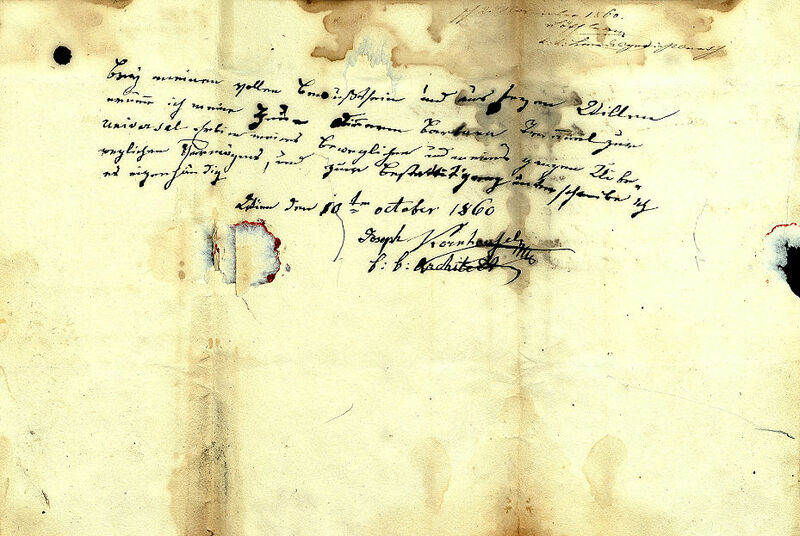 Henneberg's application for a marriage permit written on 20 September 1792. This document is not autograph (A-Wsa, Mag. ZG, A3, 109/1792). 3.tens Wird niemand weder der Braut noch dem unterzeichneten in Ansehen ihres sittlichen Betragens und ihres Lebenswandels die mindeste gegründete Ausstellung machen können. 4.tens Sind mit dieser Verbindung sowohl des unterzeichneten Mutter Marianna Henneberg, als auch dessen Vormund H. Augustin[sic] v: Baumberg einverstanden und finden sie vortheilhaft. Wien den 20ten 7b[er] 792. 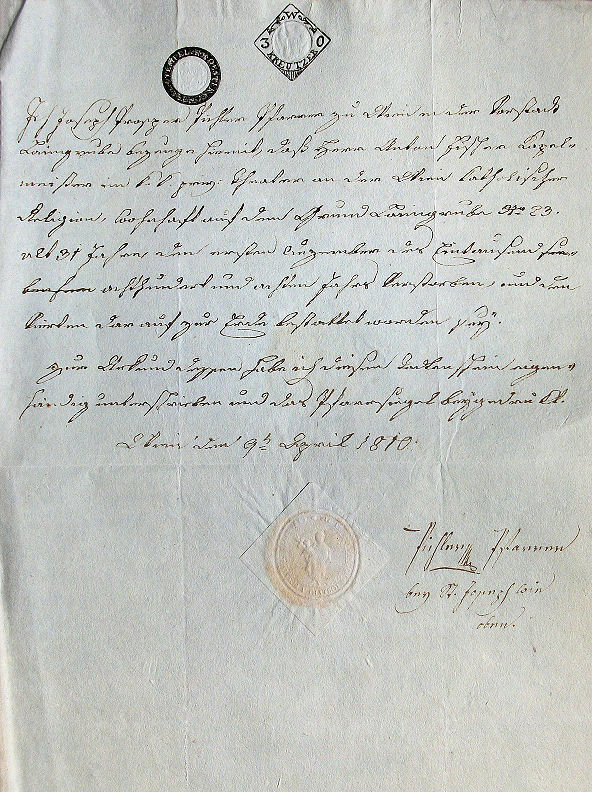 The undersigned Johann Henneberg, whose father Andreas Henneberg only passed away in June 1791 under this honorable magistrate's jurisdiction, intends to marry Maria Henriette Petit, and therefore, because he is still a minor, requests to be granted the superior custodian's permission to this marriage for the following reasons: 1) He is already 23 years of age and has only a short time to reach majority; 2) As a Kapellmeister at the theater and organist, his income enables him to decently support himself and a family; 3) Nobody will be able to make the least justified objection in regards of the moral conduct and life of the bride and the undersigned. 4) Both, the signatory's mother, Marianna Henneberg, and his guardian, Mr. Augustin von Baumberg, agree to this marriage, and find it advantageous. The name "Augustin von Baumberg" in the above document is an error. Henneberg's guardian was Johann Florian Baumberg (1729-1801), head of the Court Chamber archive and father of the poet Gabriele Baumberg (1766-1838) whose poem Als Luise die Briefe ihres ungetreuen Liebhabers verbrannte was set to music in 1787 by Mozart. Henneberg got married on 29 October 1792 in the Schottenkirche (A-Ws, 38, 65). His bride was Marie Henriette Petit, daughter of Alphonse Petit, a Netherlands-born chamberlain with Count Karl Joseph Batthiány. Henneberg had obviously made the acquaintance of his wife through his mother who in May 1792 (A-Ws, 38, 42) had married Martin Hagedorn (1733-1814), the father-in-law of Marie Petit's brother Karl. Johann Baptist Henneberg and his first wife had the following nine children. Henneberg's first child Johann Emanuel was baptized on Wednesday, 14 August 1793, in the Schottenkirche, with Emanuel Schikaneder standing godfather. The child again received both of Schikaneder's Christian names, Johann and Emanuel. 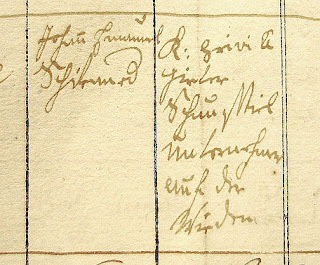 The baptismal entry shows Schikaneder's two forenames, but this time he did not sign personally. The father is given as "Organist beim Stift Schotten und Kapellmeister des KK privilegirten Theater auf der Wieden". 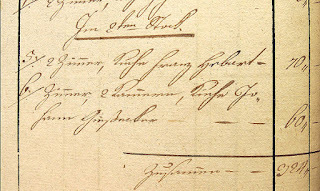 The entry concerning the baptism of Johann Emanuel Henneberg on 14 August 1793 in the Schottenkirche (A-Ws, Tom. 44, fol. 26). Johann Emanuel Henneberg already died on 24 August 1793 at 7 a.m. of "Fraißen" in the house Stadt 1342 on the Elendbastei where he seems to have been in the care of a nurse (A-Wsa, Totenbeschreibamt 98, H, fol. 47v). The child was buried on the following day in the Währinger Allgemeiner Friedhof. Theresia Hirsch was born on 9 March 1794 in the Freihaus and baptized at the Karlskirche, with a certain Theresia Eid serving as proxy for the godfather Emanuel Schikaneder. The child's parents were Joseph Hirsch and his wife Katharina, née Lederer. Hirsch worked as Hausknecht (manservant) at the Freihaus and it could well be that he was the "Joseph Hirschel" that is listed as Schikaneder's "Instrumentdiener" in Schönfeld's Jahrbuch (Schönfeld 1796, 96). Theresia Eid may have been the woman who on 17 January 1796 bore an illegitimate daughter at Wieden 424 (Pfarre Wieden, 2, 167). Theresia Hirsch already died on 25 June 1794 of "Dörrsucht" (diarrhea), probably in foster care, at Wieden 103 (today Mühlgasse 14). Relatively little is known about Theresia Hirsch's father Joseph Hirsch. His presence in Vienna is documented for the first time on the occasion of his wedding on 1 June 1783 in the Augustinerkirche. At that time he was a groom in the service of Count Franz Anton Nowohradzky-Kolowrat ("k.k. wirklicher geh. Rath und Kämmerer, ehmaliger Präsident der Hofkammer in Münz und Bergwesen"). According to the marriage entry in the records of St. Augustin, Joseph Hirsch was born on 2 February 1752 in Vollbach and baptized in Moltendorf in Lower Austria. Because there was neither a village Vollbach, nor a parish Moltendorf in Unterösterreich, the place of Joseph Hirsch's birth is yet to be determined. Hirsch's wife Katharina Lederer was born on 31 August 1756 in Stranzendorf (Pfarre Stranzendorf 1, 94). 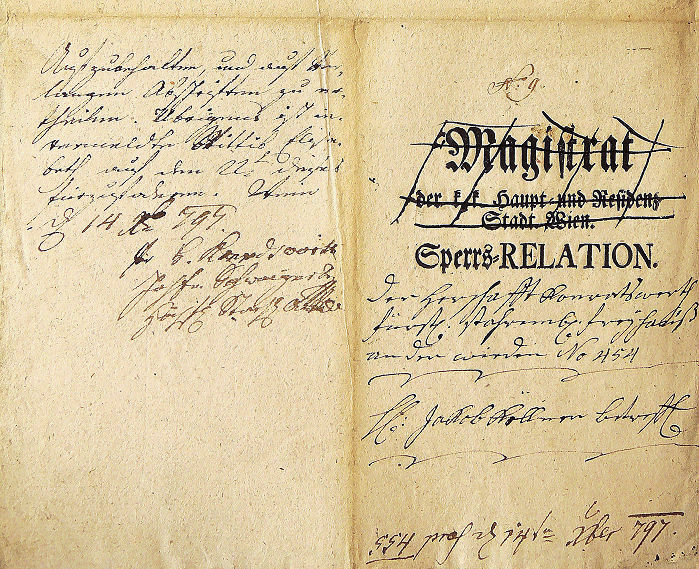 The entry concerning the wedding of Joseph Hirsch and Katharina Lederer on 1 June 1783 (St. Augustin, Tom. 1, 7). The groom lived at the Johanneshof No. 1008, the bride was in service "am Karnerthor Mittelwachtstube N. 1313" (St. Augustin, Verkündbuch 1, 25f.). Nothing more is currently known about Joseph Hirsch and his family – which should not be counted among the major lacunae of Schikaneder research. From 1790 until his death, Kaspar Weiß (1759-1807) was active as actor, first at the Wiedner Theater in Schikaneder's company, then at the Theater an der Wien. He was typecast as “Könige, Geister, gemeine Spitzbuben and komische Ehemänner” (Kings, ghosts, nasty scoundrels and comical husbands). Until 1801 he also ran a business as music copyist in the Freihaus (at "Stiege 16 Nro. 139 im ersten Stock" and "Stiege 27 im ersten Stock"). His work as a professional copyist gained him posthumous fame, when the American musicologist David Buch examined a score of the opera Der Stein der Weisen that had returned from Russia in 1991 to the Staats- und Universitätsbibliothek Hamburg and found entries by Kaspar Weiß, indicating the authorship of two unknown pieces by Mozart. 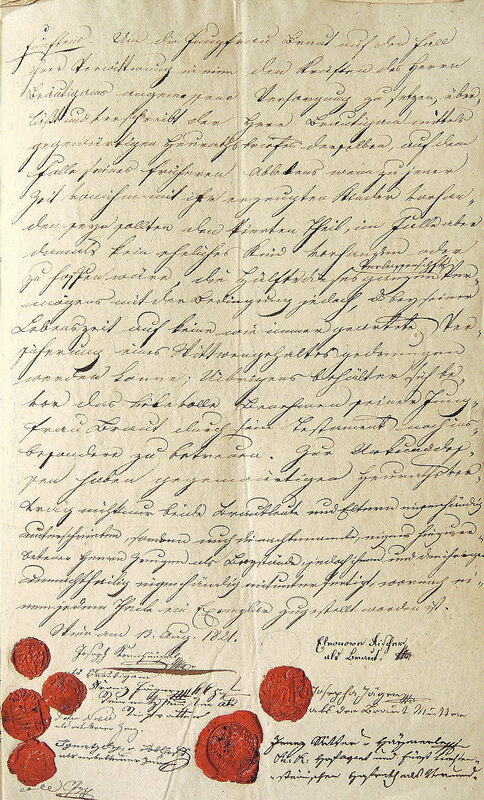 Weiß’s close acquaintance with all important members of Schikaneder’s company is supported by several pieces of archival evidence of which Schikaneder's godparenthood is only a small facet. When on 13 February 1791 the widower Weiß married (the already pregnant) Anna Schenk, Franz Xaver Gerl (the first Sarastro) and Benedikt Schak (the first Tamino) served as witnesses at the wedding. 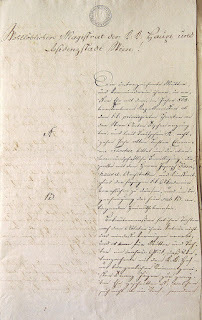 The entry concerning the wedding of Kaspar Weiß and Anna Schenk on 13 February 1791 in the Karlskirche (St. Karl, Tom. 2, fol. 107). At the time of his wedding Weiß lived at Wieden 99 (Rechte Wienzeile 13), his bride lived at the Freihaus. That Weiß's first wife Josepha, née Aingner, died outside of Vienna is proved by the fact that in October 1794 the Vienna Magistrate, on behalf of the municipal court of Frankfurt am Main, published three ads in the Wiener Zeitung inquiring if Josepha Weiß was still alive. 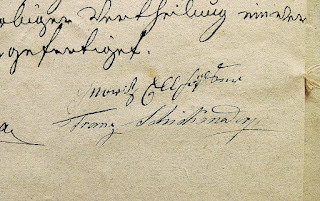 Benedikt Schak's and Franz Xaver Gerl's autograph signatures in Kaspar Weiß's marriage entry. The note on the right reads: "The banns were published three times, the groom produced the death certificate of his first wife" (St. Karl, Tom. 2, fol. 107). 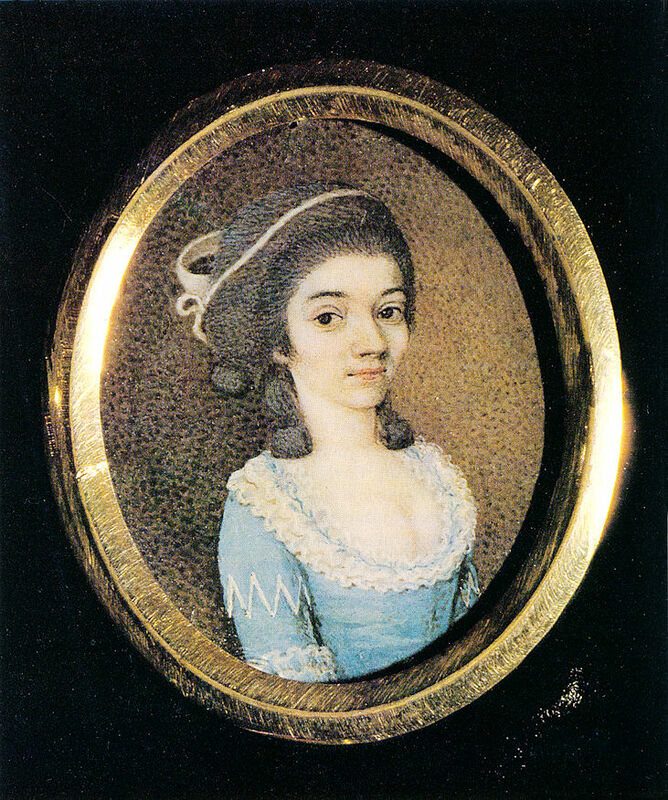 When on 1 February 1798 Constanze Mozart’s niece Maria Antonia Meier was baptized, Weiß stood in as godfather for the leathermaker Anton Senft (1771-1810). 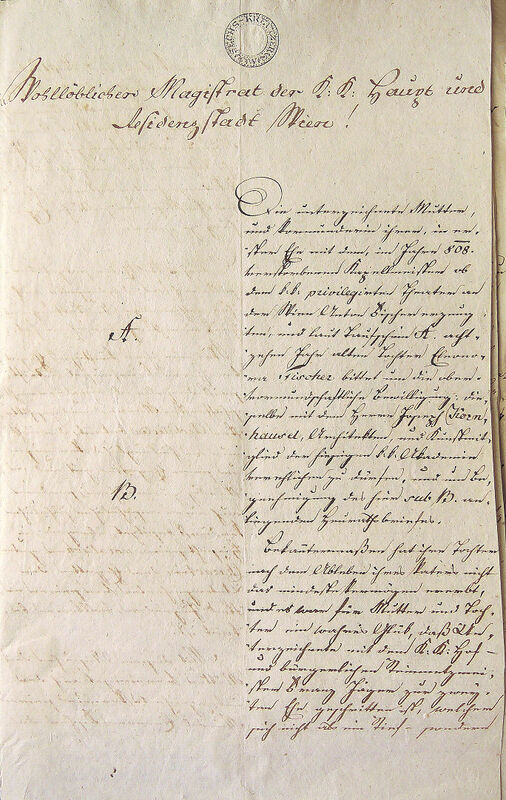 The entry concerning the baptism of Friedrich Sebastian Meier's daughter Maria Antonia on 1 February 1798. On the far right is the note "Statt dessen Kaspar Weiß." (St. Karl, Tom. 3, fol. 195). A similar thing happened, when on 27 June 1794 Weiß’s son was baptized in the Karlskirche: the official godfather Schikaneder could not attend the ceremony and sent his friend Karl Ludwig Gieseke as substitute who duly augmented the child’s Christian name from "Emanuel" to "Karl Emanuel". 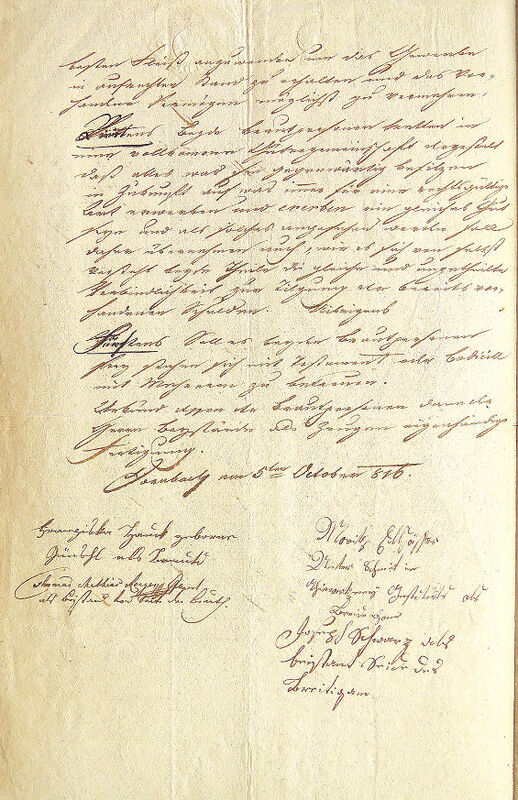 The entry concerning the baptism of Karl Emanuel Weiß on 27 June 1794 (St. Karl, Tom. 3, fol. 109). The child was born at Wieden 268 (today Schleifmühlgasse 13). [Pathe] Emanuel Schikaneder Schauspieler und Directeur an dessen Statt hob das Kind aus der Taufe Karl Ludwig Gieseke Schauspieler. [Godfather] Emanuel Schikaneder actor and director in whose stead the actor Karl Ludwig Gieseke officiated as the child's godfather. The boy Karl Emanuel Weiß died on 23 August 1795 of diarrhea and was buried the following day in the Matzleinsdorf cemetery. 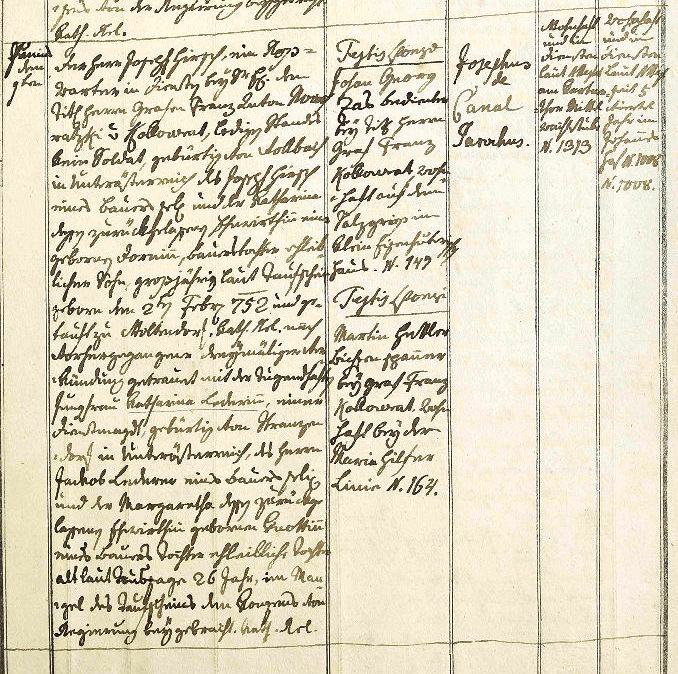 The entries in the Totenbeschauprotokoll and the church register suggest that the child was called just Emanuel. The actress Josepha Weiß, a daughter from Kaspar Weiß's first marriage, died of a stroke on 3 February 1798, aged 17, in the Freihaus (St. Karl, Tom. 3, fol. 51). When the Theater auf der Wieden moved across the Wienfluss to the Theater an der Wien, Weiß remained a member of the company. Except for short stands at the Theater in der Josephstadt and the Theater in der Leopoldstadt in 1806, he appeared on the stage an der Wien until shortly before his death. 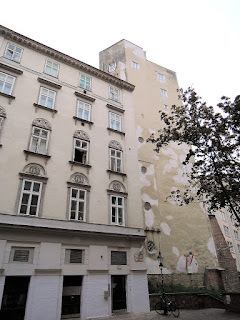 For most the last six years of his life Weiß lived at Laimgrube 27 (today Linke Wienzeile 8), the so-called "Fokonetisches Haus", beside the Theater an der Wien. In this building's conscription records Weiß is registered together with a number of other employees of the Theater an der Wien, such as Joseph August Röckel, Friedrich Demmer, Franz Clement, Karl Friedrich Krüger (who was Eleonore Schikaneder's universal heir) and Philipp Jakob Riotte. The names of Kaspar Weiß, his wife Anna and their children Franz and Magdalena on a conscription sheet from 1805 of Laimgrube 27. Other theater people registered on this document are the actor and stage manager Friedrich August Grohmann (b. 26 Sep 1772 in Börnichen) and his first wife, Felix Milder (Anna Milder's father), and Franz Clement. 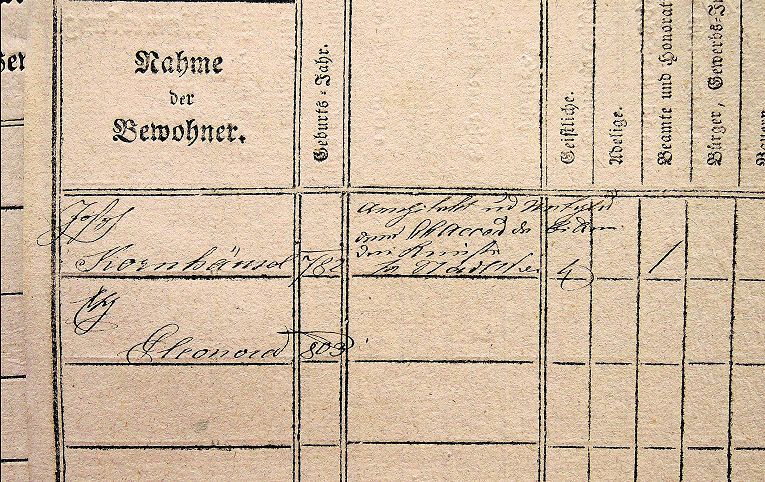 Note that, because sometimes the names of later tenants were written into remaining free spaces, the name of Magdalena Weiß appears below the Grohmann couple (A-Wsa, Konskriptionsamt, Laimgrube 27/10r). Shortly before the end of his life Weiß had to move to Laimgrube 8 which was a small, hut-sized building in the court of the theater's painting workshop. Weiß died of "Abzehrung" (consumption) on 29 June1807 in Vienna's Allgemeines Krankenhaus. 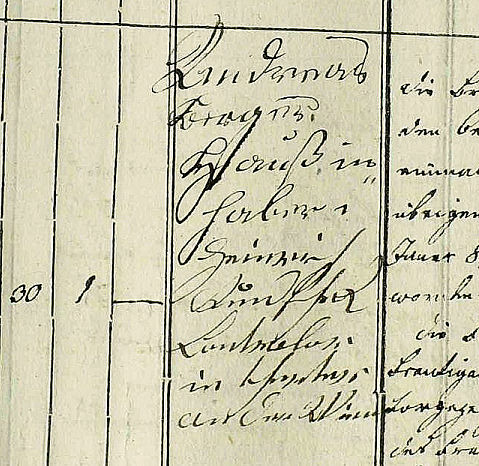 The entry in the musicipal death register mistakenly gives his place of birth as "von Grätz aus Steuermark" (Weiß hailed from Pettau, today Ptuj in Slovenia). An Vermögen. nichts und wäre die wenige Leibskleidung des Verlebten im allg: Krankenhause verblieben. Es wurde daher keine Sperr angelegt. Nach neuerlicher Auskunft der Wittwe ist auch kein Besoldungsrückstand vorhanden, und hätte Verlebter selbe nur zur Hälfte, die andere Hälfte aber die Gläubiger bezohen, mithin nichts als wahres Elend vorhanden seÿe. Auch hatte derselbe nicht einmal ein Dekret. Of assets. Nothing and the few clothes of the deceased remained in the general hospital. No ban was therefore applied. According to the widow's recent report, there are no arrears of salary, and the deceased received only half of it anyway, the other half went to the creditors. Therefore there is nothing but true misery. Neither did the aforesaid even have a decree of employment. The widow proposed her brother, the Imperial footman Mathias Schenk, as guardian of her children. For more details on Weiß's biography and his significance as music copyist, see Buch 2000 and 2004, as well as Edge 2001. Franz Emanuel Kellner was born on 8 February 1795 in the "Bittermannisches Haus", Wieden 260 (today Margaretenstraße 30), and baptized in the Paulanerkirche with "Eleonora Schickanederin Widner Theater Unternehmers Frau" standing godmother. The child's parents were Jakob Kellner, cashier of the Wiedner Theater, and his (second?) wife Elisabeth, née Klement. Very little is known about Jakob Kellner's origin. He was born around 1747 and could be identical with the servant Jakob Kellner, son of a baker in Neugedein (Kdyně) in Bohemia, who on 16 January 1769, in the Schottenkirche, married Christina Wogritsch. The entry concerning the wedding of Jakob Kellner and Christina Wogritsch in 1769. 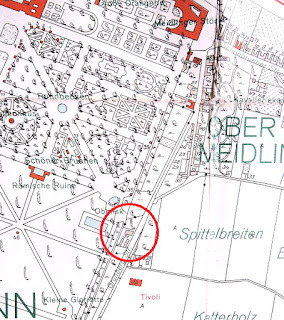 The groom lived at the "Ullfeldisches Haus" (today the area in front of Löwelstraße 8) (A-Ws, Tom. 32, fol. 209v). In case this Jakob Kellner from Bohemia was really the later theater cashier, his second wedding should have taken place before 1788. 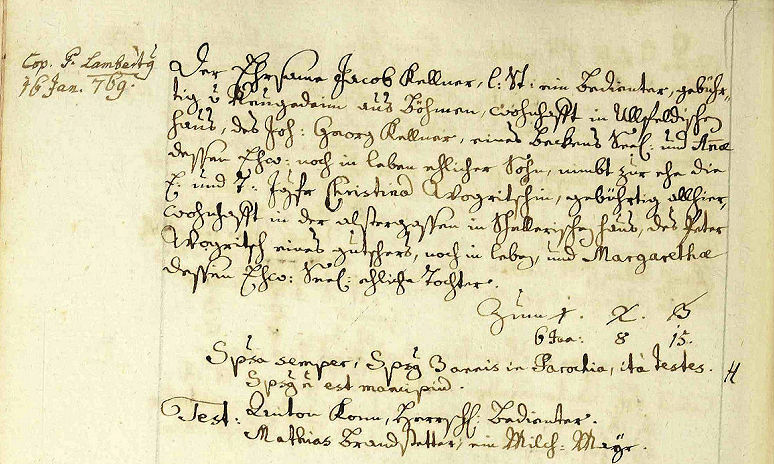 That this wedding to Elisabeth Klement does not appear in the Vienna church records, speaks against the identity of the above servant with Schikaneder's employee. The child Franz Emanuel Kellner died of consumption on 22 May 1795. 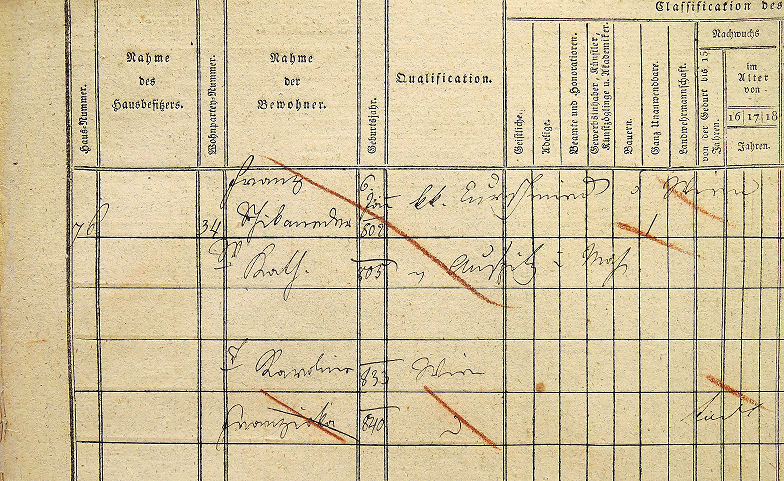 The entries in the Totenbeschauprotokoll and the church register show that the child was simply called Emanuel. Schikaneder's cashier Jakob Kellner died of "Faulfieber" (gangrenous fever) on 5 December 1797 in his room in the Freihaus, at "Stiege No 29, Zimer No 229". He was survived by his wife and two children for whom their mother proposed the "Anhalt-Zerbstischer Legationssekretär" Remigius Schäfer as guardian. 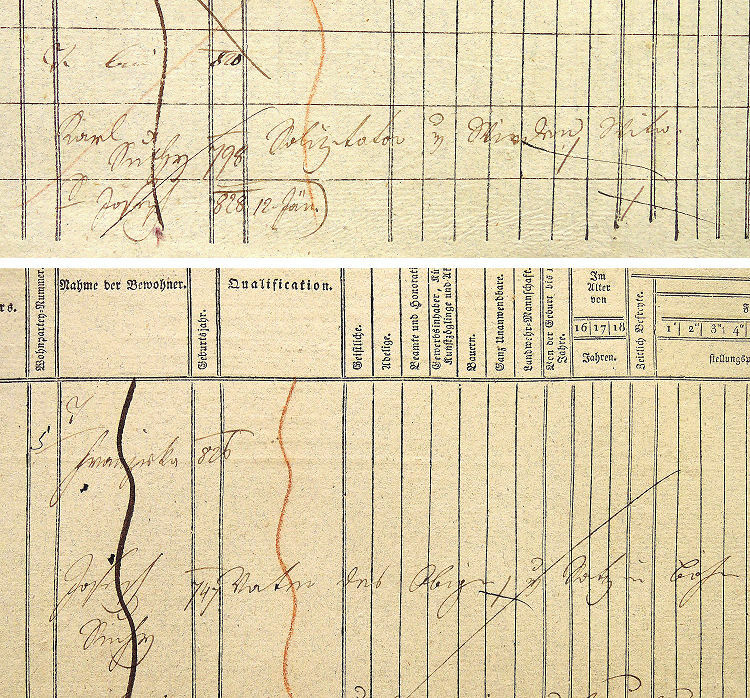 A section of the cover sheet of Jakob Kellner's Sperrs-Relation. 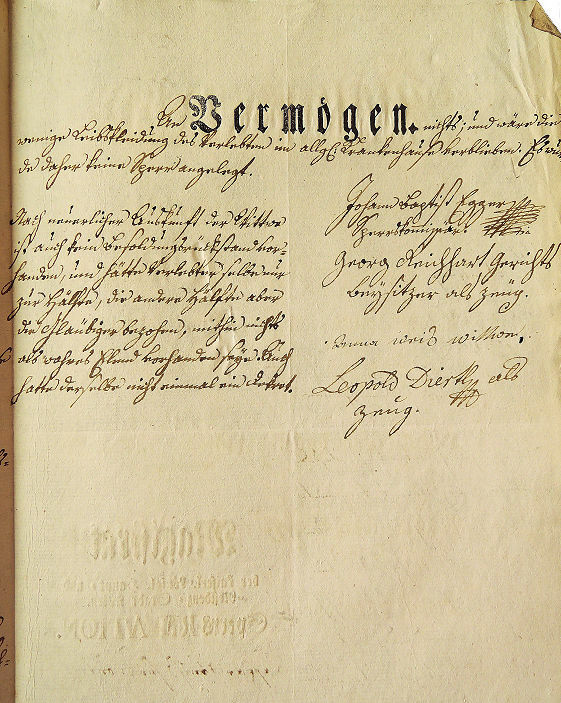 Anton Wißmann, the judge of the Herrschaft Konradswörth, under whose jurisdiction the Freihaus fell, crossed out the printed title of the Vienna Magistrate and replaced it with the note: "der Herschaft Konratswerth fürstl. stahremb. freÿhauß an[sic] der wieden No. 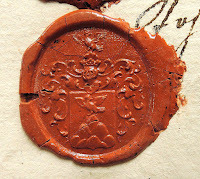 454" (A-Wsa, Patrimoniale Herrschaften, A103, 9/1797). Jakob Kellner died a pauper. 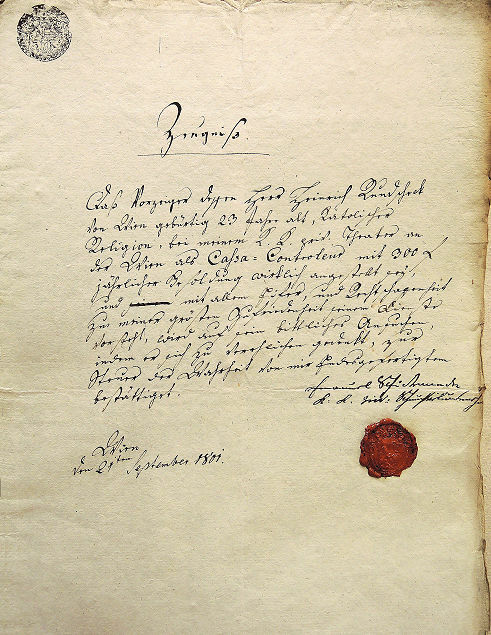 His probate file closes with the note: "Vermögen. Keines" (assets: none). Johann Baptist Henneberg's second child Maria Magdalena was born on 24 August 1795 in the Schottenhof and baptized on the same day in the Schottenkirche. Emanuel Schikaneder, who served as godfather, is referred to in the records as: "Direktor der KK privilegirten Schaubühne auf der Wieden". On 23 July 1820, in the Schottenkirche, Maria Henneberg married Johann Baptist Hampel von Waffenthal, a captain of the I. & R. Infantry Regiment Prince Esterházy No. 32. The groom (born around 1778 in Lipnica Murowana) was a son of the I. & R. Army major Anton Hampel von Waffenthal (1726-1797) who had been ennobled in 1780 by Joseph II. Maria Henneberg's acquaintance with her future husband had probably been established during her father's service for Prince Esterházy. 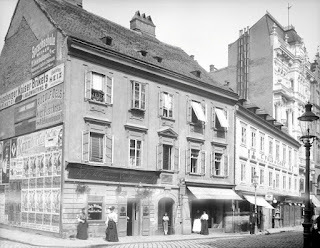 In 1820 the groom lived at the Esterházy'sches Majoratshaus in the Wallnerstraße, the bride at Stadt 163 (today Renngasse 2). Wittnesses to the wedding were the physician Dr. Dominik Vivenot (1764-1833) and Peter von Heydendorff, cavalry captain and first Second-Wachtmeister of the Royal Hungarian guard (a son of the historian Michael Conrad von Heydendorff). The couple had the following four children (the dates of birth from the Genealogisches Handbuch des Adels are still unverified). 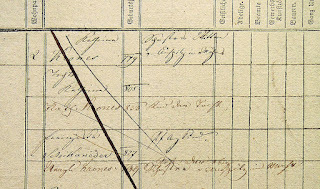 The Hampel von Waffenthal family with to of their children on a conscription sheet of Stadt 403 (Judenplatz 1) where they lived between 1824 and 1830. The name "Anna" is a mistake (A-Wsa, Konskriptionsamt, Stadt 403/12r). On 13 February 1824 Maria Hampel von Waffenthal submitted a request to the court to grant stipends to her two minor sisters Theresia and Walburga, "orphans of the court organist Henneberg". The Obersthofmeisteramt referred the application to the court chamber which declined the request due to the absence of several crucial documents. On 27 February 1824 Prince Ferdinand von Trauttmannsdorff informed the I. & R. Hofmusikgraf Moritz von Dietrichstein that the applicant also had to hand in her father's decree of employment, all her siblings' baptismal certificates to prove that Henneberg had left behind at least four children, and, finally, her mother's death certificate. On 7 April 1824 the Emperor granted both orphans 100 gulden each (A-Whh, HMK 13, 69f.). 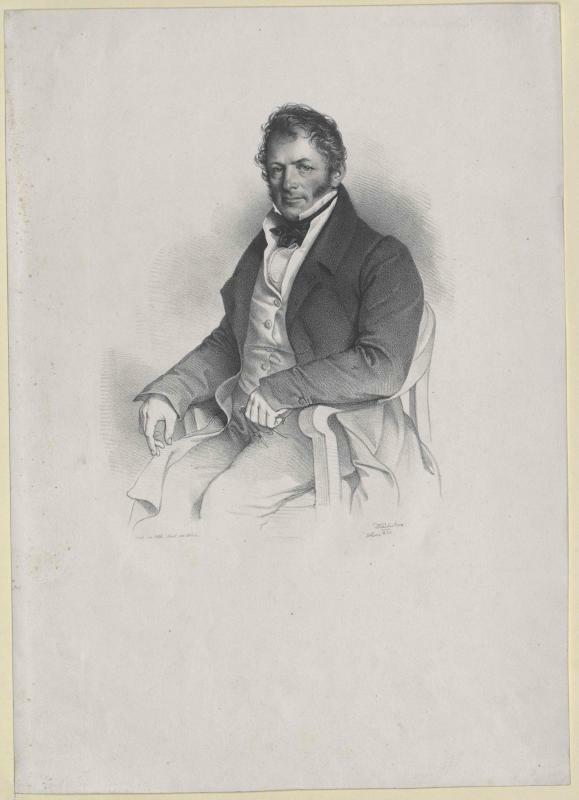 Johann Baptist Hampel von Waffenthal, who on 29 May 1822 had served as best man at Johann Baptist Henneberg's second wedding (St. Karl 7l, fol. 2), died of exhaustion on 26 February 1837 and was buried on 1 March 1837 in the Gersthof cemetery (St. Michael 12, fol. 152). Schikaneder's last surviving godchild Maria Hampel von Waffenthal died of cardiac arrest on 28 May 1864 at Kärntnerstraße 34. She was not buried in her husband's grave in Gersthof, but in the Matzleinsdorf cemetery. Relatives of Johann Hampel von Waffenthal are still alive today, but because they descend from Johann's younger brother Maximilian (1779-1841), they are not blood-related to Henneberg's daughter. Johann Henneberg's third child Elisabeth was born on 19 November 1796 in the Schottenhof and baptized on the same day in the Schottenkirche with Emanuel Schikaneder again officiating as godfather. In the records Schikaneder is described as "Schauspielunternehmer auf der Wieden". Elisabeth Henneberg died of tracheitis on 18 December 1813 at Alsergrund 29 (today Florianigasse 10) where she had been livingwith her parents after Johann Henneberg's return from his service as deputy Kapellmeister in Eisenstadt. The first page of Elisabeth Henneberg's probate file. Note that her father is described as "gew:[esener] Fürst Esterhazischer Vize=Kapellmeister" (A-Wsa, Mag. ZG, A2, 4213/1814). Johann Henneberg's third child, Emanuel Karl Johann Baptist Othmar, was born on 5 July 1798 at 8 a.m. in the Schottenhof and baptized in the Schottenkirche with Emanuel Schikaneder serving as godfather. The child received the additional names after his father and the officiating Benedictine priest Othmar Koffler. In the baptismal register the godfather is referred to as "Entrepreneur des K.K. priv[ilegirten] Wiedner Theaters". 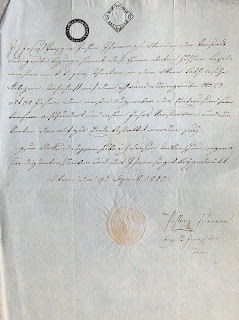 The entry concerning the baptism of Emanuel Henneberg on 5 July 1798 (A-Ws, Tom. 44, fol. 220). Emanuel Karl Henneberg died of scarlet fever on 31 October 1804 in Hof am Leithaberge No. 5 where his parents had moved in the same year. At this point it is time to take a closer look at Henneberg's financial circumstances which in 1804 enabled him to temporarily quit his job as a Kapellmeister and move to the country. In 1767 Johann Henneberg's father, the organist Andreas Henneberger, had already bought a small house on the Schottenbastei. In 1771 he bought the adjacent building, Stadt 1278, from his parents-in-law, Andreas and Theresia Spatz and had the two houses converted into a single one (the file related to this conversion, A-Wsa, Unterkammeramt, Baukonsens 1554/1771, does not survive). In 1791 Andreas Henneberger died a wealthy man. Together with his house, which in 1791 was estimated ed at 8,050 gulden, his huge stock of wine, and his movables, the value of his estate was estimated at 9,917 gulden 26,5 kreuzer. Andreas Henneberger's house Stadt 1278 on the Schottenbastei on Huber's Vogelschauplan One of Henneberger's tenants in this house in 1788 was the court cellist Joseph Orsler. The appraisal of the house from 1791 shows that it consisted of a cellar and four storeys, each of which comprised four rooms and four chambers. It had two entrances from the Bastei (originating from the earlier two houses), its own draw well, and two small atriums. In 1804 Henneberg resigned his function at the Wiedner Theater to Ignaz von Seyfried and moved to Hof am Leithaberge, a village in Lower Austria, at what was then the Hungarian border. Henneberg became deputy Kapellmeister in the service of Nikolaus II, Prince Esterházy. In 1813 he was back in Vienna and at the time of the death of his daughter Elisabeth in 1813, he was living next door to the house, where one year earlier his former employer Emanuel Schikaneder had died. A mere coincidence? Johann Baptist Henneberg died on 27 November 1822 on which day he signed his will, with the oboist Joseph Elßler junior among the witnesses (A-Wsa, Mag. 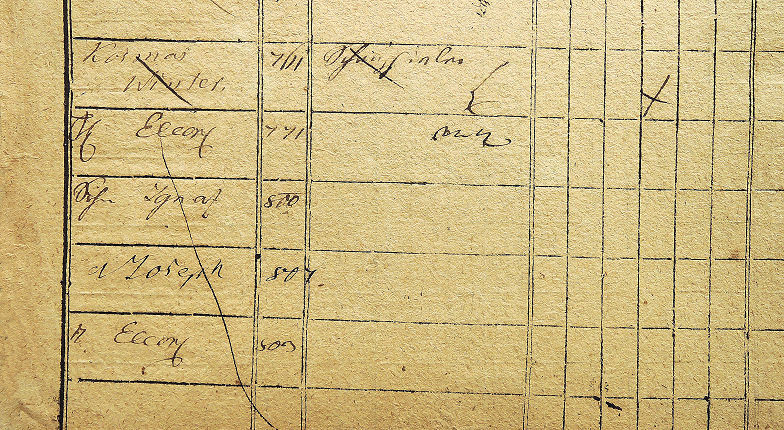 ZG, A 10, 565/1822, for a detailed description of Henneberg's estate see Lorenz 2013). Eleonora Vamy was born on 4 August 1801 in the house Wieden 432 (Schleifmühlgasse 18) and baptized in St. Karl with Eleonora Schikaneder standing godmother. The child's mother is given as "Victoria Wamy ledige Person" (unmarried person). The place of birth can hardly have been a concidence: this was the house where Franz Xaver Gerl and Karl Ludwig Gieseke are documented to have lived at some earlier point of time (see above). The mother of this illegitimate child was Victoire Vamy who had been born in Paris in 1781, daughter of the steel manufacturer Jacques Vamy. It is not known when she came to Vienna. She began her acting career in Vienna by appearing under the stage name "Fräulein Sommer" in various roles at the Theater an der Wien. On 17 May 1803 she became the second wife of the comedian and playwright Joachim Perinet whose first wife had died on 20 September 1798. At the time of their wedding, Perinet and his bride were living together at Wieden 437 (Schleifmühlgasse 12). It is notable that in the marriage records of the Karlskirche Victoire Vamy is mistakenly given as widow. 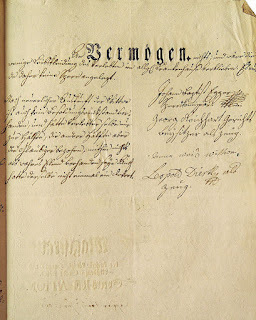 That Joachim Perinet was indeed Eleonory Vamy's father is proved by the entry concerning the child's death in the records of the parish of St. Johann Nepomuk in the suburb of Leopoldstadt. There the girl is registered as "dem H: Joachim Perinet Schauspieler s: K: Eleonora" and as having died of Fraisen on 3 January 1805 in the house Leopoldstadt 353 (Praterstraße 65). The Perinet family had moved there when in October 1803 both parents were engaged at the Leopoldstädter Theater by Karl Friedrich Hensler. Neither Perinet nor Vamy were lucky with the choice of their spouse. Like her husband, Vamy was a somewhat restless and fickle personality and she created quite a stir among Viennese theater lovers when she became the mistress of the Russian General Aleksey Petrovich Yermolov. (see Gugitz 1904, 201). While her husband was still alive she is documented to have lived alone at all kind of scattered Viennese addresses. There is no conscription document from after 1805 in which the Perinets actually appear together as married couple. Between 1805 and 1808 Frau Perinet resided in the Freihaus auf der Wieden, together with her younger sister Caroline Vamy. 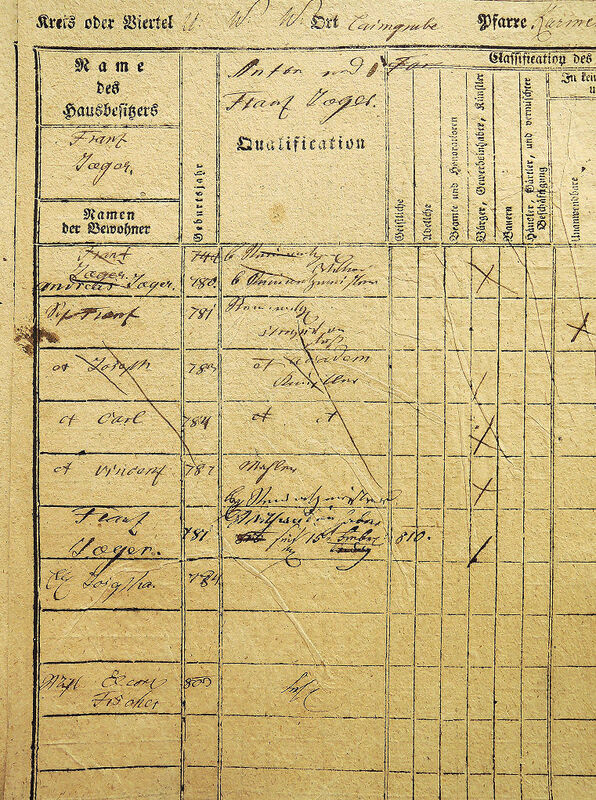 Victoire Perinet and her sister Caroline registered in a conscription sheet of the Freihaus in the former apartment of the musician and composer Andreas Träg. 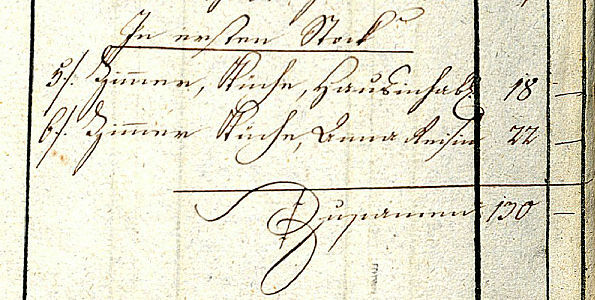 The names of two of Träg's daughters appear at the bottom: Barbara Träg (1787-1864) was to become the mother of Leopoldine Blahetka, Theresia Träg died on 29 April 1808, shortly after her father, in Guntramsdorf (Pfarre Guntramsdorf, Tom. 4, fol. 11). 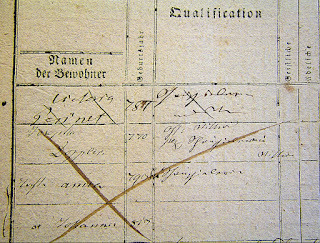 Soon after 1816 Victoire Perinet appears as "Schauspielerin Wittwe" in the conscription records of Laimgrube 19 (today Papagenogasse 2). For a short time, after her husband's death, Victoire Perinet also lived in the so-called "Spaliermacherhaus", Spittelberg 134, at the Glacis (today Museumstraße 5). 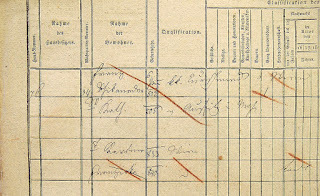 In the conscription records she is again described as "Schauspielerswittw[e]". When Joachim Perinet died on 4 February 1816 his wife had already left him. Curiously, a note in Perinet's Sperrs-Relation refers to her with a wrong first name: "The bereaved wife Eleonora[!] did not live with the deceased and is said to be currently staying in Paris". This statement appears to have been based on hearsay, given that Madame Perinet applied for a passport to Karlsbad and Paris only on 6 May 1817. She was not registered at the addresses Leopoldstadt 460 and 540 that appear in the following entry in the municipal passport protocol. 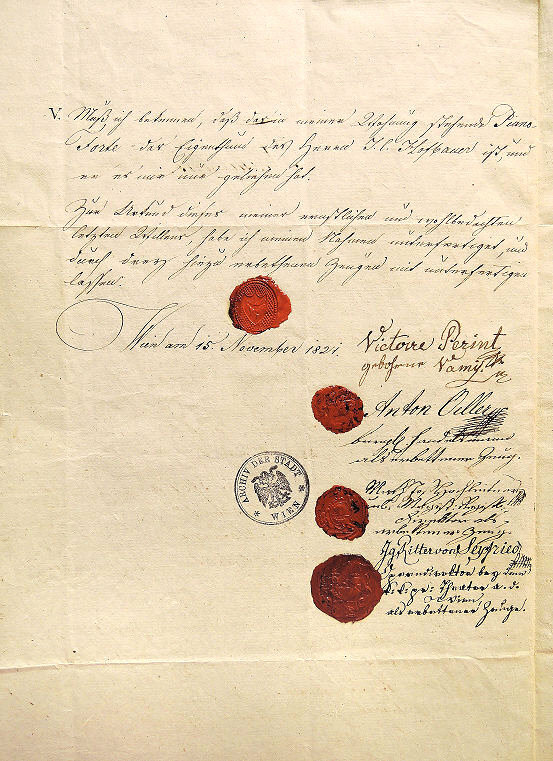 The entry in the 1817 municipal protocol concerning the issuance of Victoire Perinet's, her maid's, and her coachman's passports to Paris (A-Wsa, Konskriptionsamt, B4/3, fol. 39). 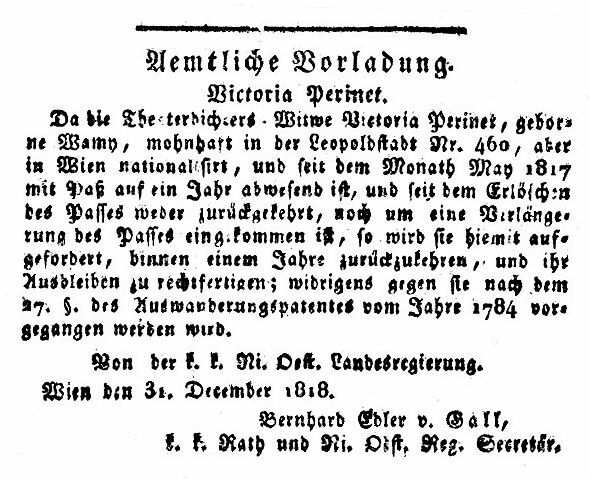 Victoire Perinet overstayed her one-year passport which in December 1818 caused the Lower Austrian government to issue an official summons that was first published on 20 January 1819 in the Wiener Zeitung. Frau Perinet was ordered to return within one year and justify her absence, in default whereof she would face legal action for breaking § 27 of the 1784 emigration law. I. Empfehle ich Gott dem Allmächtigen meine Seele; mein Leichnam soll nach der zweyten Classe, ohne allen Kostenaufwand von meiner Wohnung zur Kirche geführt, allda im Stillen eingesegnet und dann ebenfalls mit dem Todtenwagen zu seiner Bestimung abgeführet. und dann zur Erde bestattet [werden]. II. Sollen 3 heilige Messen, jede zu 5 fl: W:W: gelesen werden. IV. etwas erübriget werden, so ist meine leibliche Mutter ohnehin die natürliche Erbin; da diese aber wegen ihrem schwachen Kopfe kein Vermögen verwalten kann, so ernenne ich Herrn J. C. Hofbauer zu ihrem Vormund, Curator, und Testaments=Executor, mit der Bitte an Ihn, sich meiner Mutter enzunehmen, und sie nicht zu verlassen. V. Muß ich bekennen, daß das in meiner Wohnung stehende Piano-Forte das Eigenthum des Herrn J. C. Hofbauer ist, und er es mir nur geliehen hat. Zur Urkund dieses meiner[sic] ernstlichen und wohlbedachten letzten Willens, habe ich meinen Nahmen unterfertiget, und durch drey hiezu erbethenen Zeügen mit unterfertigen lassen. K:K: pr: Theater a. d.
I. I commend my soul to God Almighty, my body is to be brought according to the second class from my apartment to the church, without any cost, to be consecrated there in quietness and be taken with a carriage to its destiny and be buried in the ground. II. Three Holy Masses should be read at 5 fl Viennese Currency apiece. IV. something be spared, my own mother is the natural heir anyway; but, because of her weak mind, she is unable to manage her assets, I appoint Mr. J. C. Hofbauer her guardian, curator and executor of the will, with the request to take care of my mother and not to forsake her. V. I must confess that the piano that stands in my apartment is the property of Mr. J. C. Hofbauer and that he has only lent it to me. In witness of of this my serious and well-considered last will I signed my name and also had it signed by three requested witnesses. Perinet's creditor Johann Kaspar Hofbauer (1771-1839), whom she requested to take care of her mother, was a wealthy I. & R. stucco and bell maker. In 1822 he lived in the "Glockengießerhaus", Laimgrube 164. Hofbauer, whose acquaintance Perinet had made because he was Ignaz von Seyfried's landlord (A-Wsa, Konskriptionsamt, Laimgrube 164F/4r), was a highly educated man and owned one of the Austrian Monarchy's most famous collections of seventeenth-century Dutch paintings (the best-known painting in his collection was Füger's Die Ermordung Cäsars). 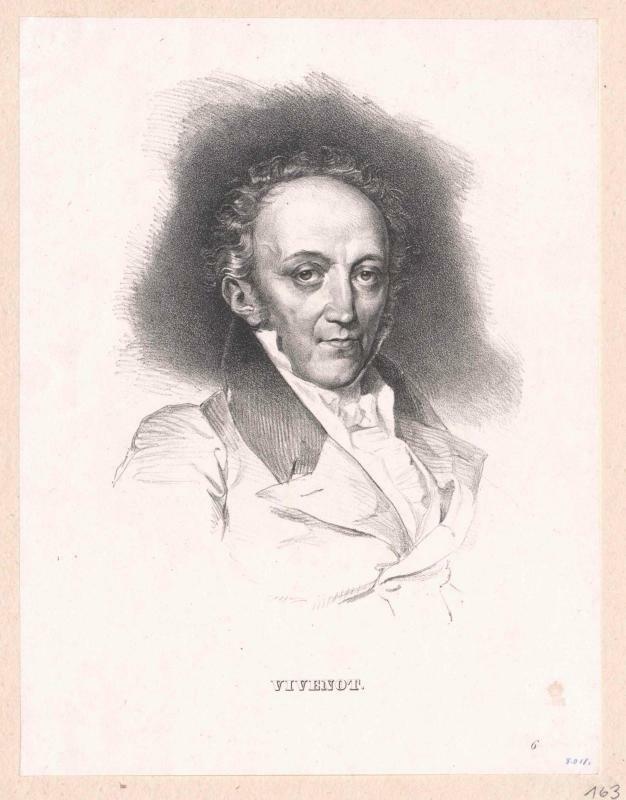 Victoire Perinet died of consumption on 11 January 1822, at the age of 39. Her last residence Laimgrube 34, near the Theater an der Wien, suggests that she was still pursuing her theater career, but she was unable to overcome her severe health problems. In her Sperrs-Relation (A-Wsa, Mag. ZG, A2, 1315/1822) she is referred to as "former theater actress". In the house Laimgrube 34 (torn down in 1969, today a part of the Alfred-Grünwald-Park), where Perinet died in 1822, the guitar builder Christian Frederick Martin Jr. was born on 2 October 1825 (St. Josef ob der Laimgrube 17, fol. 59). 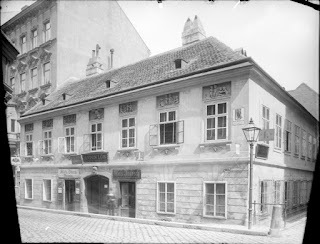 The house Laimgrube 34 (Linke Wienzeile 26) where Victoire Perinet died in 1822 and Christian Friedrich Martin Jr. was born in 1825 (© Vintage Vienna, Katharina Meixner Privatarchiv). The website of Martin Guitar erroneously claims that C. F. Martin Jr. (1825-1888) was born in Germany. At the time of her death Victoire Perinet owned jewelry of surprisingly high value – obviously tokens from her many generous admirers – but her debts to Johann Hofbauer far exceeded these assets. The year 1801 saw Schikaneder at the peak of his career. With the help of the merchant Bartholomäus Zitterbarth, who had lent him 130,000 gulden, he was now director of the new Theater an der Wien and his financial situation was splendid. He also was in love again. The lucky object of his affection was his maidservant Franziska Günschl who had come to Vienna from the small village of Gösing am Wagram where she had been born on 28 February 1777, daughter of the vintner Mathias Günschl and his wife Clara, née Sauerstain. On 6 January 1802 Franziska Günschl gave birth to Schikaneder's illegitimate son Franz Seraph Günschl. Following a family tradition, Schikaneder chose his wife as a godmother, But, quite understandably, Eleonore Schikaneder had herself be substituted by two young ladies: Josepha Kaiser, daughter of a watchmaker, and Anna Berthold, daughter of the "Sackelträger" (sack-bearer) Anton Berthold. 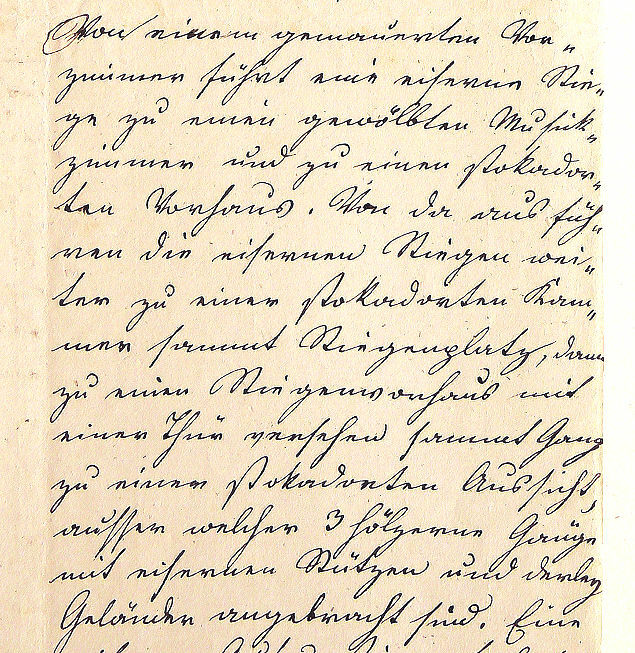 The entry concerning the baptism of Schikaneder's illegitimate son Franz Günschl on 6 January 1802 in the parish church of St. Joseph ob der Laimgrube (St. Josef ob der Laimgrube, Tom. 4, fol. 2). Another, still unpublished source related to this ceremony shows that the child's place of birth, Laimgrube 46 (Laimgrubengasse 4), was the apartment of the midwife Rosalia Sailer. 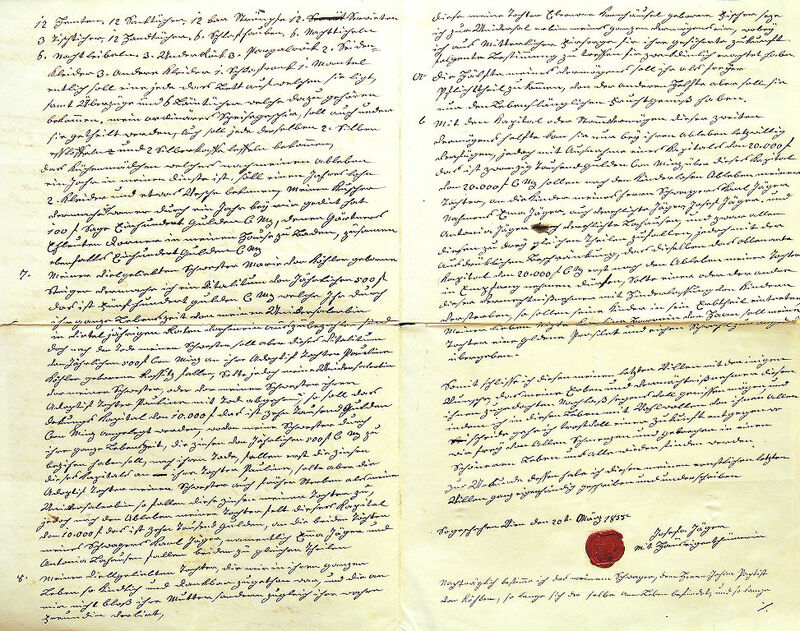 Paragraph 6 of Emanuel Schikaneder's will. 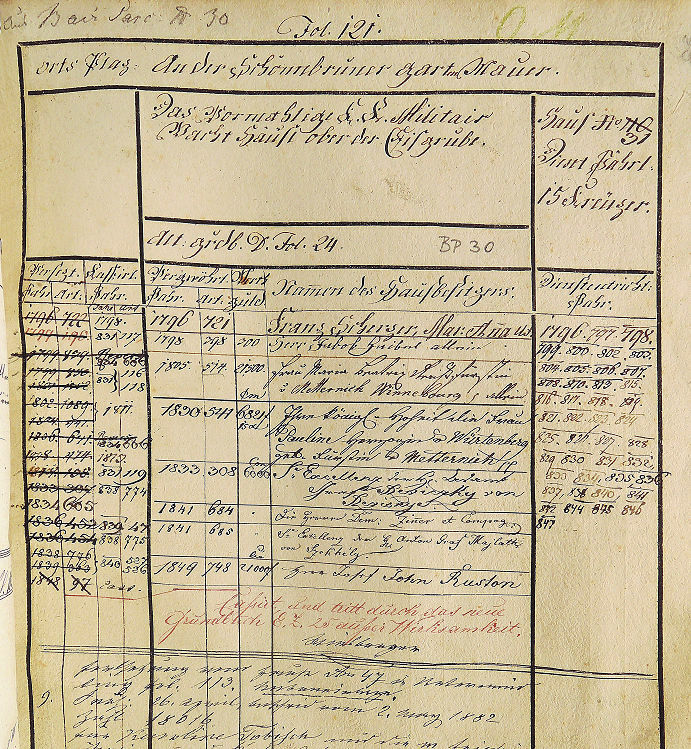 The deletions on the backside of this page were made by Schikaneder in 1804 when he had to cancel his bequests to Ferdinand Neukäufler and several other people (A-Wsa, Hauptarchiv, Persönlichkeiten S 8, Testament, fol. 1r). 6tens legire ich der Franziska Ginschlin ihrem Kinde Franz Schickaneder dreÿ tausend Gulden; dieses Kapital aber soll in öffentlichen Fonds Obligationen depositirt dem Franz Schickaneder als dem Kinde der oberwehnten Franziska Ginschlin erst nach erlangter Großjährigkeit, und Ausweise der richtigen Benutzung als sein freÿes Eigenthum übergeben werden; von denen abfallenden Interessen aber solle das Kind Franz Schickaneder gehörig unterhalten, und erzogen werden, wie auch den nöthigen Unterricht erhalten. [...] Sollte dieses Kind Franz Schickaneder aber vor erlangter Majorennität mit Todt abgehen, gehören diese dreÿ tausend Gulden dessen Mutter Franziska Gischlin. 6th, I bequeath to Franziska Ginschl's child Franz Schickaneder three thousand florins; but this capital is to be invested in public bonds, to be given to Franz Schickaneder, as the child of the above-mentioned Franziska Ginschl, as his free property, only after he has reached legal age and has produced ample proof of the correct use; from the accrued interests the child Franz Schickaneder should be properly supported and educated, as well as receive the necessary tuition. [...] If, however, this child Franz Schickaneder should die before reaching majority, these three thousand florins belong to his mother Franziska Ginschl. 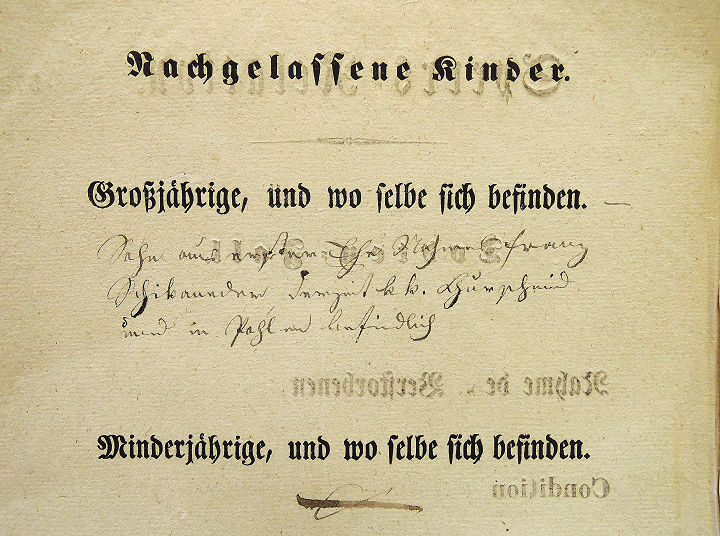 A clip from Andreas Przawerczek's "Herr Emanuel Schikaneder (Aus den Papieren eines verstorbenen Fagotisten)" (Der Gesellschafter oder Blätter für Geist und Herz, 8tes Blatt, 1831, 39). Baur quotes this source, but the fact that she does not even know its correct title suggests that she has never seen the original. To live and let live was his favorite motto and when somebody was in need and turned to him, he certainly helped if he could, sometimes he couldn't. When there were bills to pay, or somebody asked him for money, he called his "General-Intendantin", the pretty parlour maid, and asked: "Franzerl, do we have any money?" If she answered in the affirmative, she had to bring the required amount; if she complained and affirmed that there was nothing in store, he got into a very bad mood and said: "I tell you, these are bad times, you have to come another time, because this is a shabby and piggish administration that never has any money!" He had the funny habit of always scolding himself when he was angry. If mistakes occurred in the orchestra or on the stage, he yelled: "This is a pig-administration, a true lumpen-administration!" He did the same when he had hired a singer or actor who did not please the audience. In that case he ran back and forth on the stage and kept shouting: "This is a lumpen-administration!" 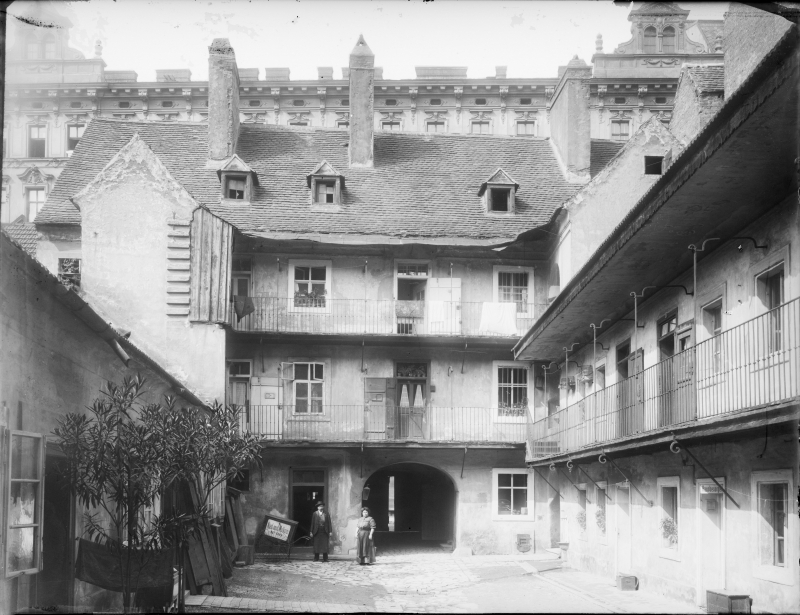 Schikaneder, who in the last few weeks of his life could no longer leave his bed and continuously had to be taken care of, died of "Nervenschwäche" in the house Alsergrund 30, in the apartment of the blacksmith Kaspar Nerpaß and his wife Maria. The reason why Schikaneder lived with this family of all people is quite simple: Maria Nerpaß was the sister of Schikaneder's mistress Franziska Günschl. 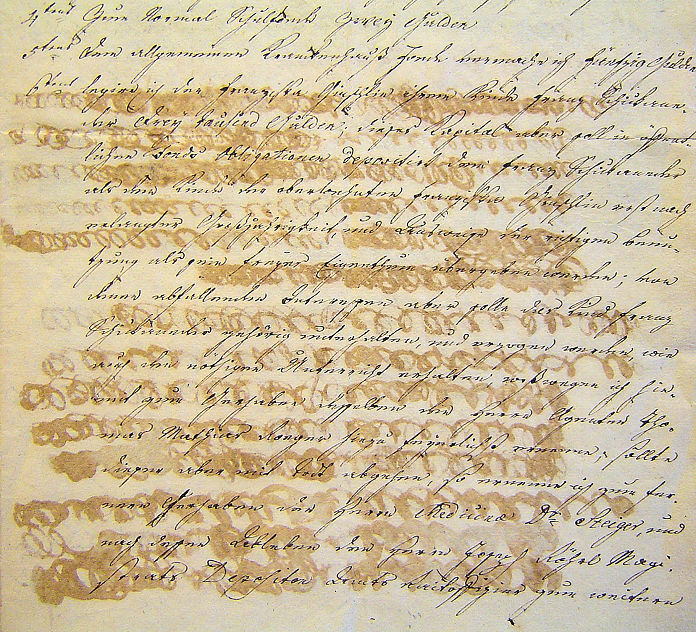 Half of he entry concerning the wedding of Kaspar Nerpaß and Anna Maria Günschl on 7 October 1804 (Maria Treu, Tom. 5, fol. 119). The entry "10. 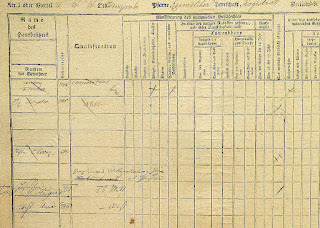 März 1939 1365" at the lower left refers to the issuance of a wedding certificate in 1939 for an Ahnenpass which proves that at that time descendants of Nerpaß's son Anton were still alive. On 26 January 1845 Kaspar's son Anton Nerpaß, who was a blacksmith in Dornbach, married Theresia Nimmerrichter with whom he had several children. (Dornbach 3, fol. 11). Maria Nerpaß, née Günschl died on 14 January 1845 in Dornbach (A-Wsa, Patrimonialherrschaften, Serie 2.1.1.127.A1a, 814). After Emanuel Schikaneder's death Franziska Günschl moved to Dornbach, together with her sister Maria Nerpaß. On 8 July 1813, in Dornbach, Schikaneder's former mistress and factotum married the Hessian blacksmith Jakob Hauck whose acquaintance she had certainly made via her brother-in-law. Similar to Kaspar Nerpaß, who had been born in Partenhaim, Hauck was also a Protestant who hailed from Füllbrunn, a village in the Odenwald area. 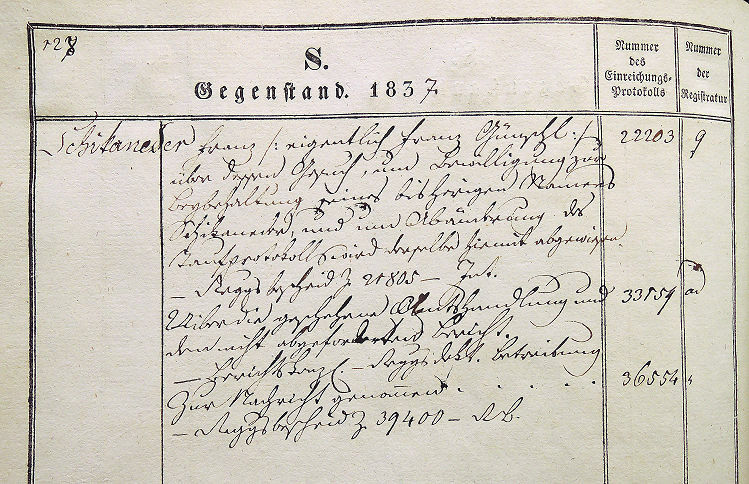 Jakob and Franziska Hauck had a son, Anton, who was born on 10 May 1815 (Dornbach 2a, fol. 116) and already died of hydrocephalus on 25 May 1815 (Dornbach 2a, fol. 96). Jakob Hauck, who owned the house Dornbach 9 (today Dornbacher Straße 115), died of Nervenfieber on 4 January 1816 at the age of 28 (Dornbach 2a, fol. 97). According to his marriage contract, which was attested to posthumously by two witnesses, his wife was his universal heir. But Hauck's estate was deeply in debt and was declared bankrupt by the court of the Herrschaft Dornbach (A-Wsa, Patrimonialherrschaften, Serie 2.1.1.127.A1a, 203). Franziska Günschl's second husband was even younger than her first one: on 4 November 1817, in the Dornbach parish church, she married Moritz Elsässer, a 24-year-old blacksmith from Hirrlingen in Baden-Württemberg who at that time held the post of "Unterschmied" at the I. & R. Academy of Veterinary Medicine. 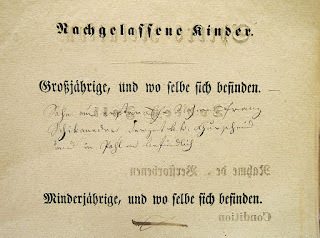 In a marriage contract, which was signed on 5 October 1816, the bride transferred half of her house Dornbach 9 and the license to run a blacksmith's shop ("Schmiedgerechtigkeit") to her future husband. He was to receive half of the house (amounting to 2,000 fl) as dowry which he was to reciprocate "with his person, since he owns no personal assets". The groom committed himself "to put all his abilities and best diligence into the business, to keep the blacksmith's shop in good standing and to increase the family assets". 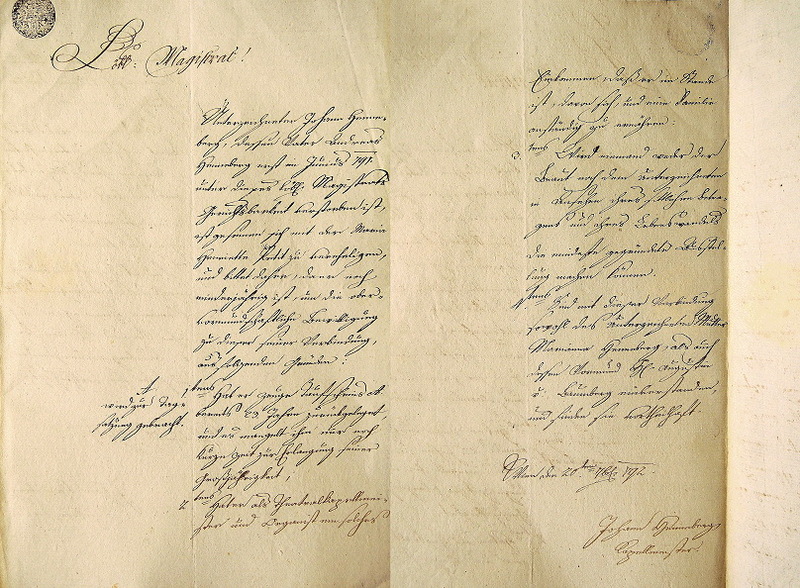 The second page of Franziska Hauck's ("geborene Günschl") and Moritz Elsässer's marriage contract. The dating "1816" could be a mistake (A-Wsa, Patrimonialherrschaften, Serie 2.1.1.127.A1a, 573). 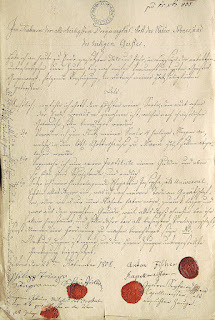 A copy of this contract, which was issued as "Aufsandung", survives in A-Wsa, Patrimonialherrschaften, Serie 2.1.1.127.A3(6). Franziska Elsässer, Schikaneder's former mistress and mother of his son Franz, died on 6 September 1839 in the house Dornbach 9. In the parish register she is described as "Schmidt=Meisterin und Hausbesitzerin", the cause of her death is given as "gänzliche Auflösung der Säfte" (total dissolution of the fluids). She was buried on 8 September at 3 p.m. in the old Dornbach cemetery. 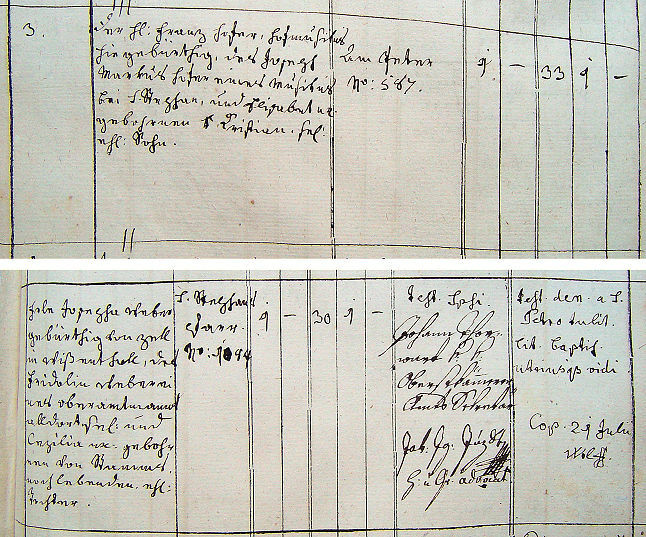 Franziska Elsässer's Sperrs-Relation, drawn up by the court of the Herrschaft Dornbach, shows that her husband's blacksmith's shop had not been successful. 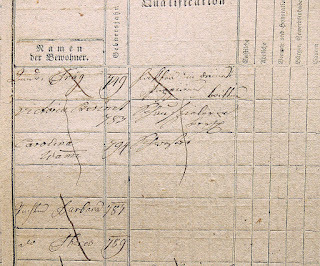 The value of the house, which ín 1839 was estimated at only 3,000 fl, was greatly reduced by a mortgage of 2,200 fl and a number of certificates of debt to various people in Dornbach. Franziska Elsässer's estate only amounted to 54 fl 7,5 x which were reduced to net 13 fl 3,5 x by burial costs, taxes and fees. On 10 September 1849 Franziska Elsässer's second husband Moritz Elsässer married his wife's niece Barbara Nerpaß (1816-1884). For this marriage he received a papal dispense "from the impediment of 1st and 2nd affinity of marriage" (Dornbach 3, fol. 54). Relatives of Franziska Günschl (married Hauck and Elsässer) still live today in Gösing am Wagram where members of the Günschl family have been growing wine since ancient times. The situation of Schikaneder's illegitimate son Franz Günschl, whom his father had left no inheritance at all, was certainly not enviable. Franz Schikaneder (as he soon called himself) completed a blacksmith's apprenticeship, probably in the workshop of his stepfather Moritz Elsässer. On 5 February 1834 (probably with the help of influential admirers of his father) he was lucky enough to secure a position as "certified farrier" in the service of the Vienna Court (A-Whh, OStA, Bd. 22, Nr. 355). Schikaneder Franz |: eigentlich Franz Günschl :| über dessen Gesuch, um Bewilligung zur Beybehaltung seines bisherigen Namens Schikaneder, und um Abänderung des Taufprotokolls wird derselbe hirmit abgewiesen. 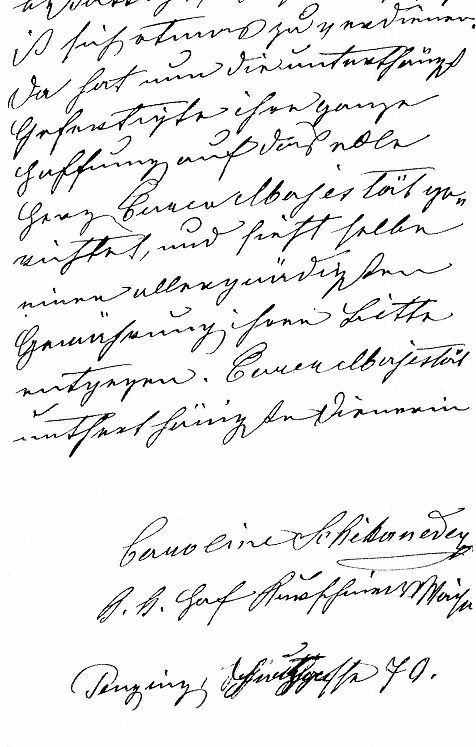 Schikaneder Franz (actually Franz Günschl), regarding his application for permission to keep his present name Schikaneder and to have the baptismal protocol amended, the same is herewith rejected. Although the authorities turned down his request, Schikaneder was not to be deterred and unlawfully kept his chosen name. He seems to have enjoyed the protection of an influential patron. While he was waiting for an opportunity to get married in secret, he already started a family. 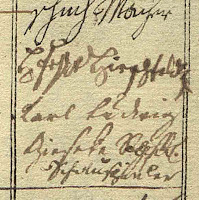 Four illegitimate children of Franz Schikaneder (Günschl) are documented so far. The mother of these four daughters was Katharina Kromes, born around 1805 in Auspitz (Hustopeče), a daughter of the shoemaker Wenzl Kromes and his wife Katharina, née Pilan. 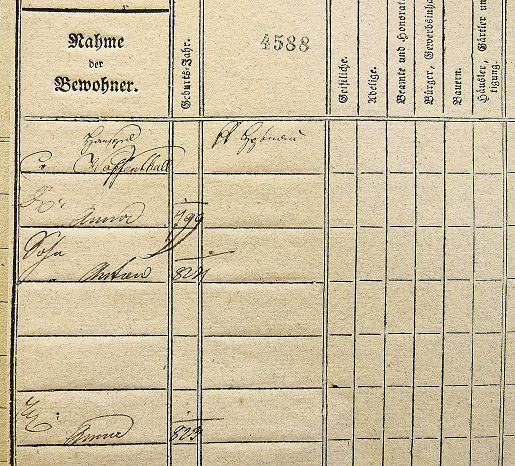 On a conscription sheet of the house Josephstadt 69 (now Lange Gasse 16) from 1831 Franz Schikaneder's name is conspicuously absent. His domestic partner Katharina Kromes is registered as living together with her widowed mother and two of her daughters who are described as "Kath:[arina][sic] Krones 833 Kind der Tocht[er]" and "Franziska Schikaneder 827 Pflegkind [foster child]". 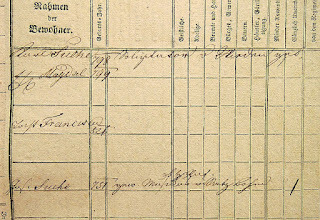 Franz Schikaneder, his future wife, and his daughters Carolina and Franziska appear on a conscription sheet from 1840 related to the house St. Ulrich 76 (today Lerchenfelder Straße 15, the birthplace of Johann Strauss II). Quite understandably, fifteen years before the couple's marriage, Katharina Kromes passed herself off as Schikaneder's wife. Her husband is described as "kk Curschmied v Wien". 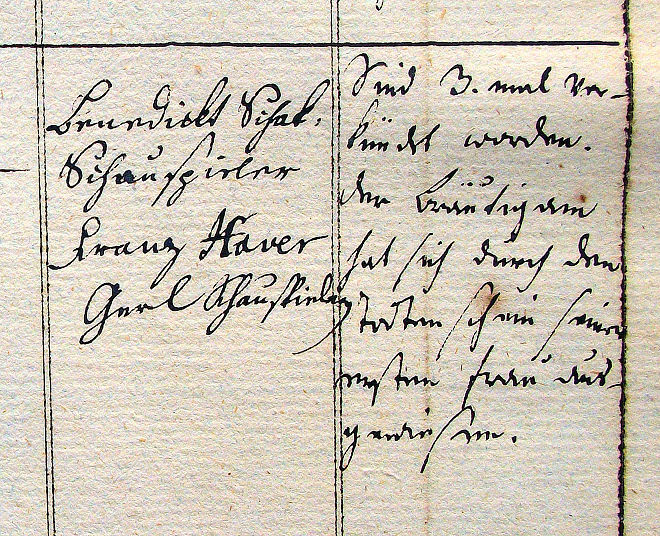 Franz Schikaneder, who in a baptismal register is given as "Sohn des Emanuel - eines Schauspielers" (Maria Treu 13, fol. 127) and who, on the occasion of her baptism, also professed to the paternity of his third daughter Franziska, married the mother of his children but on 16 September 1855 in Reichstadt (today Zákupy). It is obvious that by having this ceremony performed in the remote Bohemian province he wanted to avoid unpleasant questions regarding the legitimacy of his birth. In 1852 Franz Schikaneder was transferred to the staff of the former Emperor Ferdinand I in Prague. After the dissolution of Emperor Ferdinand's staff in November 1875, he retired with an annual pension of 1,000 gulden. He died of old age on 30 June 1877 in the house Piaristengasse 58 and was buried the following day in Vienna's Zentralfriedhof. On 5 July 1877 his widow Katharina submitted a pension request to the Obersthofmeisteramt (A-Whh, OMeA, Karton 981, r. 130/12.3593). With her daughter Caroline she moved to Penzing, Hauptstraße 70, where she died on 2 November 1886. Caroline Schikaneder – the granddaughter of the librettist of the Die Zauberflöte – spent the last decades of her life in great material hardship. Owing to bad eyesight, she was unable to continue her profession as seamstress. In 1886 she asked Emperor Franz Joseph I for a gift of grace and was granted an annual pension of 60 gulden by Archduke Karl Ludwig. Caroline Schikaneder died of cancer on 28 November 1914 in the Lainz nursing home. Johann Emanuel Rundschek was born on 12 January 1802 in an apartment that was part of the living quarters of the Theater an der Wien. The child was baptized on the same day in the church of St. Joseph ob der Laimgrube with Eleonore Schikaneder ("des Emanuel Sch. Schauspieldirektors Gattin") standing godmother. Emanuel Rundschek's parents were the box office controller of the Theater an der Wien Heinrich Rundschek and his wife Elisabeth, née Wipfel (widowed Wolf). The child already died of "Fraisen" on 9 February 1803. This child's father, Martin Heinrich Rundschek, has previously not been the object of Schikaneder research. He was born on 9 October 1778 in the house Wieden 77, "Zur Weißen Rose" (today Wiedner Hauptstraße 26), son of Johann Rundschek, a servant with Count Franz Heinrich von Heussenstamm zu Heißenstein und Gräfenhausen. 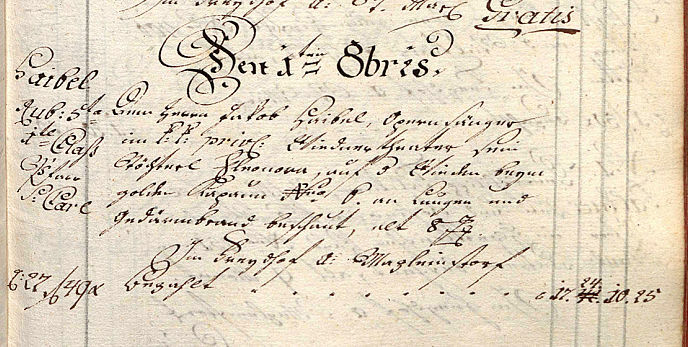 The entry concerning the baptism of Maria Catharina Anna Theresia Rundschek and her twin-brother Martin Heinrich on 9 October 1778 (A-Wd, Tom. 95, fol. 27r.). Count Heussenstamm and his first wife Theresia, who stood godparents to the children, were substituted by two members of the comital household staff. When in September 1801 Rundschek wanted to marry Elisabeth Wolf – who was already five months pregnant – he needed his guardian, the carpenter (and owner of the house Wieden 415) Johann Preiß, to apply to the Vienna municipal court to be granted a marriage permit. Essential for receiving such a permit was a certificate of regular income. 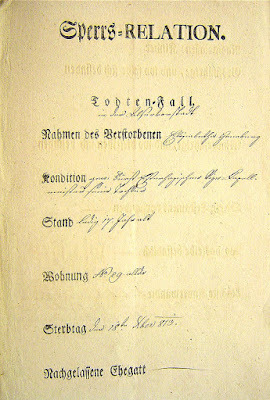 This document was written on 21 September 1801 by Rundschek's friend Friedrich Sebastian Meier and signed by his principal Emanuel Schikaneder. 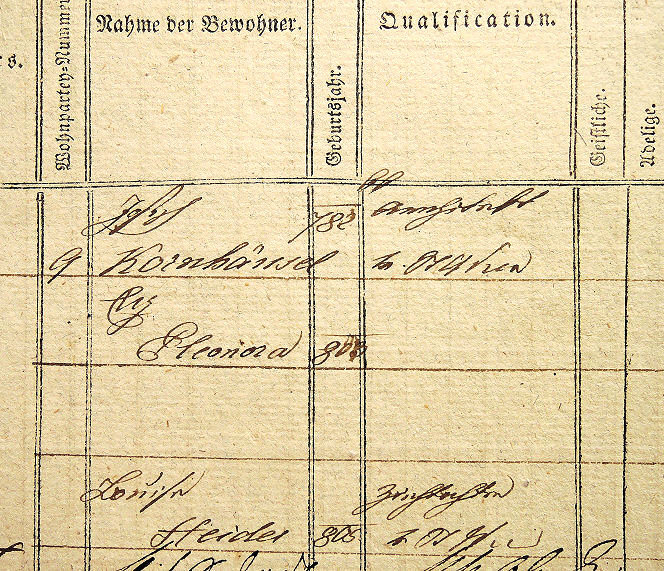 Heinrich Rundschek's certificate of employment, written by Friedrich Sebastian Meier and signed by Schikaneder on 21 September 1801 (A-Wsa, Mag.ZG, A3, 362/1801). Meier is mainly remembered today as first Pizarro in all versions of Beethoven's Fidelio. But since he regularly adapted all kinds of new French operas for the Vienna stage, his influence on the musical taste of the local audience cannot be overrated. Daß Vorzeiger dessen Herr Heinrich Rundschek von Wien gebürtig 23 Jahre alt, Katolischer Religion, bei meinem K.K. priv. Theater an der Wien als Cassa=Controleur mit 300 f jährlicher Besoldung wirklich angestellt seÿ, und seinem mit allem Eifer, und Rechtschaffenheit zu meiner grösten Zufriedenheit seinem Dienste vorsteht, wird auf sein bittliches Ansuchen, indem er sich zu verehlichen gedenkt, zur Steuer der Wahrheit von mir Endesgefertigtem bestättiget. That the producer of this document, Herr Heinrich Rundschek, was born in Vienna, is 23 years of age, Catholic, and really employed as box office controller at my I. & R. privileged Theater an der Wien with an annual salary of 300 gulden, and is carrying out his duty with diligence, integrity and to my greatest satisfaction, is being certified truthfully by me, the undersigned, upon his request, since he's intending to get married. 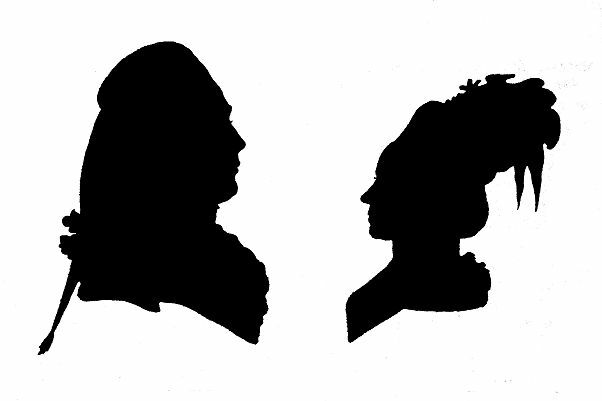 Heinrich Rundschek and Elisabeth Wolf got married on 26 October 1801 in the church of St. Joseph ob der Laimgrube. Elisabeth Wolf had been born Elisabeth Wipfel on 13 September 1764 in Wanzenau (Gars am Kamp 14, 121). Her first husband had been Nikolaus Wolf, a gunner with the I. & R. 2nd field artillery regiment Count Kolowrat- Krakowski. Rundschek's best man was the singer Friedrich Sebastian Meier, the bride's witness was Johann Hornik (b. 1769 in Škvorec, d. after 1828), a clarinetist in Schikaneder's orchestra. Aside from Emanuel the Rundschek couple had no other children. In 1805 Rundschek was registered as "Logenmeister Gehilf" by the conscription officer During the Count Ferdinand von Palffy's tenure at the Theater an der Wien, Rundschek was promoted to the position of "Logenmeister und Billets-Revisor". During his last years he lived near the theater at Laimgrube 15 (today Lehargasse 3). 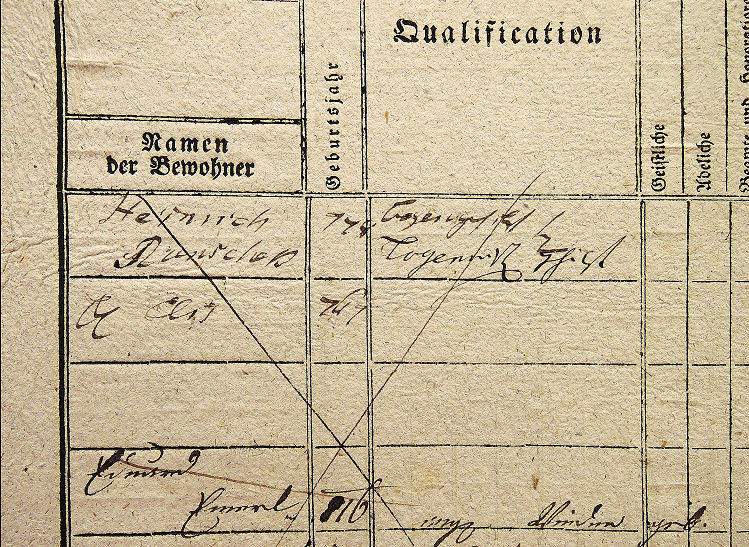 Heinrich Rundschek ("Logenm[ei]st[er] G[e]hilf"), his wife and their foster-son Eduard Emerl registered on an 1805-17 conscription form of Laimgrube 15 (A-Wsa, Konskriptionsamt, Laimgrube 15/1r). Eduard Emerl, born 23 July 1815 (Wieden 7, 32), was a child of Rundschek's sister Aloisia with her second husband, the painter Johann Nepomuk Emerl (1777-1817). Heinrich Rundschek died of Nervenfieber on 23 June 1820. His wife Elisabeth survived him only by four months. She died of uterine cancer on 26 October 1820 at Laimgrube 11 where, after her husband's death, she had moved in with Katharina Herburger, a daughter from her first marriage (see A-Wsa, Mag. ZG, A2, 2410/1820 and 2627/1820). That Heinrich Rundschek's name appears in two sources related to the Theater an der Wien and Schikaneder, suggests that he was closely connected to Schikaneder's circle. When on 15 October 1804 Michael Schütterer, "Feldwäbl beym KK. priv. Theater an der Wien" (the theater's police officer), married Veronika Gröger, Friedrich Sebastian Meier and Heinrich Rundschek signed their names a witnesses to the wedding. 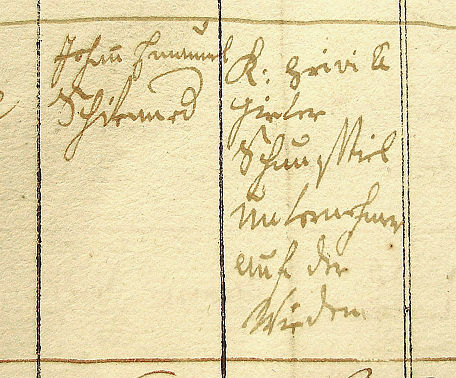 Meier's and Rundschek's signatures in Michael Schütterer's marriage entry in the records of St. Karl (St. Karl, Tom. 4, fol. 2). Schutterer hailed from Uffhausen in the Breisgau (today a part of St. Georgen), his bride was a furrier's daughter from Auspitz in Moravia. The godparents of this couple's four children had no connection to Schikaneder's circle. On 19 January 1804 Ferdinand Rumpel, a glassmaker from Reinhausen (today a part of Regensburg), married Anna Günschl, an older sister of Schikaneder's mistress Franziska Günschl. As witness of the bride officiated Heinrich Rundschek, "Controlor im theater an der Wien". The godmother of Ferdinand Rumpel's first two children, Franziska and Anna, was their aunt (Schikaneder's mistress) Franziska Günschl (St. Josef 3, fol. 142 and 177). Eleonora Maria Anna Fischer was born on 31 January 1803 in the house Wieden 279 (today Große Neugasse 10), illegitimate daughter of Anton Fischer, composer and Kapellmeister at the Theater an der Wien, and his girlfriend Josepha,Steiger. The child was baptized in the Wieden parish church with Eleonora Schikaneder, "Theaterdirektors Ehegattin", standing godmother. 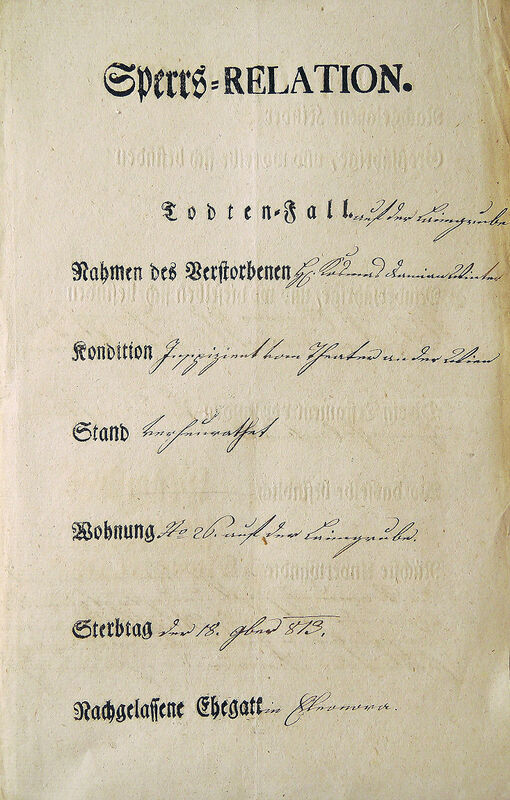 The entry concerning the baptism of Eleonora Fischer on 31 January 1803 (Wieden, Tom. 4, fol. 56). Since in the Wieden parish the years 1802-1808 are recorded in two different baptismal registers, there is a second copy of this entry in Tom. 4a, fol. 30. Given that Eleonora was born illegitimately, it is very likely that the child's place of birth, Wieden 279, was not the address of the mother, but that of the midwife Elisabeth Stummer. After a short engagement with the chorus of the Theater in der Josefstadt, Anton Fischer joined Schikaneder's company at the Wiednertheater. He appeared in small roles, composed several singspiele and after the move into the new building an der Wien he rose to the position of Ignaz von Seyfried's deputy Kapellmeister. 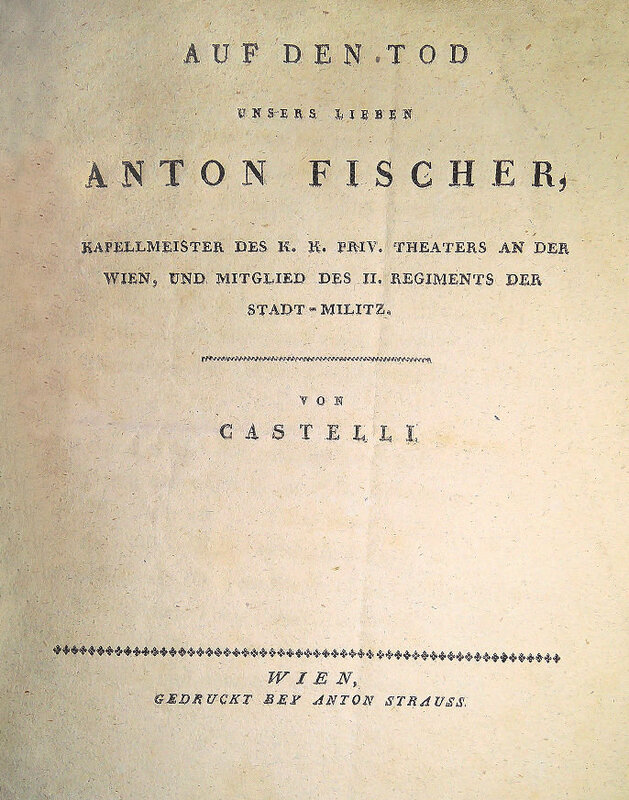 His stage works (written together with Schikaneder, Castelli and Treitschke), such as Swetards Zaubertal (1805), Das Hausgesinde (1808), Die Festung an der Elbe (1806), and Das Singspiel auf dem Dache (1807) all fell into oblivion. His most significant musical works seem to have been his arrangements of operas by Dalayrac and Grétry which helped to popularize the genre of the Opéra comique in Vienna. Anton Fischer and Josepha Steiger got married on 31 May 1803 in the Wieden parish church. The couple's witnesses were Anton Teichmann, lieutenant in the infantry regiment Prince Auersperg, and the official at the K:K: Hof- und Landjägermeister-Amt Anton Fürich (later Fürich von Fürichshain). The groom lived at Laimgrube 23 (now Getreidemarkt 1), the bride's address was Wieden 140 (the Wieden community hall, today Floragasse 1). The entry concerning this wedding in the records of the bride's home parish does not follow the regulations and is incomplete (a common problem at the Wieden parish that – as shown above – also veils the origin of Barbara Reisinger). The entry concerning Anton Fischer's and Josepha Steiger's wedding in the Wieden parish church (Wieden, Tom. 3, fol. 57). On 15 November 1804 Anton Joseph Fürich was to be best man at Joseph von Seyfried's wedding in the Karlskirche (St. Karl, Tom. 4, fol. 4). The previously unknown entry concerning the publication of the banns in the records of Fischer's home parish St. Joseph ob der Laimgrube is far more informative. Among other important data, it gives the names of the couple's parents and the groom's date of birth. The bride had been born in Prague. 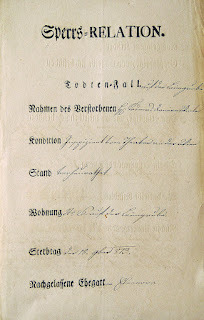 The entry concerning the publication of the banns in the groom's home parish for the wedding of Anton Fischer and Josepha Steiger (St. Josef ob der Laimgrube, Rapular 1802-04, fol. 77). This source has never been digitized. Fischer and his family lived at Laimgrube 23 which at that time was already owned by the architect Franz Jäger senior, the alleged builder of the "Papagenotor". The house Laimgrube 23, at the corner of Getreidemarkt and Wienzeile, where Anton Fischer lived from 1805 until 1808 (A-Wn, ST 2019F). Other tenants of this house of musical relevance included Benjamin Gebauer, Zeno Menzel, Friedrich Treitschke, and Joseph Linke. This building, which housed the legendary Café Dobner, was torn down in 1910. In 1840 the value of this building was estimated at 50,800 gulden (A-Wsa, A2, 6561/1839). 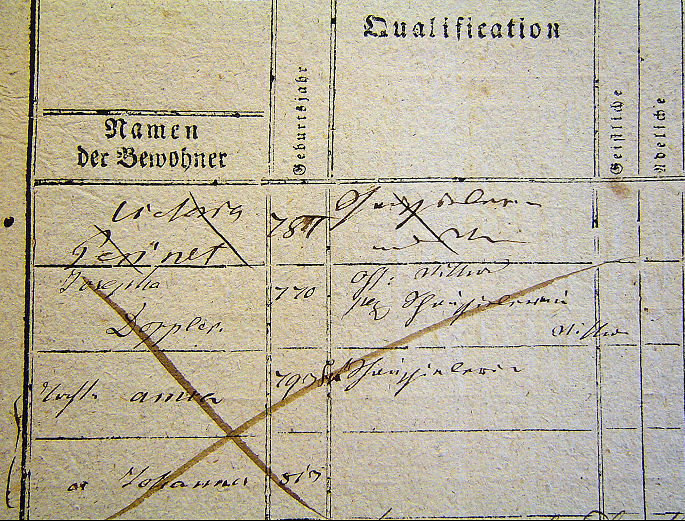 In the earliest series of municipal conscription forms Fischer in 1805 is registered as tenant of apartment No. 6 in this building. He appears on this document together with his family, his mother-in-law Josepha Steiger ("Hauptmanns Wittwe mit Pension"), and his sister-in-law Anna. 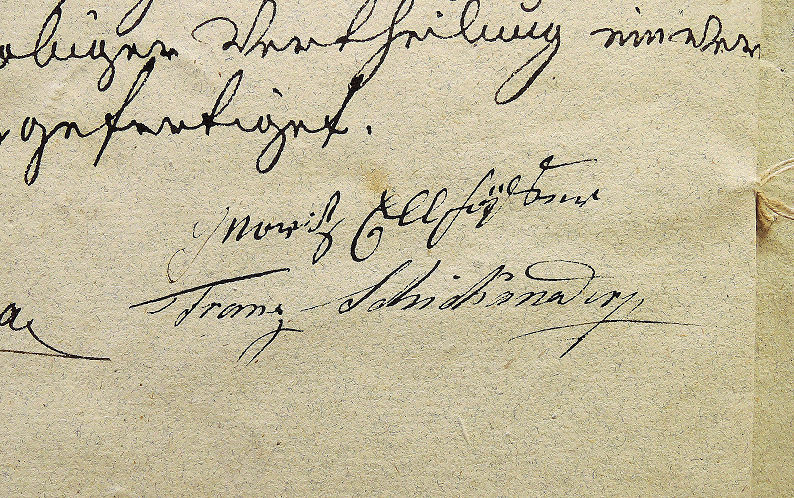 Anton Fischer's family registered in 1805 in the house Laimgrube 23 (A-Wsa, Konskriptionsamt, Laimgrube 23/6r). The note "Wittwe" beside Josepha Fischer's name was added between 1809 and 1810. First, I commend my soul to the Lord Most High, my body however to the earth whereof it was made and which should be buried according to the Christian rite. Second, for the benefit of my soul I order the reading of four Holy Masses which should be celebrated at the church of Maria Hilf. Fourth, I appoint my surviving wife universal heir of everything, movables and all that I leave behind after my death, whatever name it may have, namely for the fair reason that all this came from her alone anyway; and therefore nobody else should have the right to make any demand on the aforesaid estate. On 1 December 1808, in accordance with the codicil mentioned below, Fischer had the following note added on the left margin of the page: "NB. Finally I request and choose as guardian of my minor child Eleonora the Princely Court councilor Mr. Franz v: Haÿmerle". As witnesses to his will Fischer chose his colleagues Philipp Teimer (1761-1817), singer, actor (and former oboist), Benjamin Gebauer (1758-1846), also a former oboist, who in 1808 was employed as violinist, and Ignaz von Seyfried, first Kapellmeister of the Theater an der Wien. Anton Fischer's will, written and signed on 26 November 1808 (A-Wsa, Mag. ZG, A10, 648/1808). It should seem possible that the three witnesses, who were all members of Schikaneder's orchestra, also had children that were godchildren of the Schikaneders. But this is not the case. Von Seyfried (who got married in 1804) chose members of his noble family as godparents. Philipp Teimer did not need Schikaneder as godfather of his children, because his wife Barbara Holzmann (whom he married in 1793) was a cousin of Barbara Schmidt, inkeeper's daughter and mistress of the Swiss banker Johann Heinrich Geymüller whom she bore five children before she married him in 1808. Therefore the godparents of most of Teimer's children were Barbara Schmidt and Geymüller. The opera singer Henriette Teimer (1797-1818), who married and divorced Anton Forti, was named after her godfather Johann Heinrich Geymüller. Via her sister Helene, Barbara Geymüller was also distantly related by marriage to the Gebauer family. 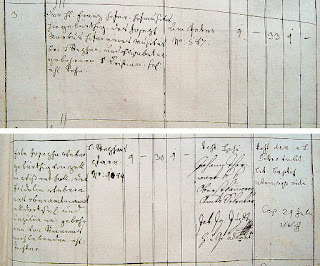 The baptismal entries of Teimer's children show that in 1808 Teimer also lived at Laimgrube 23 (St. Josef ob der Laimgrube 9, fol. 228). Gebauer's second wife Katharina (whom he married in 1804) had no children. Similar to Joseph Suche, Gebauer was one of the last surviving witnesses of the Wiednertheater's golden age. His ignorant contemporaries never bothered to document his recollections. 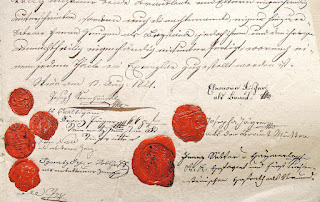 On 1 December 1808, the last day of his life, Fischer added a codicil to his will in which he appointed the I. & R. privy councilor Franz Wenzel von Haymerle guardian of his daughter. Haymerle (1745-1825) was a brother-in-law of Fischer's abovementioned best man Anton Teichmann. 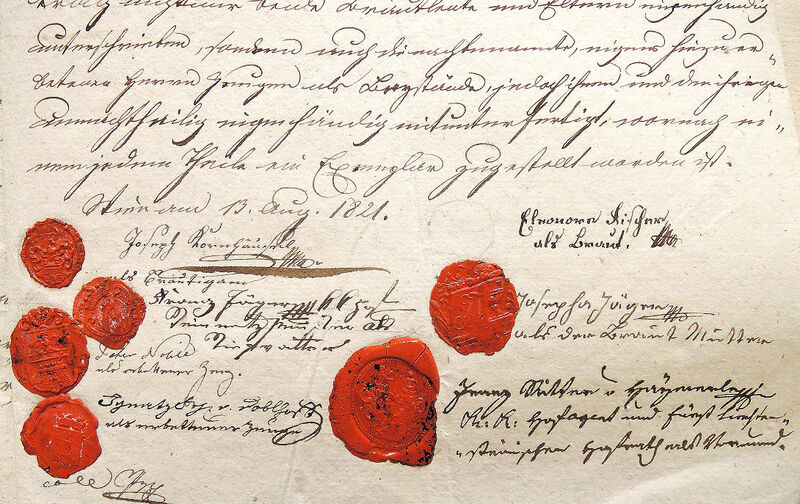 The codicil was again signed by Fischer's colleagues von Seyfried, Gebauer, and Teimer. Als Vormund meiner hinterlassenen Tochter Eleonora, benenne ich den K. K. Hofagenten und Fürst Lichtensteinischen Hofrath Herrn Franz Ritter v Haÿmerle, dessen Einwilligung ich bereits hinzu erhalten habe. Wienn den 1ten Dec: 808. Anton Fischer died on 1 December 1808 and was buried on 4 December 1808 in the Hundsturm cemetery. Mathias Franz Perth attended the funeral and in his diary preserved a copy of the leaflet with a memorial poem by Castelli that was handed out at the cemetery. (A-Wst, Perth, Tage-Buch, C H.I.N. 226988/16). Ich Joseph Prosper Pichler Pfarrer zu Wien in der Vorstadt Laimgrube bezeuge hirmit, daß Herr Anton Fischer Kapelmeister im K.K. Theater an der Wien katholischer Religion, wohnhaft auf dem Grunde Laimgrube N° 23. alt 31 Jahre, den ersten Dezember des Eintausend siebenhun achthundert und achten Jahrs verstorben, und den vierten darauf zur Erde bestattet worden seÿ. Zur Urkund dessen habe ich diesen Todtenschein eigenhändig unterschrieben und das Pfarrsiegel beÿgedrückt. Wien den 9t April 1810.
bey St. Joseph wie oben. I, Joseph Prosper Pichler, parish priest in Vienna, in the Laimgrube suburb, herewith certify that Mr. Anton Fischer, Kapellmeister at the I. & R. Theater an der Wien, Catholic and living at Laimgrube No. 23, 31 years of age, died on December 1st of the one thousand eight hundred eighth year and was buried on the following 4th. In witness whereof I have signed this death certificate with my own hand and printed the parish seal on it. Fischer's widow was left in dire financial circumstances and it is very likely that Schikaneder organized a charitable collection in her favor (for a detailed description of Fischer's estate see Lorenz 2013). On his deathbed Fischer had finished his last work, the romantic opera Theseus und Ariadne based on a libretto by Stegmayr. Josepha Fischer's situation was soon to take a turn for the better. At Laimgrube 23 she had befriended her landlord's son, the master mason Franz Seraph Jäger (1781-1839), whom she married on 10 June 1811 (St. Josef ob der Laimgrube 6, fol. 23). Jäger's best man was Joseph Reymund, one of the architects of the Theater an der Wien. The bride's witness was her daughter's guardian, the abovementioned Hofrat Franz von Haymerle. 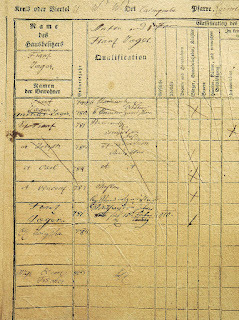 The families of Franz Jäger senior and Franz Jäger junior registered on a conscription sheet of the "Jägersches Haus", Laimgrube 23 (A-Wsa, Konskriptionsamt, Laimgrube 23/1r). 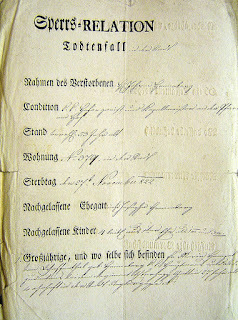 This document shows five chronological phases: 1) In 1805 the names of Franz Jäger senior ("Steinmetzm[eister] Wittwer") and four of his sons were entered as residents of apartment No. 1. The son Anton Jäger is missing, because he lived in another apartment. 2) After Franz Jäger's death in January 1809, his name was crossed out and the name of Anton Jäger, one of the new house owners, was added (the name "Andreas" is a mistake). At the very top are the names of the new house owners, Anton and Franz Jäger junior. The names of Jäger's sons were crossed out, except for Franz whose name was overwritten with a bolder script. 3) In 1810, Franz Jäger junior's name was entered for a second time, this time with the note "Mithausinhaber seit 15t Febr 810." 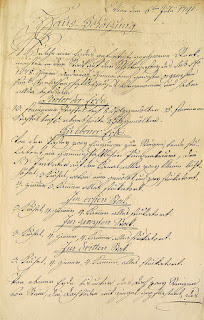 4) After Jäger's wedding the note "ledig" was crossed out and the names of his wife and his stepdaughter ("St Tocht Eleon Fischer 803") were added. 5) After 1821 the note "veh" (married) was added to Eleonora Fischer's name. With Rohrweck to the Wilder Mann, we talked about Kornhäusel's ingratitude – he ows him 10,500 fl. – and of his wedding on Thursday the 4th with Miss Fischer, Jäger's stepdaughter. Nobile was best man. Joseph Rohrweck (1766-1830) was a wealthy I. & R. glass dealer who owned a shop on the Graben. In 1818 he had accompanied Kornhäusel on a journey to Italy and it seems that Kornhäusels's debts had been contracted during this adventure. 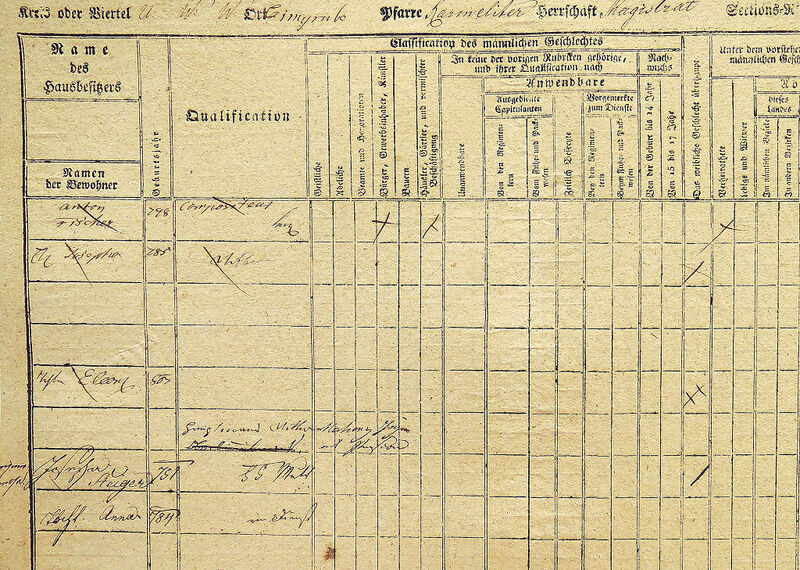 Because Eleonore Fischer in 1821 was a half-orphan and a minor, her guardian and her mother had to apply for a marriage permit to the "Ober-Gerhab", i.e. the Vienna Magistrate. 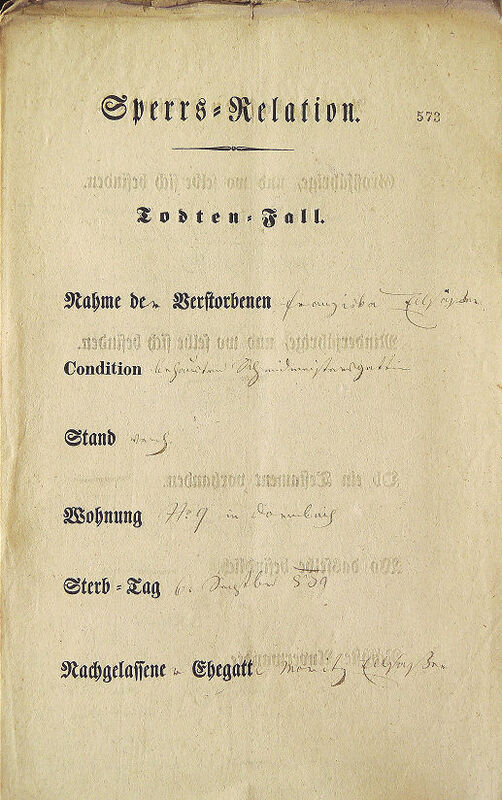 This application is included here, because it is a significant and previously unknown document related to the biography of Joseph Kornhäusel who was one of the most important Austrian architects. Wohllöblicher Magistrat der K:K: Haupt und Residenzstadt Wien! Die unterzeichnete Mutter, und Vormünderin ihrer, in erster Ehe mit dem, im Jahre 808. verstorbenen Kapellmeister ob dem K:K: privilegirten Theater an der Wien Anton Fischer erzeugten, und laut Taufschein A. achtzehen Jahre alten Tochter Eleonora Fischer bittet um die obervormundschaftliche Bewilligung: dieselbe mit dem Herrn Joseph Kornhäusel, Architekten, und Kunstmitglied der hiesigen K:K: Akademie verehlichen zu dürfen, und um Begenehmigung des hier sub B. anliegenden Heurathsbriefes. Bekanntermaßen hat ihre Tochter nach dem Ableben ihres Vaters nicht das mindeste Vermögen ererbt, und es war für Mutter und Tochter ein wahres Glük, daß Unterzeichnete mit dem K:K: Hof- und bürgerlichen Steinmetzmeister Franz Jäger zur zweÿten Ehe geschritten ist, welcher sich nicht als ein Stief- sondern [fol. 1v] wahrer Vater, und Wohlthäter gegen ihre Tochter bewiesen hat, da er derselben nebst allen nothwendigen weiblichen Arbeiten, auch Musik und die französische Sprache lehren ließ, und sich mit der Unterzeichneten bestrebte, ihr eine christliche und sittliche Erziehung zu geben. Diese Wohlthaten setzet derselbe noch fort, da derselbe auch ihre nothwendige Ausstattung und Haußeinrichtung übernommen hat. Was nun ihren künftigen Ehegatten Herrn Kornhäusel betrift, so ist derselbe als einer der rechtschaffensten Männer, und geschiktesten Architecten bekannt, der nicht nur ein hinlängliches Vermögen, um seine Ehegattin gut und anständig zu ernähren, sondern auch einen ansehnlichen jährlichen Verdienst besitzet, übrigens, in Hinsicht seines moralischen und guten Characters dem Ehegatten der Unterzeichneten von seiner ersten Jugend an, vollkommen bekannt ist. Mit diesem Ansuchen vereinigt auch der unterzeichnete Vormund seiner Mündel Elonora Fischer das [fol. 2v] Seinige, welcher nicht nur alles, von der Mutter hier angeführte sowohl in Hinsicht des vortreflichen Stiefvaters, als des Bräutigams, der reinen Wahrheit gemäß bestättiget, sondern auch, als vollkommen mit den dießfälligen Personen, und Familienverhältnißen bekannt, mit voller Überzeugung versichern kann, daß seine wohlerzogene, und ausgebildete Mündel in dieser Ehe nebst ihrer guten Versorgung ihr Glük finden, aber auch jenes, ihres künftigen Ehegatten sicher machen wird. Wien am 1t August 821. Franz Ritter v Haÿmerlemp als Vormund. Most honorable Magistrate of the I. & R. Capital and Residential City of Vienna! 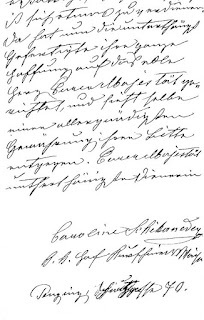 The undersigned mother and guardian of her daughter Eleonora Fischer, from her first marriage with the Kapellmeister of the I. 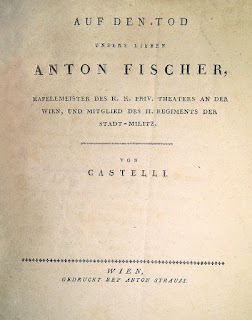 & R. privileged Theater an der Wien, Anton Fischer who died in 1808, and, according to the baptismal certificate A. is eighteen years of age, requests the superior guardian's permission to be allowed to marry her with Mr. Joseph Kornhausel, architect, and artistic member of the local I. & R. Academy, and to approve the marriage contract hat is attached as B. As is known, her daughter, after her father's death, did not inherit the slightest fortune and for mother and daughter it was a true godsend that the undersigned entered into her second marriage with the I. & R. court and civil master mason Franz Jäger, who not only proved himself as stepfather, but as true father and benefactor to her daughter, since, together with all necessary feminine skills, he also had her tought in music and the French language, and, together with the undersigned, endeavored to provide her with a Christian and moral education. The aforesaid is still continuing these good deeds, since he also bears the costs of her necessary endowment and furniture. As far as to her future husband Herr Kornhäusel is concerned, he is known as one of the most righteous men and most skillful architects, who not only has a sufficient fortune to support his wife well and decently, but also has a considerable annual income, and, by the way, in regards of his moral and good character is well known from his earliest youth on to the husband of the undersigned. 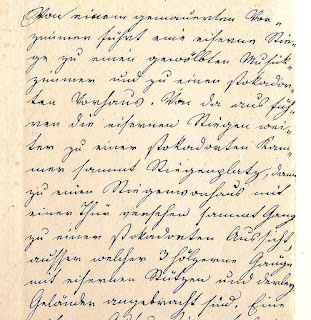 With this request, the undersigned guardian of his ward Elonora Fischer also unites his own, who not only, in accordance with the absolute truth, confirms all the statements made here by the mother, both in regards of the virtuous stepfather and the bridegroom, but, as someone who is fully acquainted with the persons and the circumstances of the family, can also assure with full conviction that his well-behaved and educated ward will find happiness together with good care in this marriage, and will also secure that of her future husband. Franz Ritter von Haÿmerle as guardian. 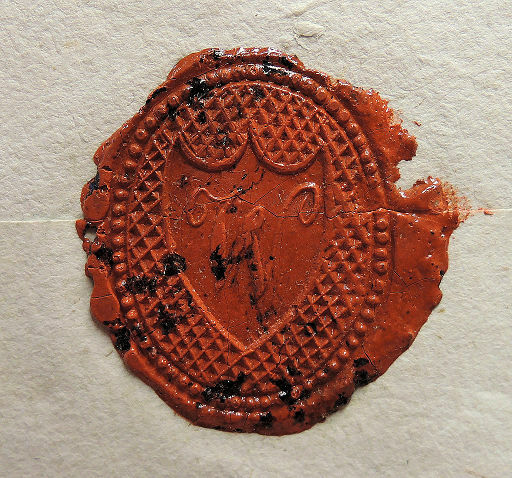 The signatures and seals in the same contract (A-Wsa, Mag. ZG, A3, 459/1821). 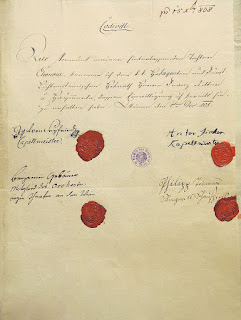 The witness Anton Jäger did not sign this document. Joseph Kornhäusel's and Eleonore Fischer's wedding took place on 4 October 1821 in the church of St. Joseph ob der Laimgrube. The witnesses of the bride were the architect Anton Jäger and her guardian von Haymerle, the groom's witnesses were Franz Jäger, the architect Peter Nobile, and Baron Ignaz von Doblhoff. 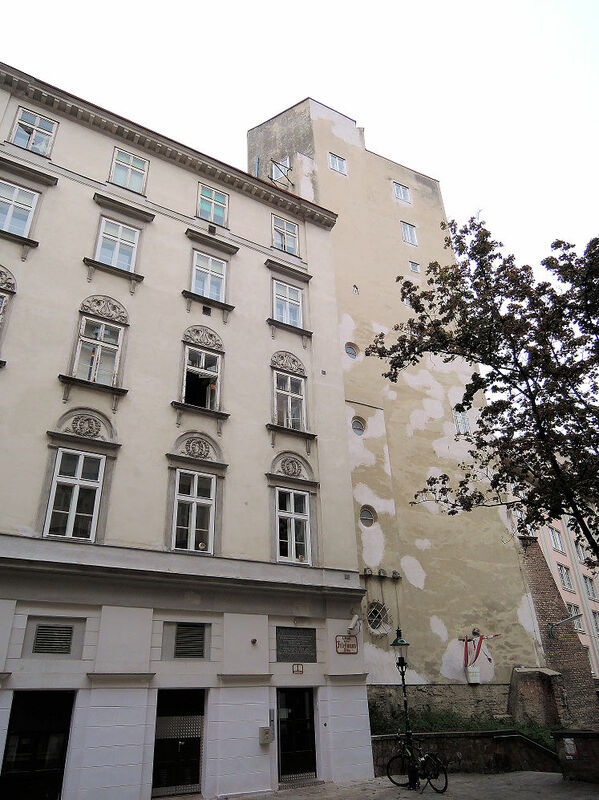 The newlyweds continued to live in Franz Jäger's house, Laimgrube 23. Kornhäusel's marriage to Jäger's stepdaughter soon began to pay off financially. In January 1824 he managed to secure the contract for the construction of the new Stadttempel of the Jewish community and on 21 August 1824, together with his wife and his parents-in-law, he bought the house Stadt 495 (today Judengasse 14) (A-Wsa, Grundbuch B1/28, fol. 244). Beginning in 1825, the synagogue in the Seitenstettengasse and the neighboring building were rebuilt at the same time. To the house Stadt 495 Kornhäusel added a 35-meter-high tower – the so-called Kornhäuselturm – whose immediate purpose is varyingly described in the literature. The popular information that Kornhäusel built this tower "as his office", or designed it "to be able to escape from his nagging wife" cannot be corroborated by archival sources. In 1830 Kornhäusel and his wife are documented to have still resided at his father-in-law's house Laimgrube 23. At that time they took care of a foster-daughter named Louise Heider (of whom nothing more specific is known). Already during his first marriage, Kornhäusel had provided home for a foster-daughter whose name was Josepha Prischel (or Beschel) (A-Wsa, Konskriptionsamt Wieden 29/10r, and Stadt 74/7r). Kornhäusel's father-in-law, Franz Jäger, died in 1839. 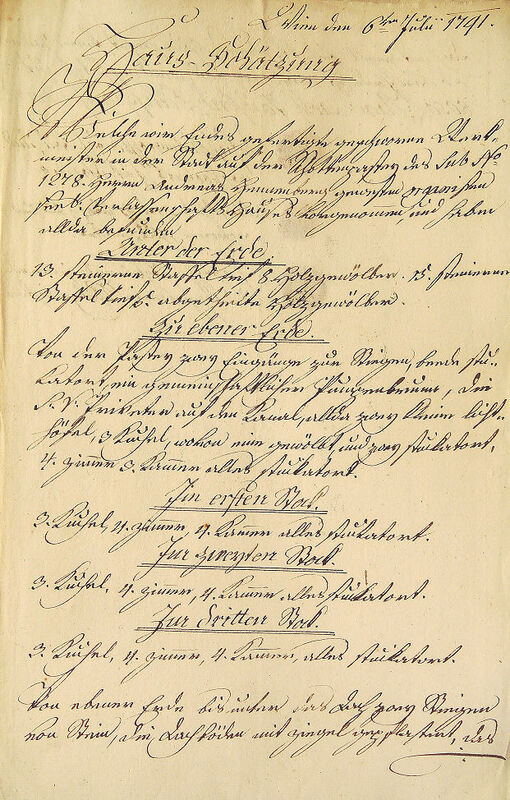 Since he owned a share of Stadt 495 (in addition to shares of four other houses in the Stadt, on the Wieden and the Laimgrube), his probate file contains a detailed description and evaluation of Stadt 495 and the Kornhäuselturm. This document does not describe the biggest and domed room in the tower as office, but as "Musikzimmer" (music room). This suggests that there was a piano in the room at that time. The description of the tower in Franz Jäger's Sperrs-Relation referring to a "gewölbtes Musikzimmer" inside the Kornhäuselturm below the tower's upmost floors (A-Wsa, A2, 6561/1839). The original construction plans of the Kornhäuselturm in the holdings of the municipal Unterkammeramt (A-Wsa, Unterkammeramt, Serie 1.1.2.A33, alte Baukonsense 11435/1825 and 12062/1826) have been targetedly removed. Von einem gemauerten Vorzimmer führt eine eiserne Stiege zu einen gewölbten Musikzimmer und zu einen stokadorten Vorhaus. Von da aus führen die eisernen Stiegen weiter zu einer stokadorten Kammer sammt Stiegenplatz, dann zu einen Stiegenvorhaus mit einer Thür versehen sammt Gang zu einer stokadorten Aussicht, ausser welcher 3 hölzerne Gänge mit eisernen Stützen und derley Geländer angebracht sind. A section of Stadt 495 with the Kornhäuselturm seen from the south-west. This side of the tower only became visible in 1910 when the adjacent Dreifaltigkeitshof was torn down. In 1840 the value of the house Stadt 495 was estimated at 35,000 gulden. 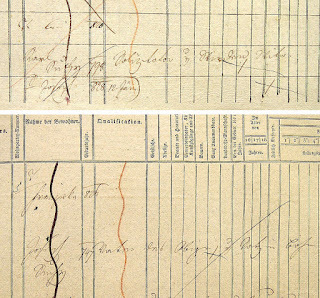 Kornhäusel's father-in-law, Franz Jäger, left an estate of about 104,100 gulden (A-Wsa, A2, 6561/1839). 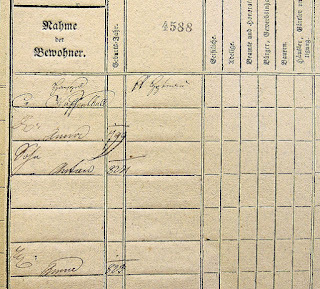 In 1841 Kornhäusel is documented for the first time as residing at Stadt 495, albeit not definitely. 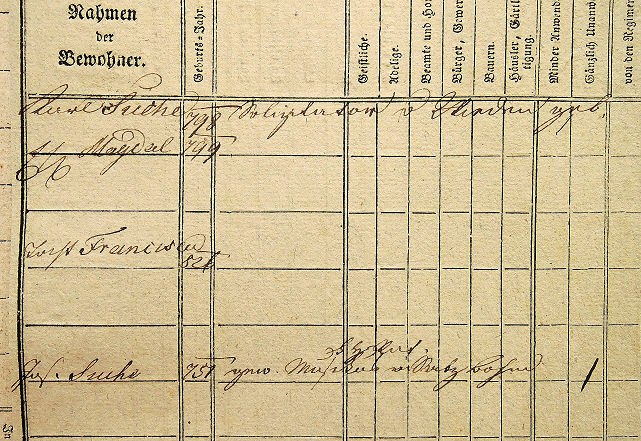 On 29 July 1841 he applied for a one-year passport to Milan and the Austrian states (A-Wsa, Konskriptionsamt, B4/30, fol. 363) in which he gave Laimgrube 23 as his main address and Stadt 495 as his "current" residence. In 1842 the passport was extended for one more year. Only in 1846 Kornhäusel and his wife finally moved into their house in the city. At some point during the 1850s Joseph and Eleonore Kornhäusel got divorced. 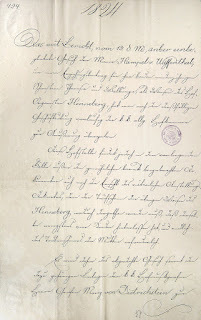 The exact date cannot be determined, because the file related to this case either burned in 1927, or, if it survived, is damaged and therefore not accessible in the holdings of the Landesgericht für Zivilrechtssachen. The fact that in 1856 Kornhäusel sold his country estate in Hinterbrühl, suggests that in that year he had to pay off his wife. 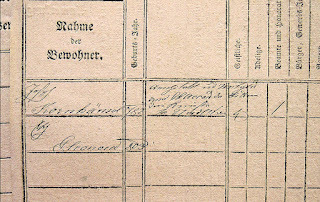 Kornhäusel must have been the guilty party in his divorce case, because already on 1 February 1849 he assigned his share of Stadt 495 to his wife (A-Wsa, Grundbuch B1/2a, fol. 191v). Kornhäusel, who, given his many lucrative commissions, should have died a wealthy man, left assets of only 2,041 gulden 36 1/4 kreuzer which in his will – written on 10 October 1860 – he bequeathed to his housekeeper Barbara Trimmel. 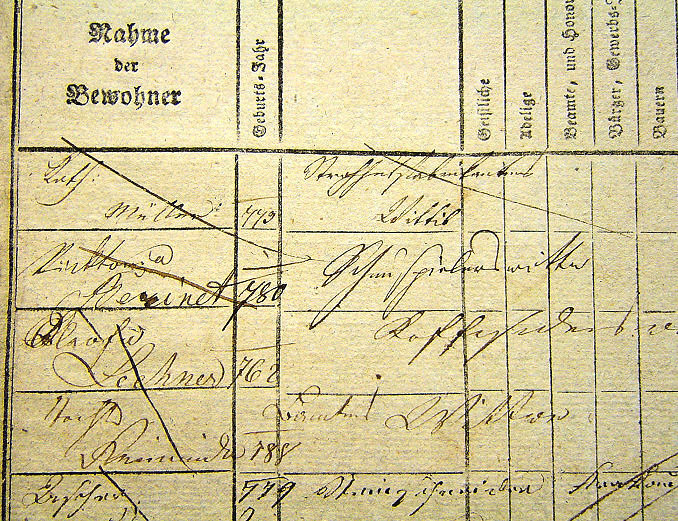 The fact that in 1860, at the time of his death, Kornhäusel owned no real estate is the reason why his probate file survived in the holdings of the Bezirksgericht Innere Stadt (as of 1850 the estates of house owners were settled by the Landesgericht für Zivilrechtssachen and mostly burned in 1927, like, for instance, the 1863 probate file of Kornhäusel's mother-in-law). 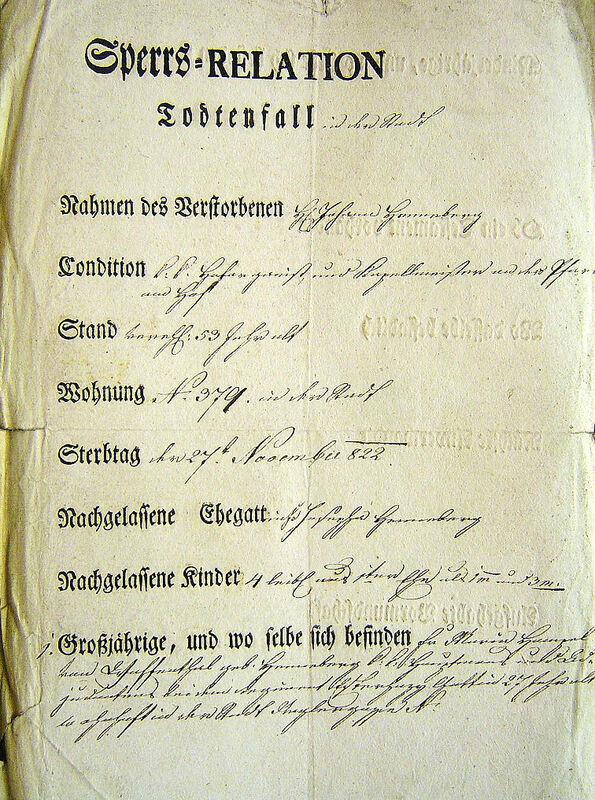 One of the two original copies of Joseph Kornhäusel's will (A-Wsa, Landesgericht f. ZRS, 3485/1860). This document was damaged in 1927 in the Palace of Justice fire and is therefore not regularly accessible. I was able to scan it with the generous permission from the archive's restaurator. A) Half of my fortune should go to her as a free statutory share, from the other half she should only draw the lifelong interests. B) Of the common capital or common property of this second share she can dispose only in her will, but with the exception of a capital of 20,000 f, that is twenty thousand gulden Assimilated Coinage. This capital of 20,000 f, after her childless death, should go to the children of my brother-in-law Karl Jäger, namely Emma Jäger, the aforesaid Mr. Jäger, Josef Jäger and Antonia Jager, married Lochauser, in three equal shares, but with the explicit condition that they may receive the above-mentioned capital of 20,000 f CMz only after the death of my daughter. 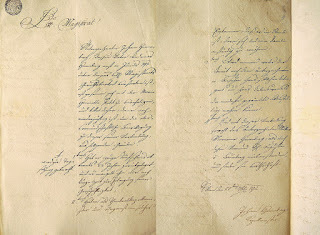 Two pages of Josepha Jäger's will written on 20 March 1855. This document survived by pure coincidence (A-Wsa, Serie 2.3.1.1b.A9, 41/1). On 21 November 1864 Eleonora Kornhäusel married Victor Ignaz Wickerhauser, a widowed cash controler with the Austrian National Bank, who was almost 17 years younger than her. In the records of St. Stephen's the bride is referred to as "Frau Eleonora Maria Anna Kornhäusel, Wittwe des Herrn Joseph Kornhäusel, K.K. Architektens und Mitglieds der K.K. Akademie der bildenden Künste, von Wien, Pfarre zu den Hl. Schutzengeln gebürtig des H. Anton Fischer Musik-Kompositeurs und der Josepha Steiger, beide verstorben und kath. Relig. ehl. Tochter". Eleonora Wickerhauser, Eleonore Schikaneder's last surviving goddaughter, died of pneumonia on 8 January 1870, at 5:30 p.m. at Stadt 495. In her will (which was either destroyed in 1927, or is still inaccessible due to fire damage) she must have expressed the wish to be buried in the Jäger family crypt in the Hundsturm cemetery where her mother and her stepfather were buried. Her burial in this crypt took place on 11 January 1870. When the Hundsturm cemetery was closed in 1923, the members of the Jäger family were not exhumed. Their grave is lost. Ironically, the unfaithful husband Joseph Kornhäusel, who had been buried in St. Marx, was exhumed in 1934 and transferred to an honorary grave in the Vienna Zentralfriedhof. Cosmas Damian Winter was born in 1761 in Würzburg in Germany. From 1784 until 1786 he appeared in performances of Walter's company in Regensburg (Mettenleitner 1866, 265). When in 1787 Schikaneder's company came to Regensburg, Winter joined Schikaneder's troupe, together with his colleague Karl Ludwig Gieseke. In 1790, in Vienna, in the performance of Der Stein der Weisen, Winter played the role of Astur, and in 1791 he took his stake of immortality by appearing as Sprecher in the premiere of Die Zauberflöte. On 30 July 1792 Cosmas Damian Winter married Eleonora Forchtner. 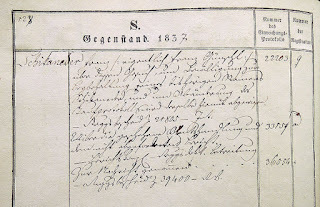 The family background of the bride is veiled by the same inexactitude in the Wieden parish records that also hides the origin of Barbara Reisinger (see above). The groom's best man was his old fellow actor Karl Ludwig Gieseke. 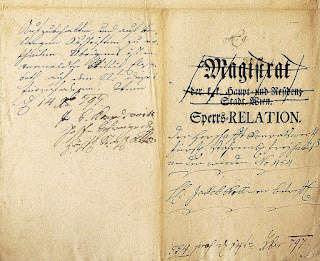 Karl Ludwig Gieseke's signature from 30 June 1800 in one of Otto Hatwig's abums (A-Wst, H.I.N. 2607). Already in 1800 Gieseke was a "I. & R. privileged" mineral dealer. At the time of their wedding Winter and his bride lived at Wieden 119 (now Margaretenstraße 21). Like in the case of Franz Xaver Gerl (see above), Winter's address was no coincidence: from 1789 until 1804 the house Wieden 119 (last number 479) was owned by Gieseke's friend, the mineral dealer Johann Weiß (Hofbauer 1864, 204). 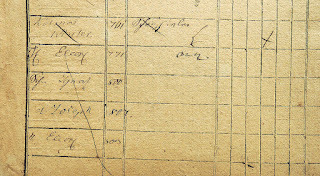 A signature of Winter survives in the 1789 marriage records of the Wieden parish. When on 26 October 1789 the scribe Joseph Dimler (possibly an employee of Schikaneder) got married to Magdalena Vormund, Schikaneder's prompter Caspar Biedermann and Cosmas Damian Winter signed as witnesses. Cosmas Damian Winter's daughter Eleonora Winter was born on 19 December 1803 in the building of the Theater an der Wien, Laimgrube 26, and baptized in St. Joseph ob der Laimgrube. Eleonore Schikaneder officiated as godmother. 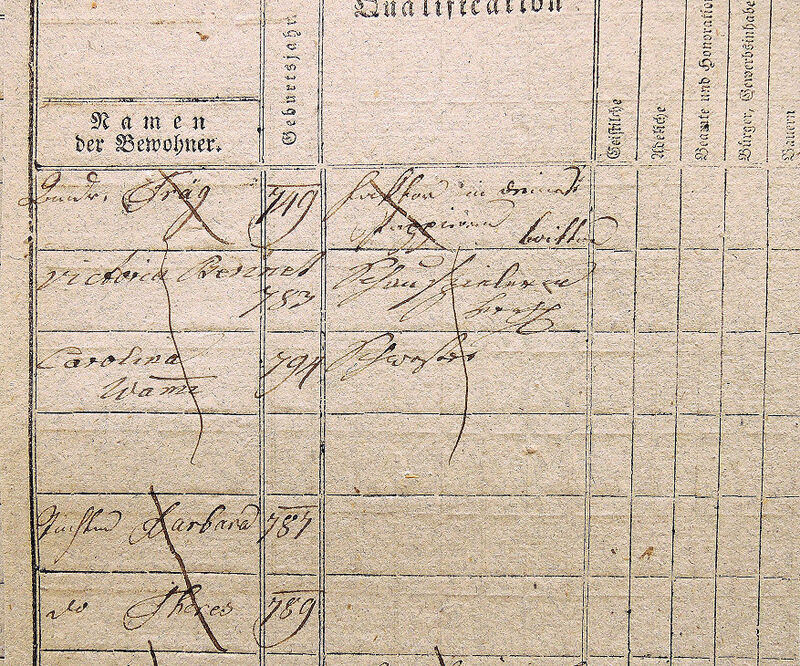 In 1805 the Winter family was registered by the conscription office as living at apartment No. 2 in the building of the Theater an der Wien. Eleonore Schikaneder's goddaughter appears at the bottom of the list. 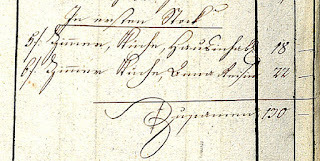 Cosmas Damian Winter, his wife and his thre children registered in 1805 as tenants at the Theater an der Wien (A-Wsa, Konskriptionsamt, Laimgrube 26/2r). Winter's younger son Joseph, born on 21 December 1807, also had an interesting godmother: Josepha Hofer, opera singer, and daughter of Franz and Josepha Hofer (at that time already Josepha Meier). This boy's full name "Joseph Friedrich Sebastian" shows that he was also named after his godmother's stepfather Friedrich Sebastian Meier. The godmother is referred to as "des sel. Franz Hofer K. Hofmusikus Tochter". 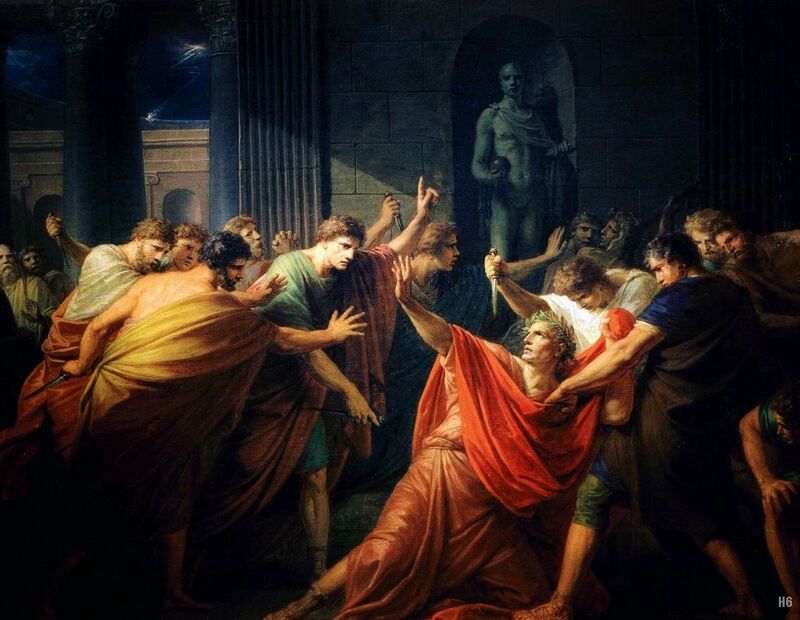 Cosmas Damian Winter died of tuberculosis on 18 November 1813. The following entry in the municipal death register is the only source known so far that documents his place of birth. Winter Mr. Cosmas Damian, stage manager at the Theater an der Wien, married, born in Mainz in the Reich. Inspected to have died of tuberculosis in the theater building No. 26 on the Laimgrube, aged 52 years. Winter died a pauper. A note in his Sperrs-Relation reads: "Assets: none. The deceased has been buried with borrowed money". Winter left three children, aged 13, 10 and 5 years for whom the widow proposed the actor Matthäus Stegmayr as guardian. Stegmayr's own probate file, however, proves that he had rejected this appointment (A-Wsa, Mag. 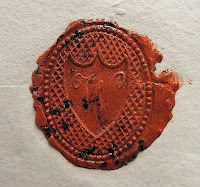 ZG, A2, 795/1820). Johann Philipp Göttinger, in whose care Winter's eldest son Ignaz Winter had been entrusted, was employed as Kapellmeister and schoolteacher at Baron von Braun's cotton spinning mill in Schönau. In December 1815, probably right after Eleonore Winter's death, Göttinger hurriedly fled to Italy from his creditors. 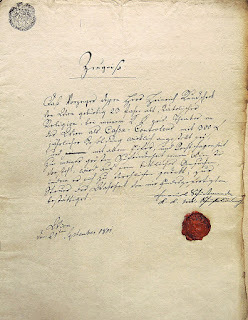 On 29 December 1815 Göttinger's estate was legally declared bankrupt by the dominion of Schönau and the verdict was published as "Konkurs der Gläubiger" (convocation of creditors) on 11 January 1816 in the Wiener Zeitung. It is not known if Göttinger ever returned to Vienna. 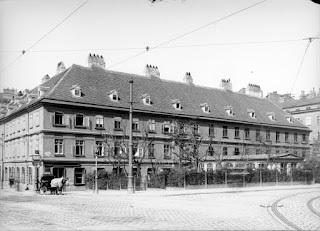 At the time of their mother's death, Eleonora Winter and her brother Joseph were staying at Leopold Grünsteidl's house Leopoldstadt 212 (today Karmelitergasse 2). Nothing is known so far about the later fate of Eleonora Schikaneder's last goddaughter. But in the course of my research on Haydn's godchildren, experience has taught me that, at some point of time, she will surely cross my path again in some archival document. Mein stärkerer Wille mag daher das schwächere Vermögen ersetzen, und ich weiß Ihnen keinen besseren Beweis meines innigsten Gefühles vorzulegen, als meine reine Absicht, und die Vorsorge, durch die eigene Herausgabe meines unverfälschten Lebenslaufes dem Betruge vorzubeugen, und dadurch zu verhindern, daß nicht dereinst Stümper und Speculations=Genies einige aufgeraffte Anecdoten, oder wohl gar selbst erfundene Histörchen auf meine Rechnung zusammen tragen, und unter dem fälschlichen Gemählde meiner seyn sollenden Biographie die Welt hintergehen und meine Freunde sowohl, als auch alle diejenigen, denen ich als Schauspiel=Director nicht ganz gleichgültig war, durch diesen Kunstgriff zu prellen suchen. My stronger will, therefore, may replace the weaker capability, and I know of no stronger proof of offering my innermost sentiment, than my pure intention to forestall deception with the publication of my undistorted biography, and thereby prevent it from ever occurring that, some day, bunglers and geniuses of speculation collect some anecdotes, or perhaps even invented stories on my account, and deceive the world under the fake pretense of my alleged biography, and, by this stratagem, try to dupe my friends, as well as all those who were not indifferent to my work as theater director. Baur, Eva Gesine. 2012. Emanuel Schikaneder. Der Mann für Mozart. Munich: C. H. Beck. Blümml, Emil Karl. 1923. Aus Mozarts Familien und Freundeskreis. Wien Prag Leipzig: Ed. Strache. Blümml & Gugitz. 1925. Alt-Wiener Thespiskarren. Vienna: A. Schroll & Co.
Boisits, Barbara. Art. "Gerl, Familie", in: Oesterreichisches Musiklexikon online, Zugriff: 21.5.2017. Buch, David J. 1997. "Mozart and the Theater auf der Wieden: New Attributions and Perspectives". Cambridge Opera Journal, Vol. 9, No. 3 (Nov., 1997), 195-232. –––––––. 2000. "Eighteenth-Century Performing Materials from the Archive of the Theater an der Wien and Mozart's 'Die Zauberflöte'". The Musical Quarterly, Vol. 84, No. 2 (Summer, 2000), 287-322. –––––––. 2004. "A Newly-Discovered Manuscript of Mozart's Die Zauberflöte from the Copy Shop of Emanuel Schikaneder's Theater auf der Wieden". Studia Musicologica Academiae Scientiarum Hungaricae, T. 45, Fasc. 3/4 (2004), 269-279. –––––––. 2006. "The House Composers of the Theater auf der Wieden in the Time of Mozart (1789-91)". Min-Ad Israeli Studies in Musicology Online 2006/2. Edge, Dexter. 1992. "Mozart's Viennese Orchestras". Early Music, Vol. 20, No. 1, Performing Mozart's Music II. (Feb., 1992), 64-88. –––––––. 2001. Mozart’s Viennese Copyists. PhD diss., University of Southern California. –––––––. 2016. Joachim Perinet and "Mozarts Fortepiano", in: Mozart: New Documents, edited by Dexter Edge and David Black, first published 28 Sep 2016, accessed 28 Sep 2016. 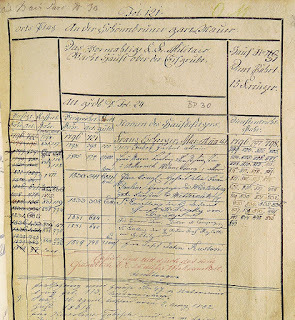 Genealogisches Handbuch des Adels. Band 12, Adelige Häuser B Band II, C. A. Starke Verlag, Glücksburg/Ostsee, 1956, 118-20. Gugitz, Gustav. 1904. "Joachim Perinet." In: Jahrbuch der Grillparzer-Gesellschaft, vol. 14, 170–223. Harrandt, Andrea. "Henneberg (Henneberger), Johann Baptist‟, in: Oesterreichisches Musiklexikon online, Zugriff: 2.7.2017. Hofbauer, Karl. 1864. Die Wieden mit den Edelsitzen Conradswerd, Mühlfeld, Schaumburgerhof und dem Freigrunde Hungerbrunn: historisch-topographische Skizzen aur Schilderung der Vorstädte Wiens. Vienna: Karl Gorischek. Komorzynski, Egon von. 1949. "Wer war der erste Sarastro?". Österreichische Musikzeitschrift, Vienna 1949, 201-202. ––––––––. 1955. "Johann Baptist Henneberg, Schikaneders Kapellmeister (1768–1822). Mozart-Jahrbuch, 243-45. Lorenz, Michael. 2008. "Neue Forschungsergebnisse zum Theater auf der Wieden und Emanuel Schikaneder", Wiener Geschichtsblätter 4/2008, Verein für Geschichte der Stadt Wien, 15-36. ––––––––. 2009 and 2010. "Mozart's Apartment on the Alsergrund". Published on the Internet on 8 Jun 2009, and in print in: Newsletter of the Mozart Society of America, Vol. XIV, No. 2, (27 August 2010)..
––––––––. 2013. Das Forschungsprojekt "W. A. Mozart und sein Wiener Umfeld": Mozartforschung in Wien am Beginn des 21. Jahrhunderts. Internet publication, 20 Oct 2013. Mansfeld, Herbert A. 1960. "Mozarts erste Papagena war …..? (Ein Beitrag zur Wiener Theatergeschichte)“. 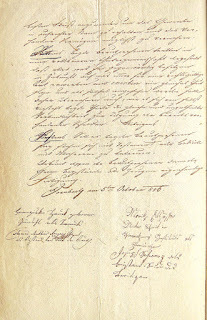 Wiener Geschichtsblätter 15, Verein für Geschichte der Stadt Wien, Vienna, 110-14. Messner, Robert. 1975. Die Wieden im Vormärz: historisch-topographische Darstellung d. südwestl. Vorstädte u. Vororte Wiens auf Grund d. Katastralvermessung. Vienna: Verb. d. Wissenschaftl. Gesellschaften Österreichs. Mettenleiter, Dominicus. 1866. Musikgeschichte der Stadt Regensburg. Regensburg: Bössenecker. ––––––––. 1957. "Neue Gerliana". Mozart-Jahrbuch 1957, 212-22. Pisarowitz, Karl Maria. 1963. "Ein Brief 'Sarastros' : und sonstige neueste Gerl-Miszellen". Acta Mozartiana. Augsburg, 1963, 38-42. Przawerczek, Andreas. 1831. "Herr Emanuel Schikaneder. (Aus den Papieren eines verstorbenen Fagotisten.)". In: Der Gesellschafter oder Blätter für Geist und Herz, 5tes bis 8tes Blatt, Januar 1831. Schurig, Arthur. 1922. Constanze Mozart. 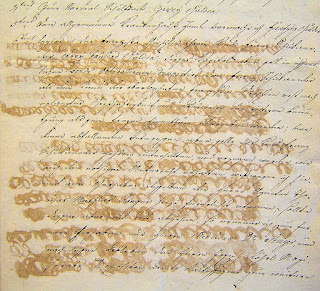 Briefe - Aufzeichnungen - Dokumente, 1782-1842. Dresden: Opal. For providing important information during my research I'm grateful to Ian Allan, Peter Prokop, Ted Albrecht, and Heinz Hampel-Waffenthal. © Dr. Michael Lorenz 2018.